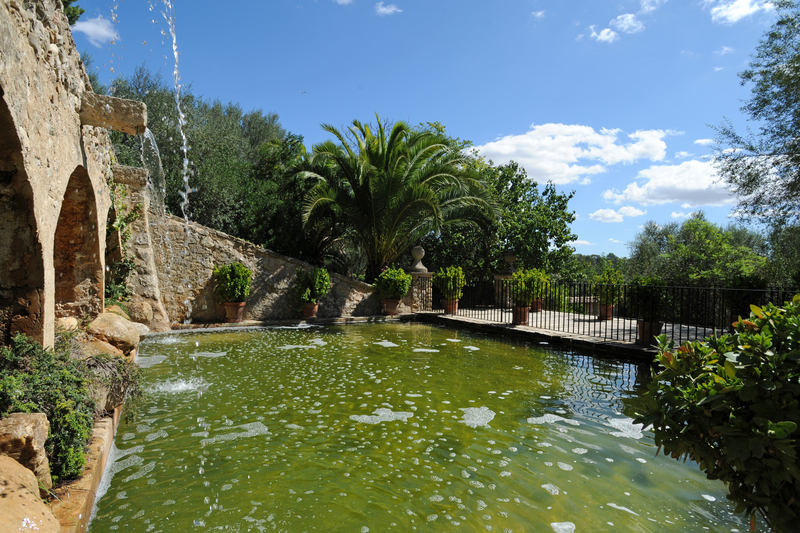 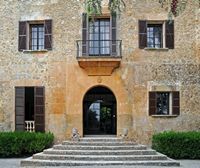 The domain of Els Calderers is an eighteenth century Majorcan finca which includes, besides a mansion with 20 rooms, 156 acres of fields, several outbuildings, stables, barns and corrals with the native animals Mallorca. 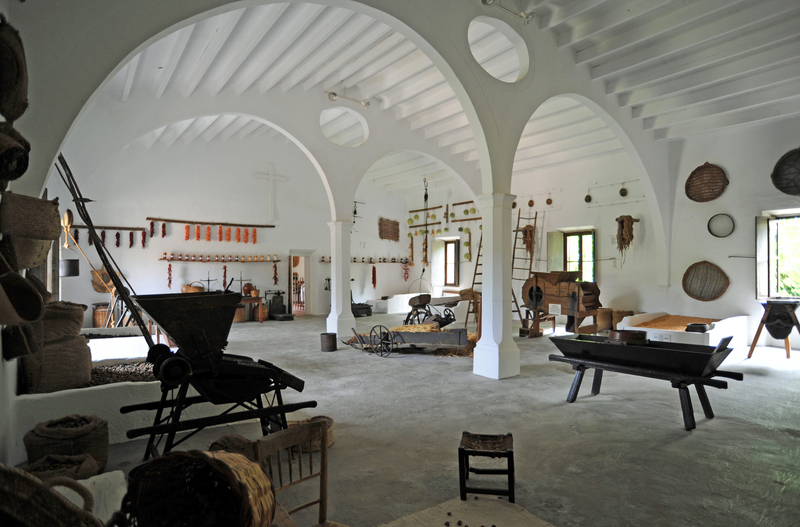 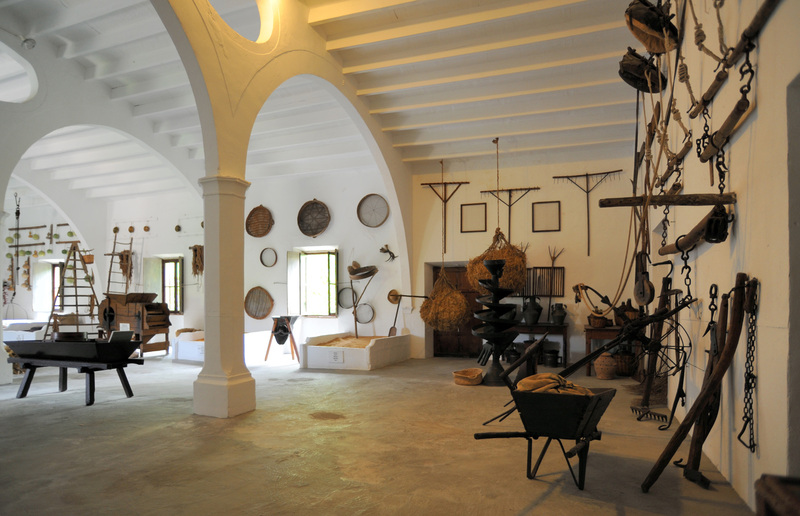 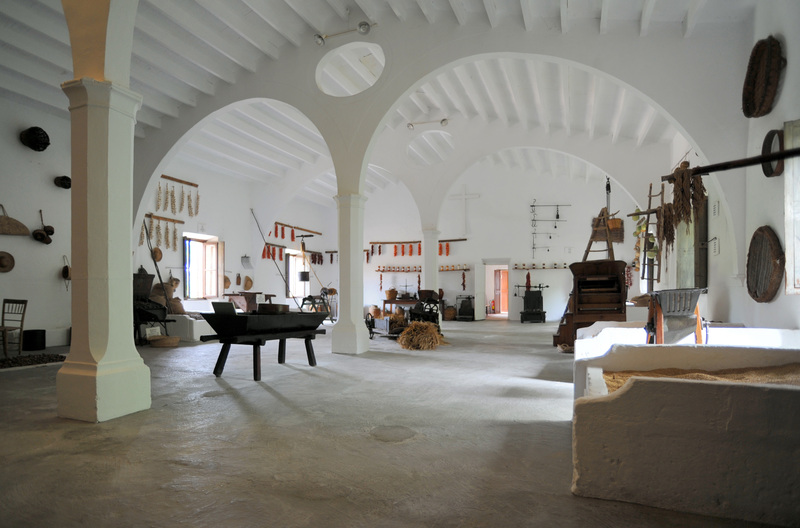 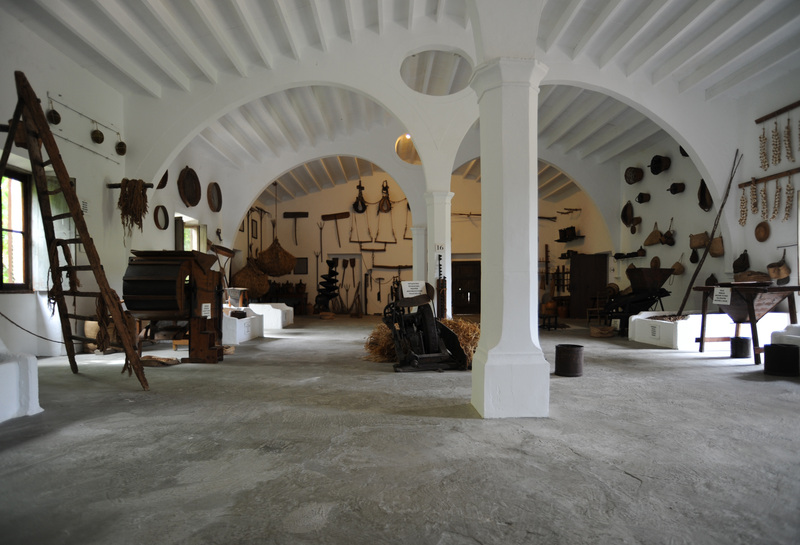 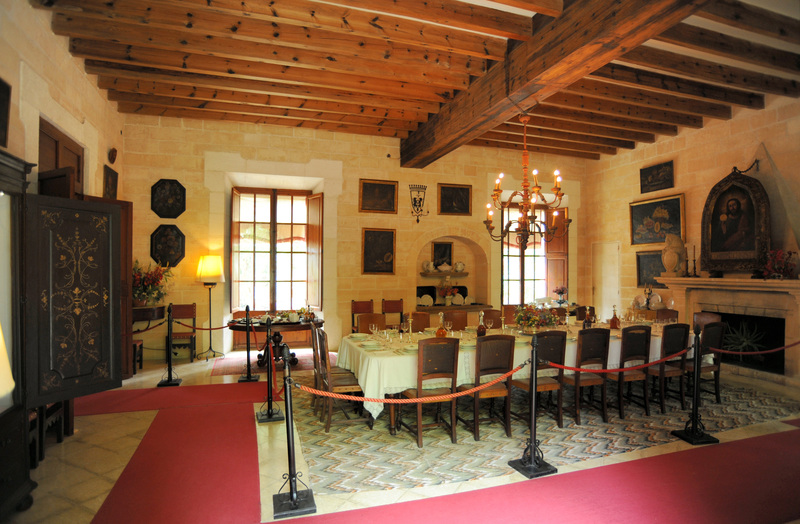 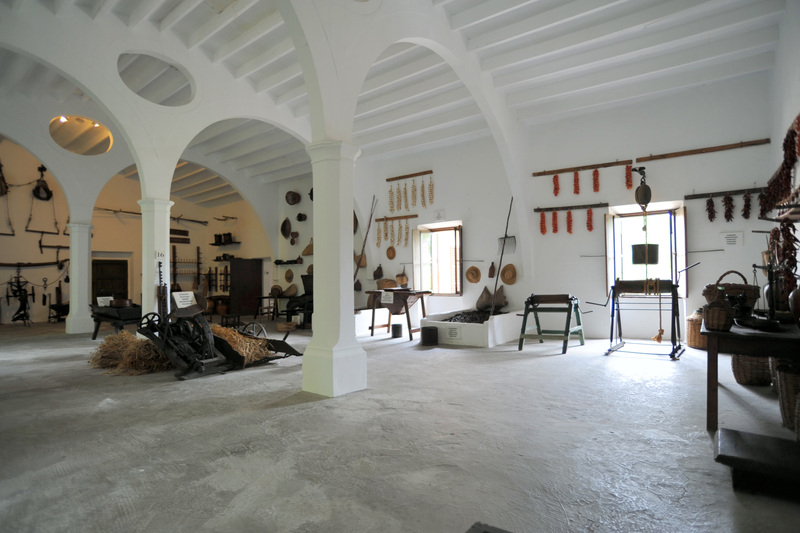 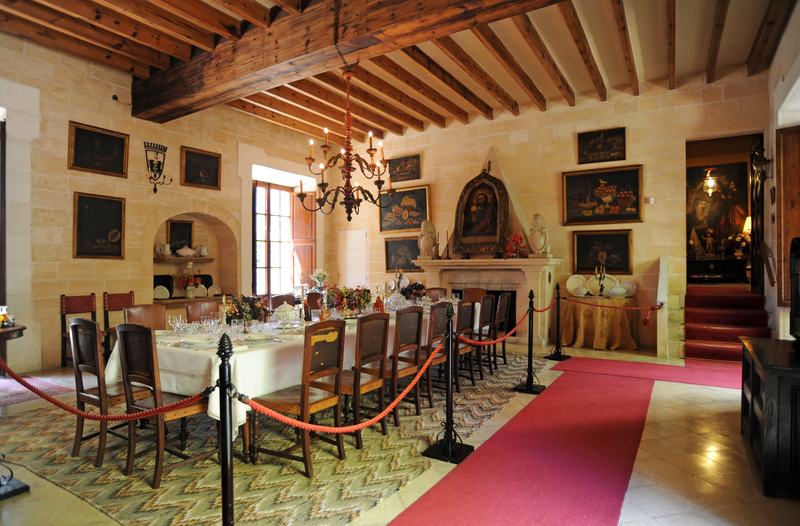 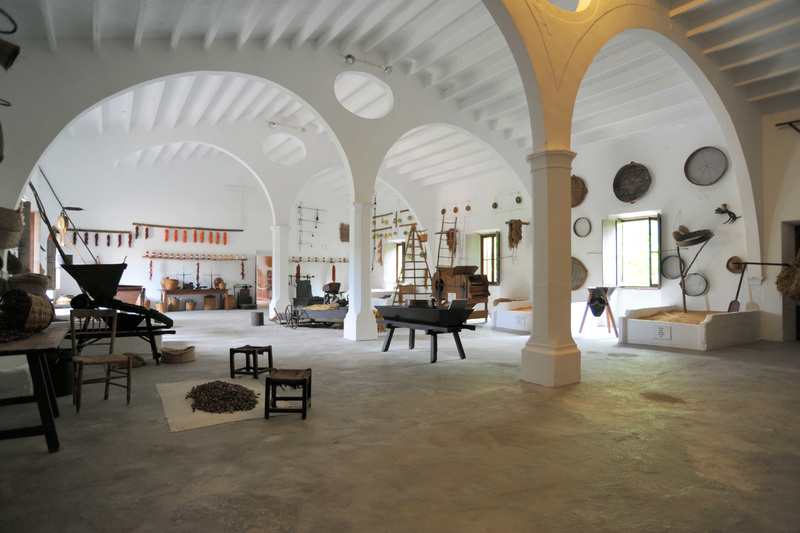 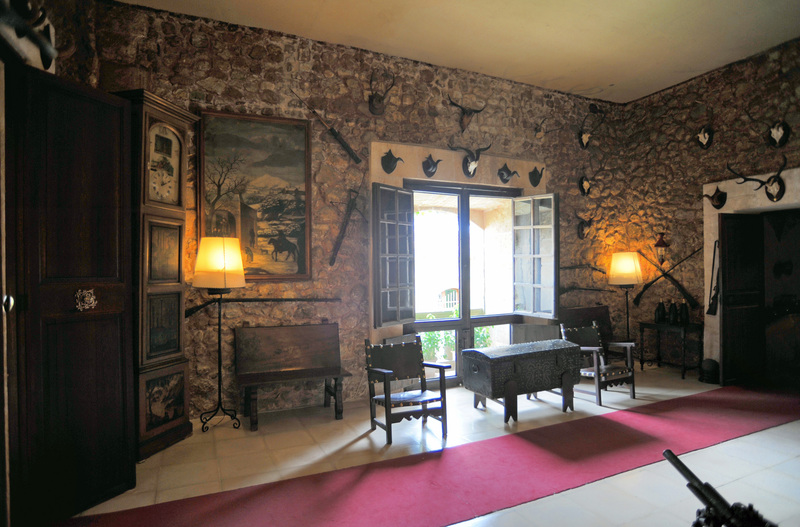 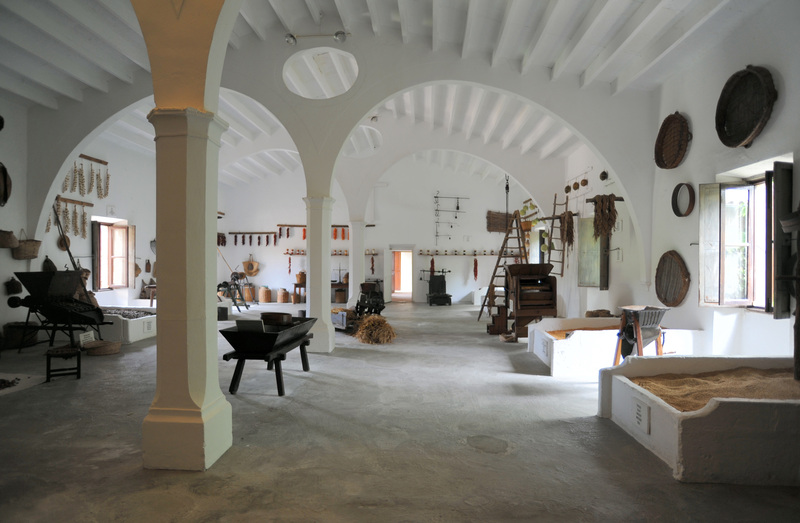 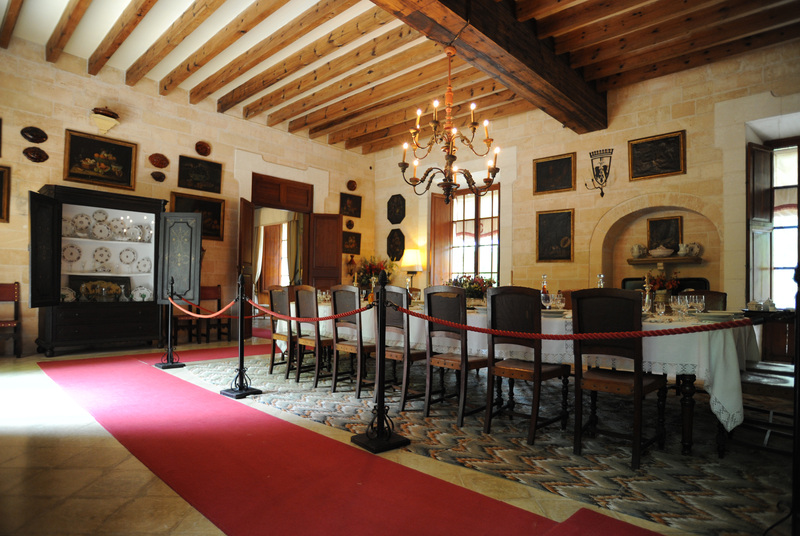 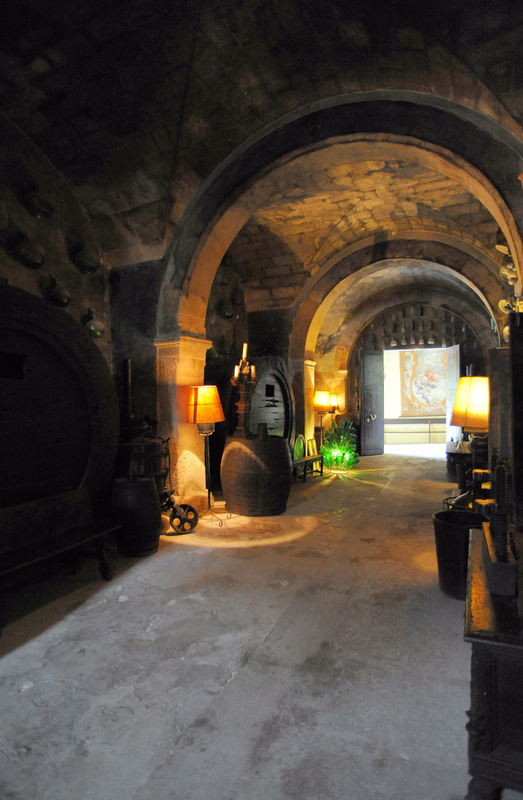 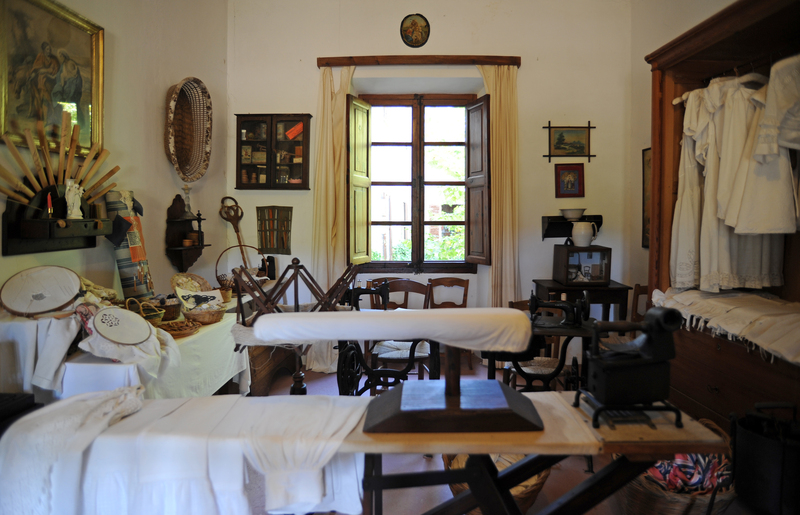 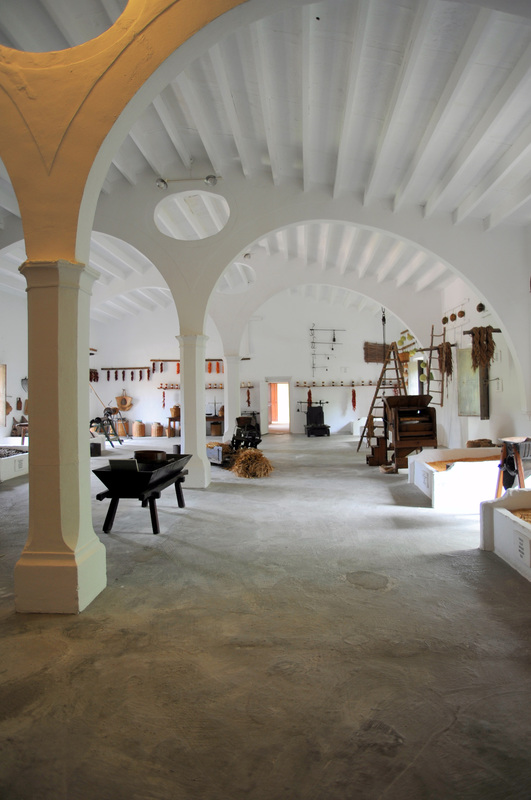 Els Calderers was transformed into a private museum belonging to the family of Juan de Sentmenat. 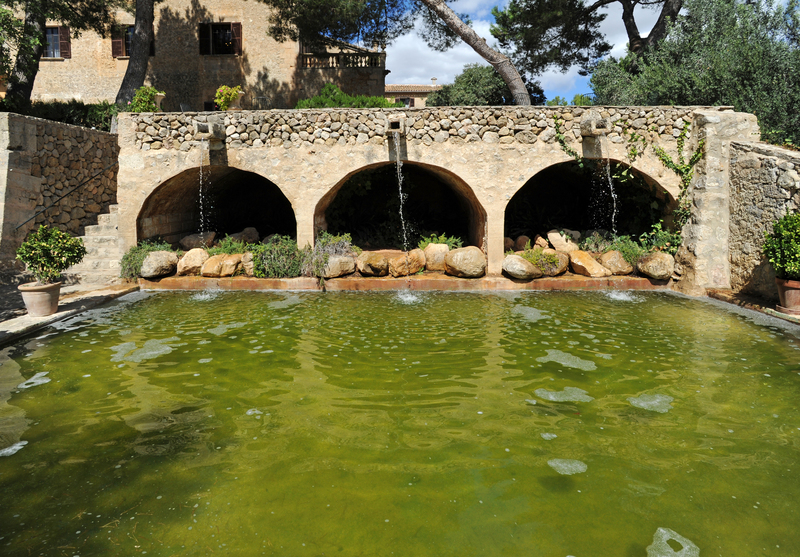 The domain of Els Calderers is named after the first owner of the family land, the Calderer family, whose name means "tinkmen". 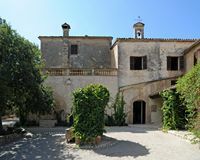 The area of Els Calderers is one kilometer from the hermitage of Puig de Bonany in the plain (Es Pla) from the center of the island of Majorca. 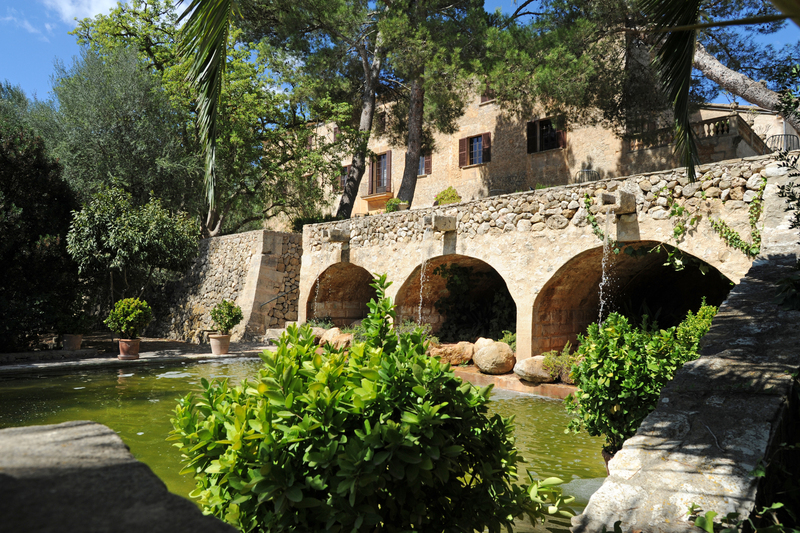 Els Calderers is located between the towns of Sant Joan and Vilafranca de Bonany. 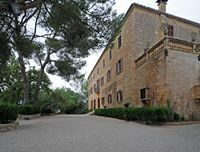 At kilometer 37 of the road that connects Ma-15 Palma to Manacor, turn left towards Sant Joan, 300 meters after the junction of the road to Sant Joan, is a small road on the right leads to the manor of Els Calderers after 3 km through the Majorcan countryside. 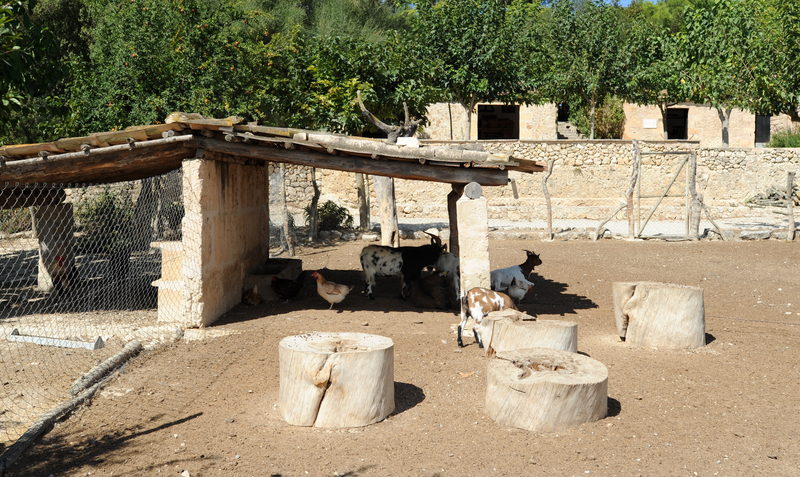 The area is a representative example of the Majorcan plain farm, which had up to 38 laborers. 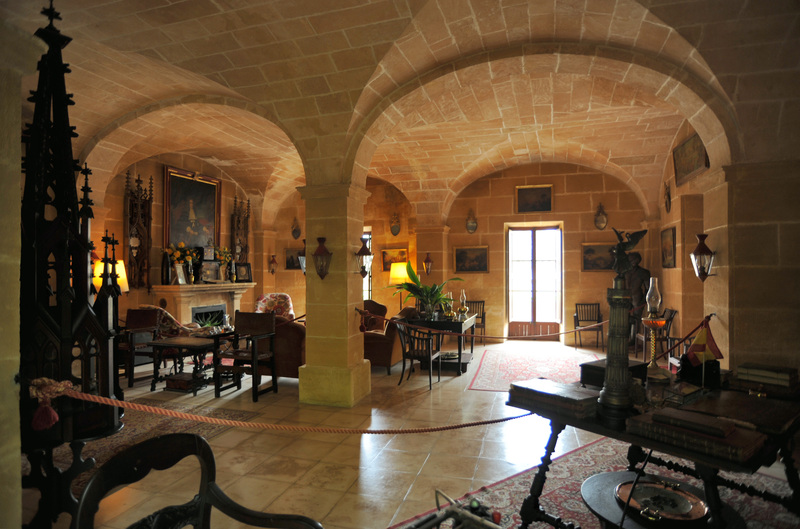 The whole area includes the main building of the mansion, barn, workshop, stables, paddocks and land. 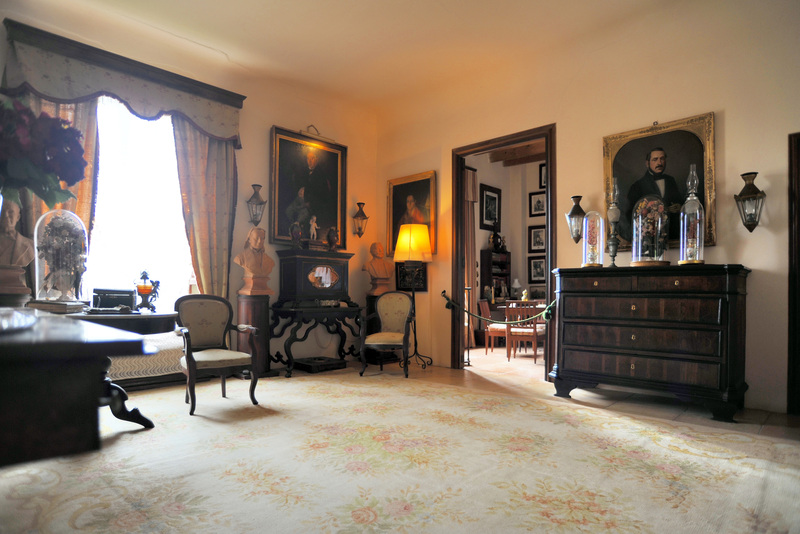 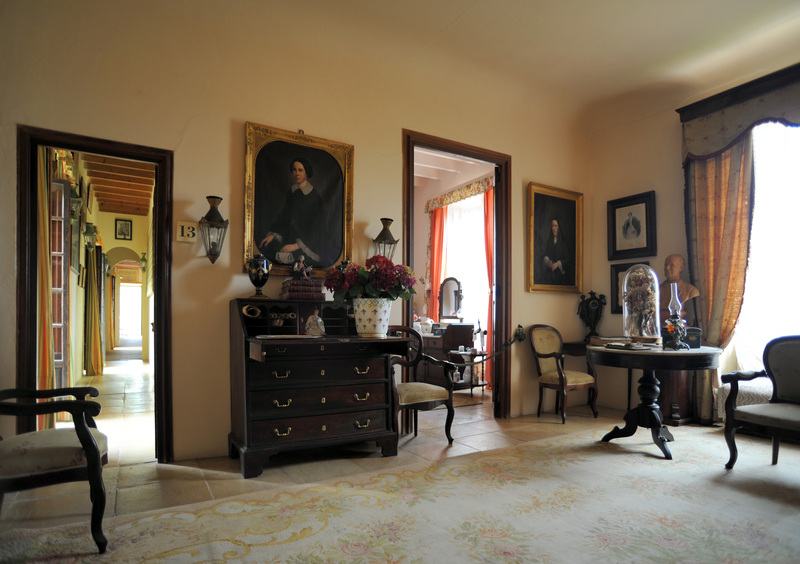 Most parts of the mansion, furnished with original furniture, can be visited. 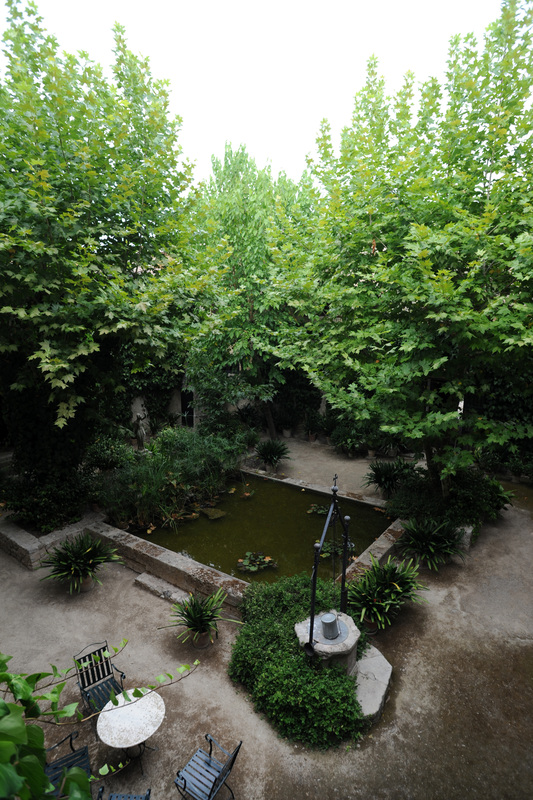 In the courtyard of the main building is the well of a cistern (cisterna), the fresh water (agua fresquisima) was praised by the Archduke Louis Savior in his book "The Islands" (Die Balearen). 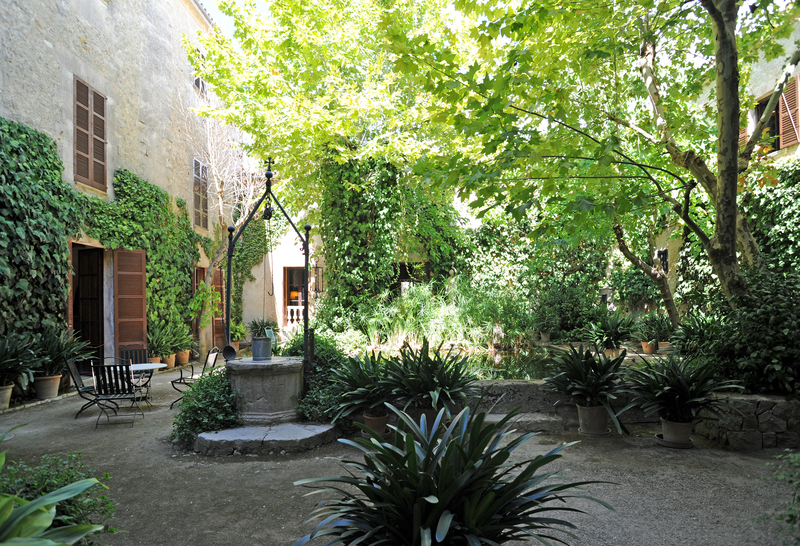 At the end of the courtyard to the right of the main building is housing the "manager." 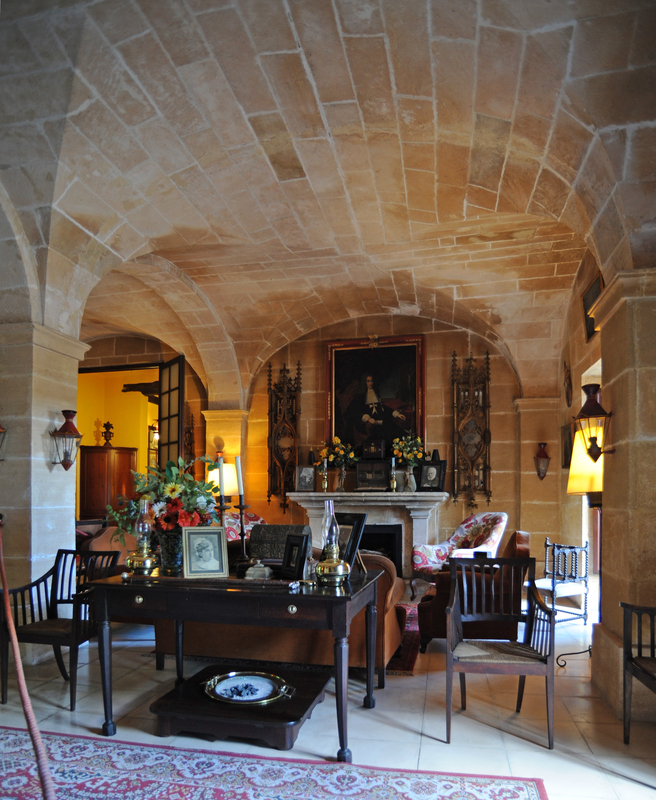 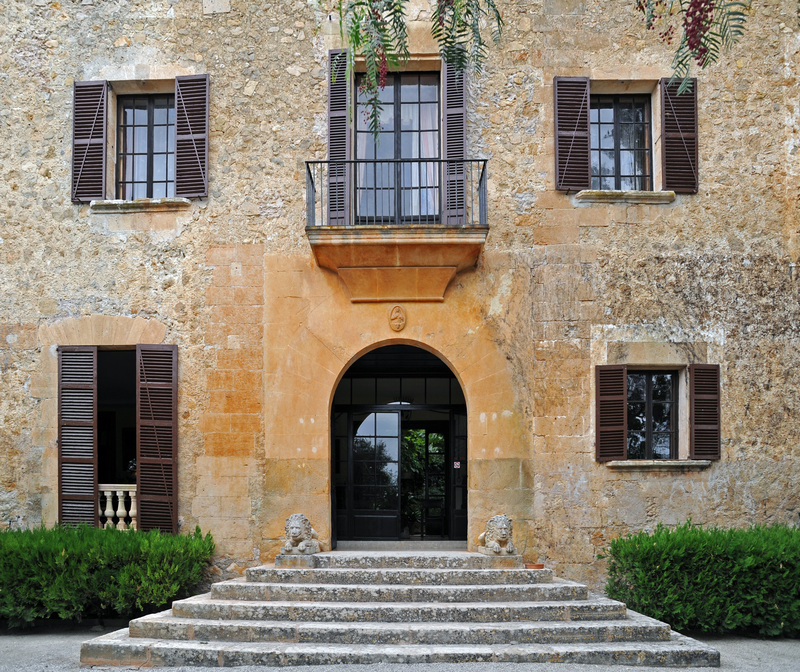 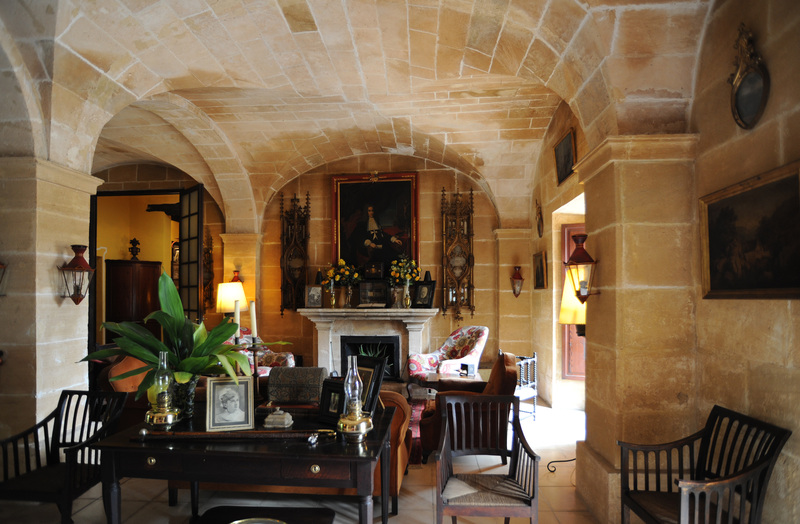 The mansion is a three-storey building of yellow limestone, sandstone de Mallorca, the "marès". 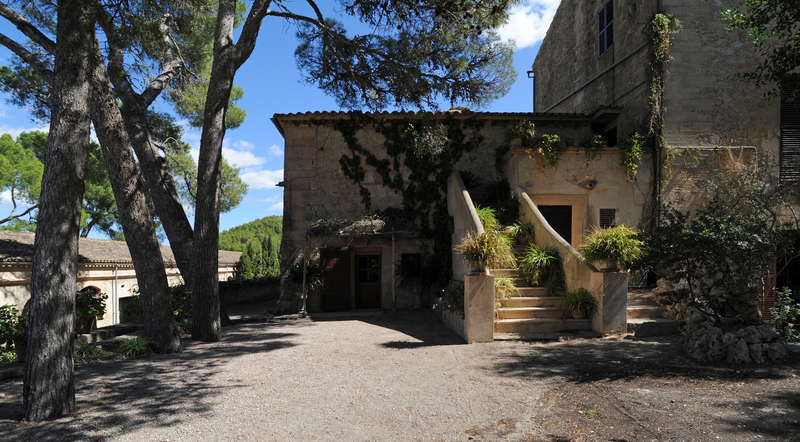 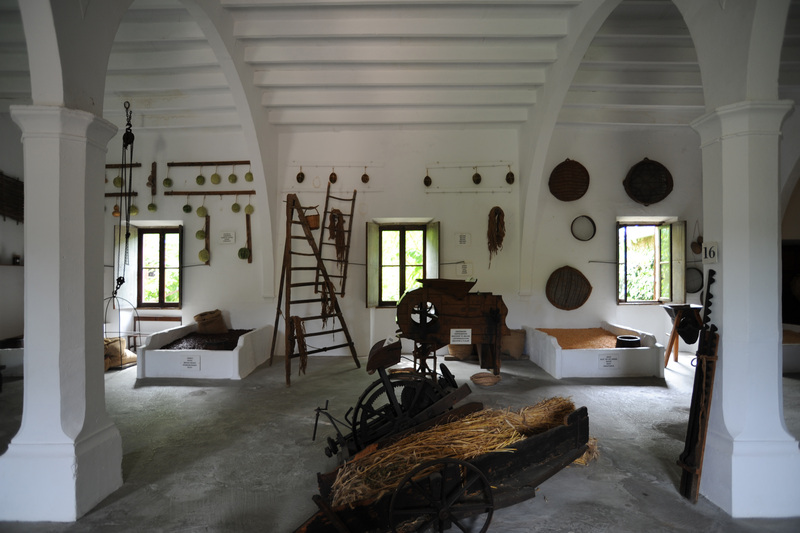 The building is considered a typical example of rustic Majorcan style "finca rustica". 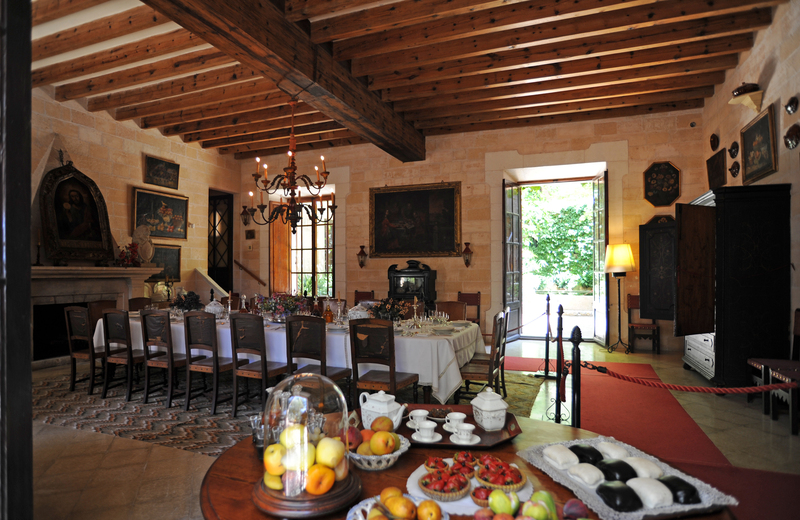 The manor of Els Calderers was built in the first half of the eighteenth century (1750), but has been renovated many times. 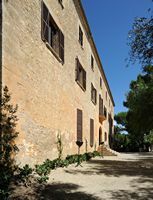 The simple main facade faces south-east, with the main wing, which is the home of the Masters, a height of three storeys. 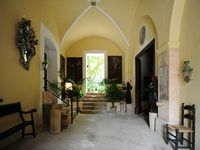 The porch with a door with arch opens above a staircase six steps, with two recumbent lions sculptures adorning the entrance. 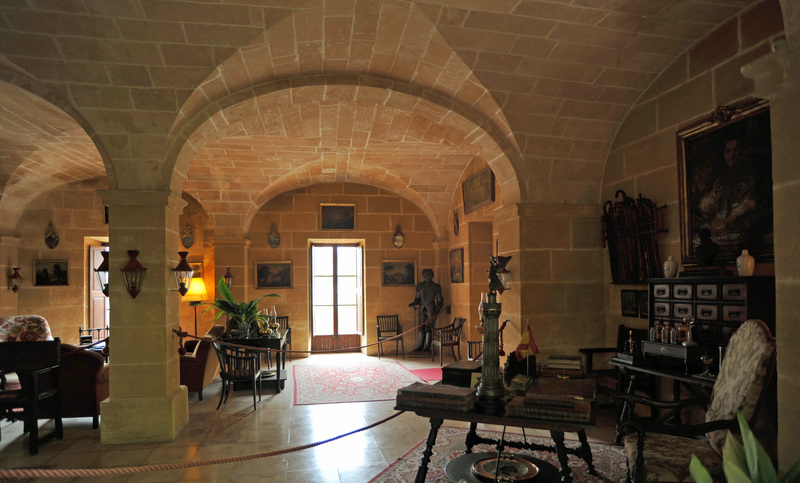 The keystone is a small medallion with a bas-relief of the Heart of Jesus and a seraph. 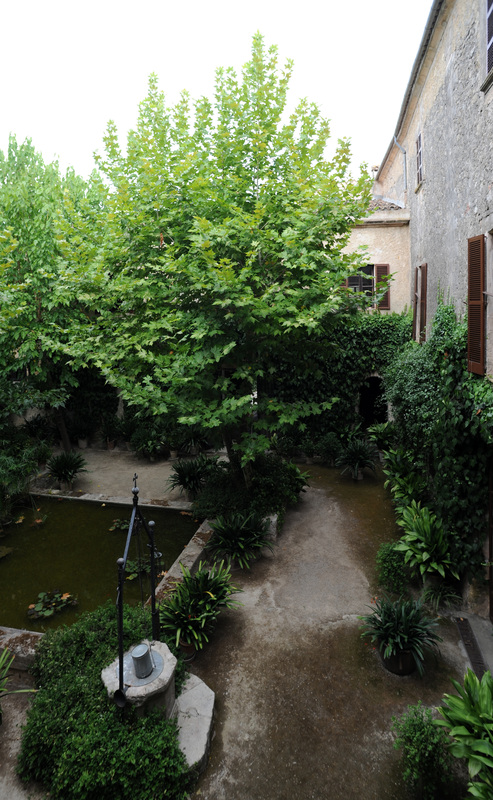 On the ground floor, to the left of the gate, there are two windows, while on the right there are three. 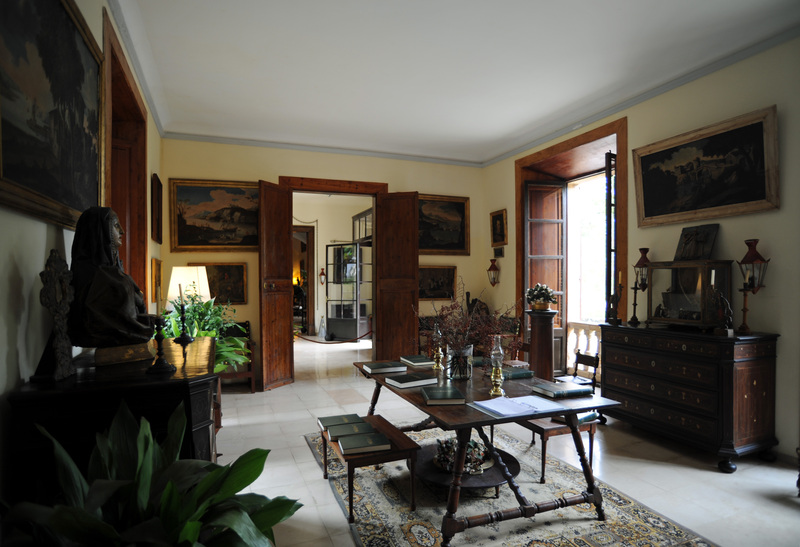 The upper two floors have seven windows on each floor, Third floor are smaller. 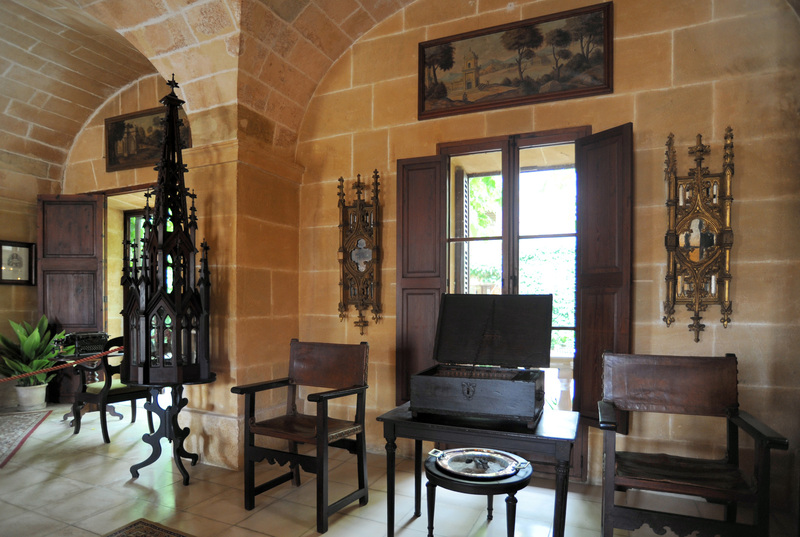 The outer door and the porch of the mansion opens into a vestibule, a square room that gives access to the lounge and the "cloister" (Sa Clastra). 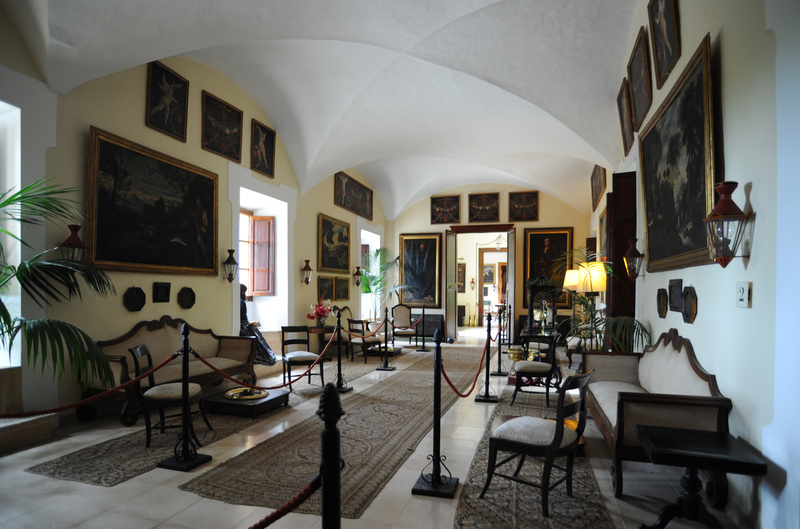 On the left wall is a portrait of Manuel de Sentmenat i Lanuza, viceroy of Majorca and died in Lima in 1710 and, right, a portrait of his son Joan Manuel de Sentmenat (1688-1755). 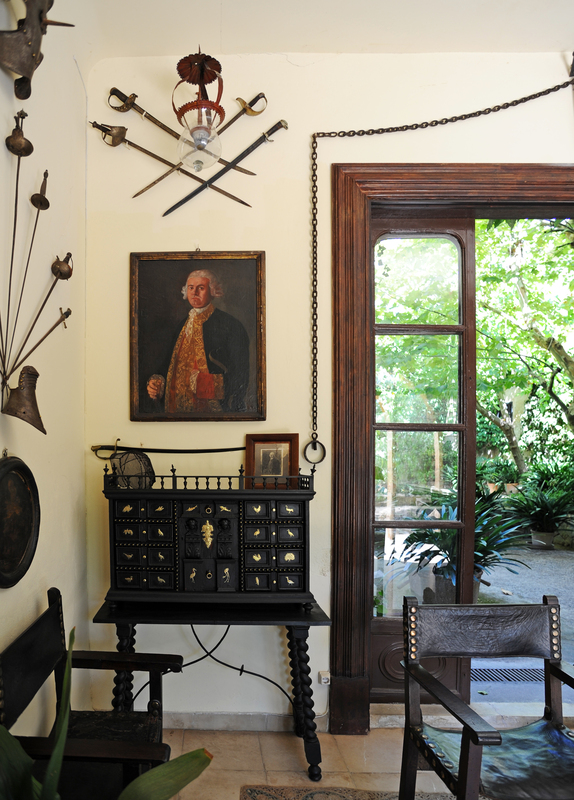 Under the portrait is a chest containing items belonging to Captain Antoni Barceló i Pont de la Terra (eighteenth century). 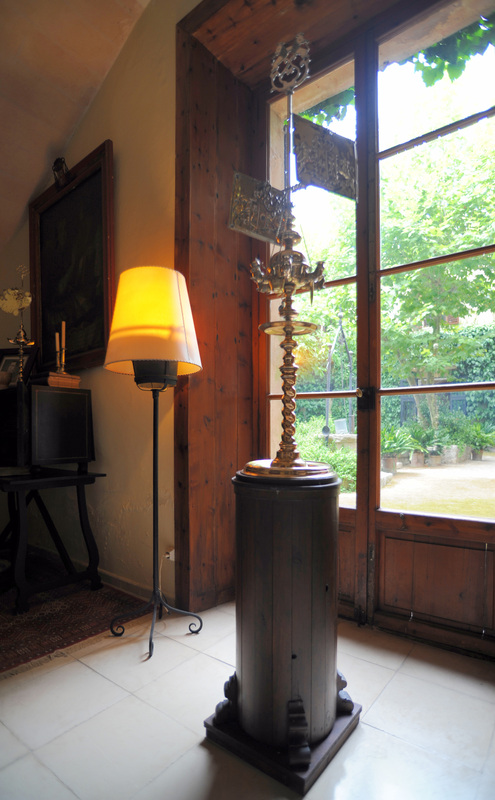 Facing the porch, over the access to the patio door window, is the shield wrought iron in the line of Juan de Sentmenat (two lions and a lance of the Juan, and the three wings of the Sentmenat). 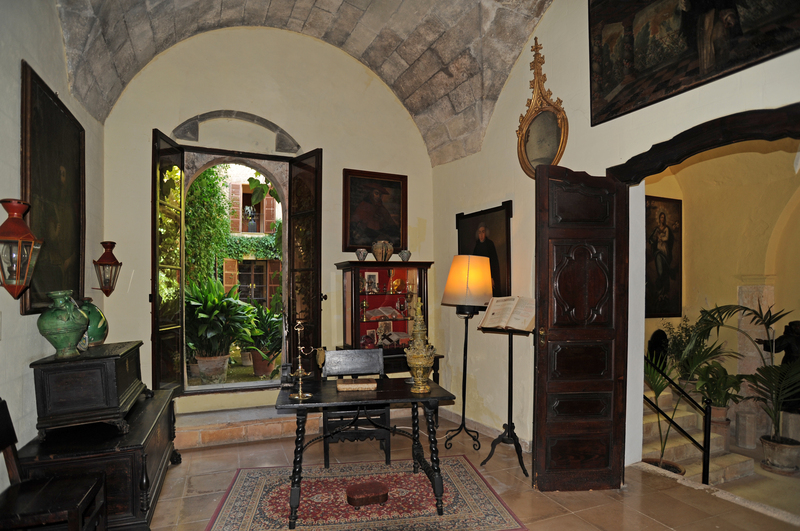 From the vestibule, you enter the "cloister" (Sa Clastra), which is actually a patio, a patio door. 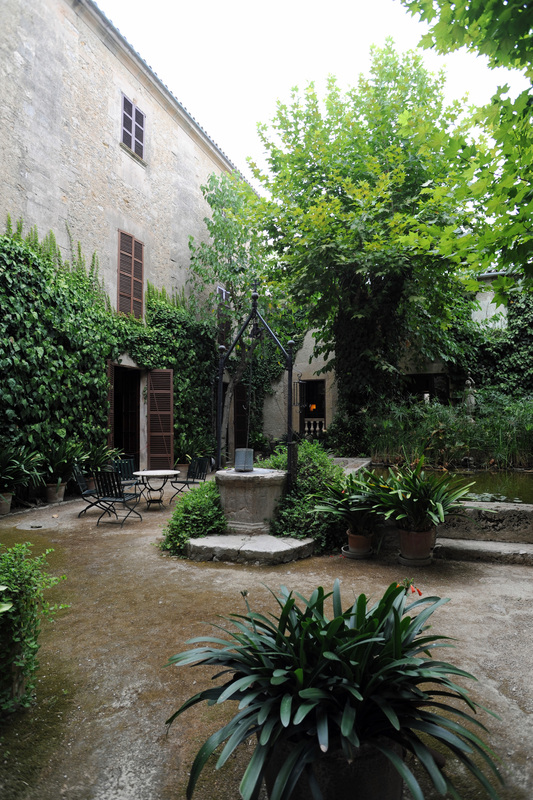 The patio has a well tank octagonal, with a wrought iron arch surmounted by a cross. 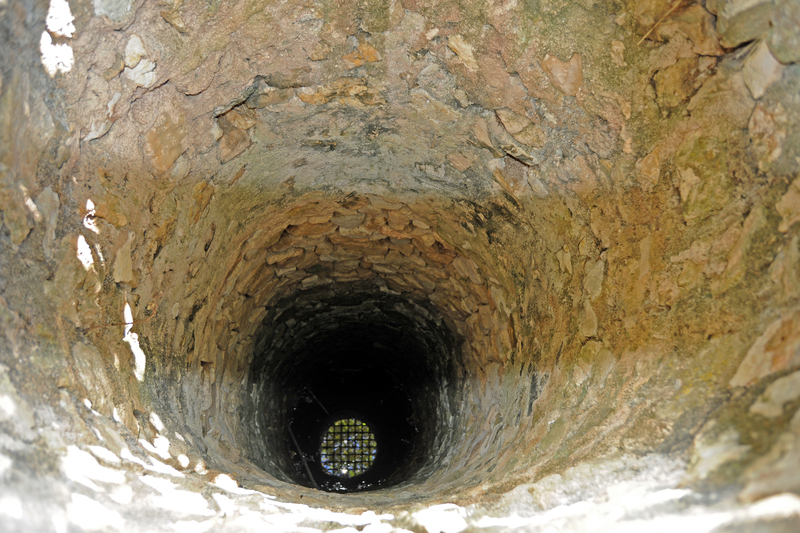 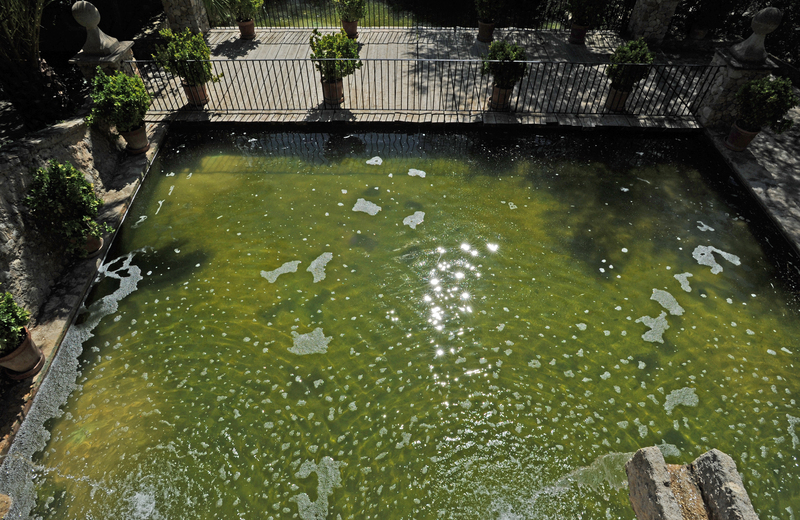 Water from the tank, the Archduke Luis Salvador said in his book "Die Balearen" it was "freshissime" (agua fresquísima). 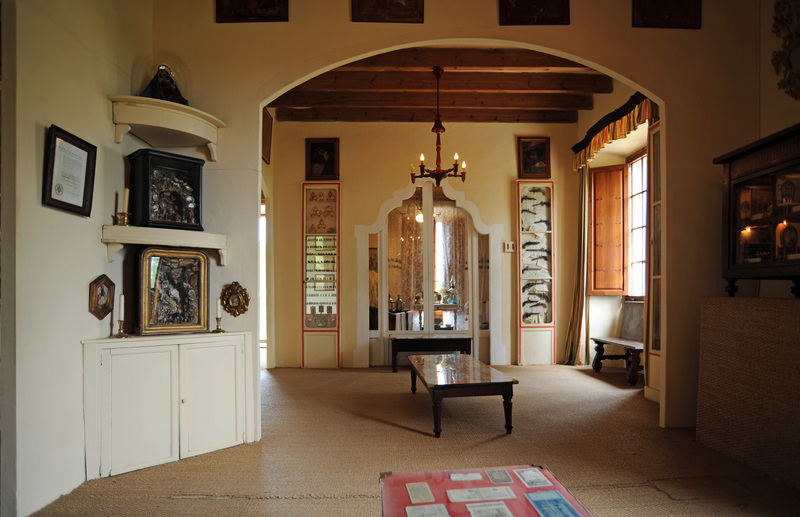 We also note a sundial on the south facing wall. 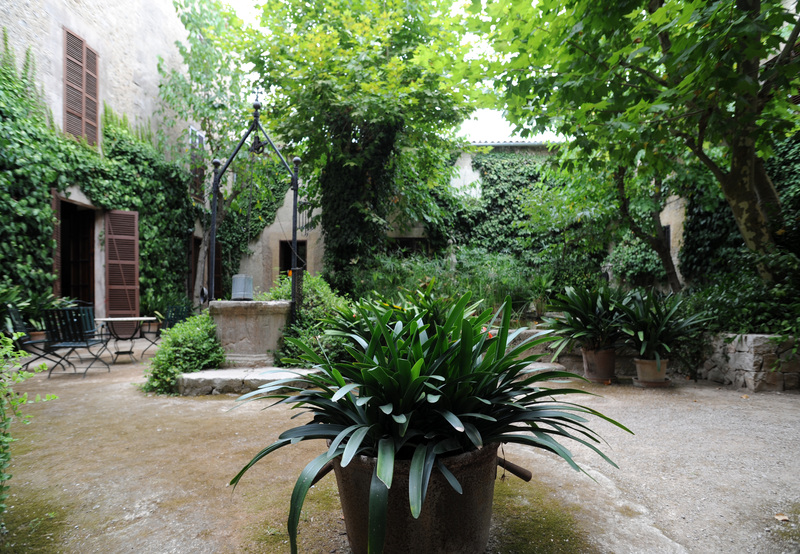 The patio also has a pool in the center, surrounded by banana trees, mulberry, ivy, of clivias and other plants. 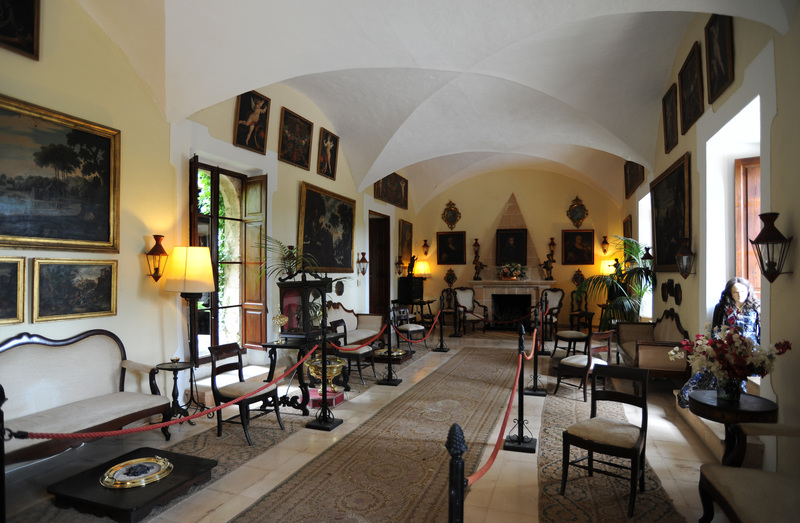 To the right of the hallway there is a large rectangular room covered with a ceiling of three sections vault: the show was for receiving guests. 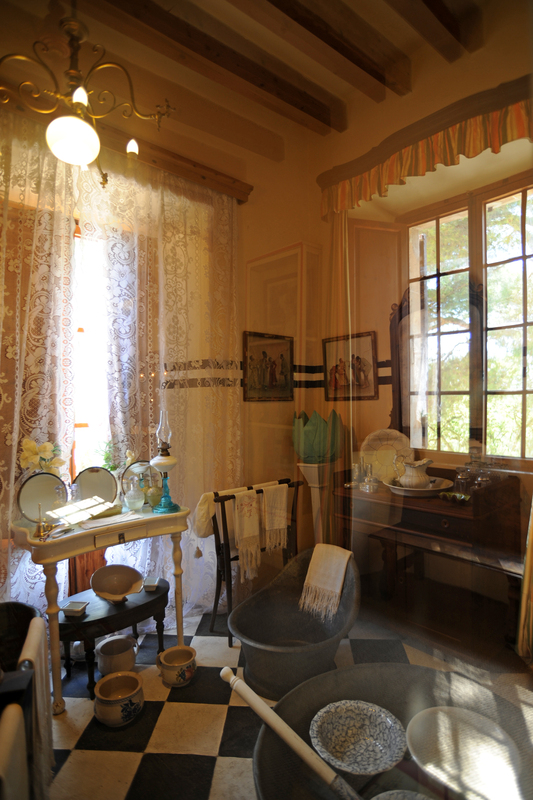 Each section of the exhibition includes a window, at the foot of the three windows are three typical benches. 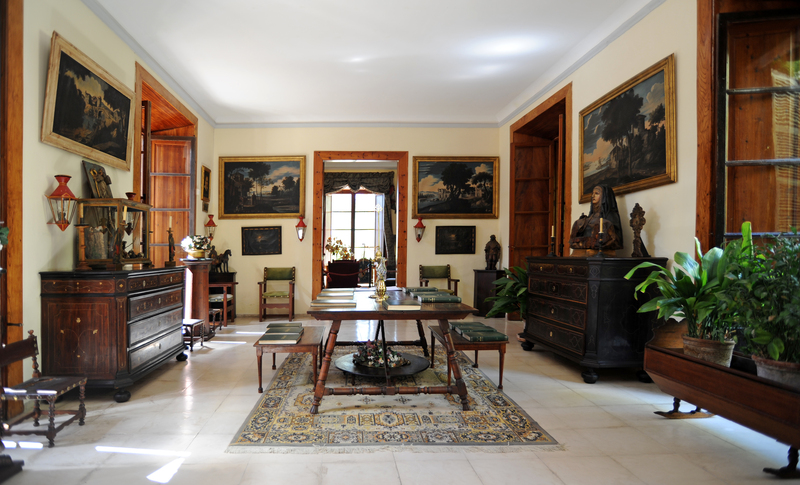 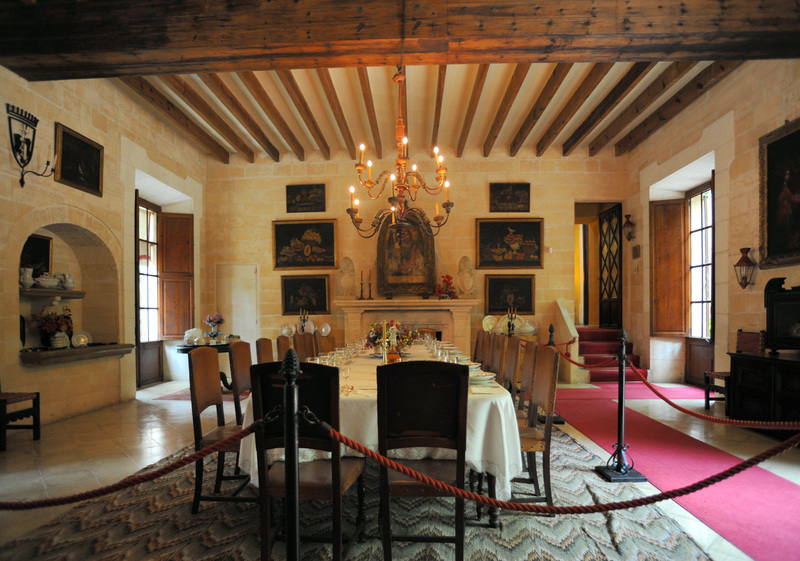 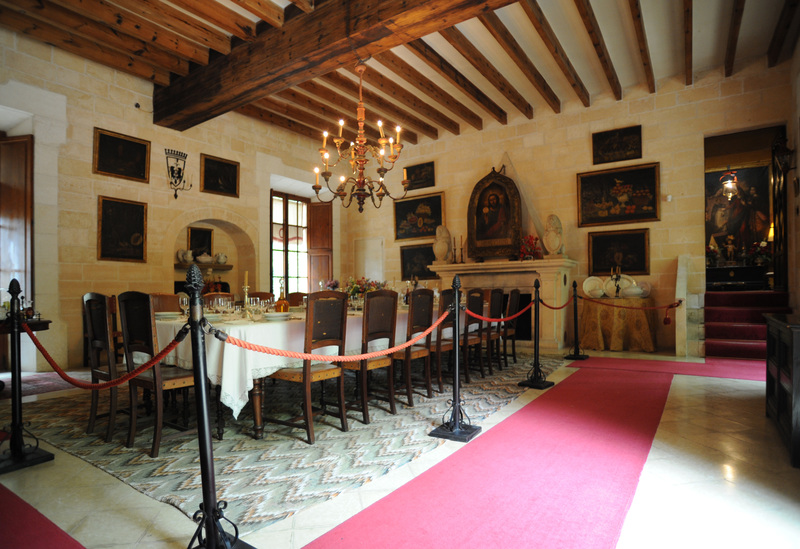 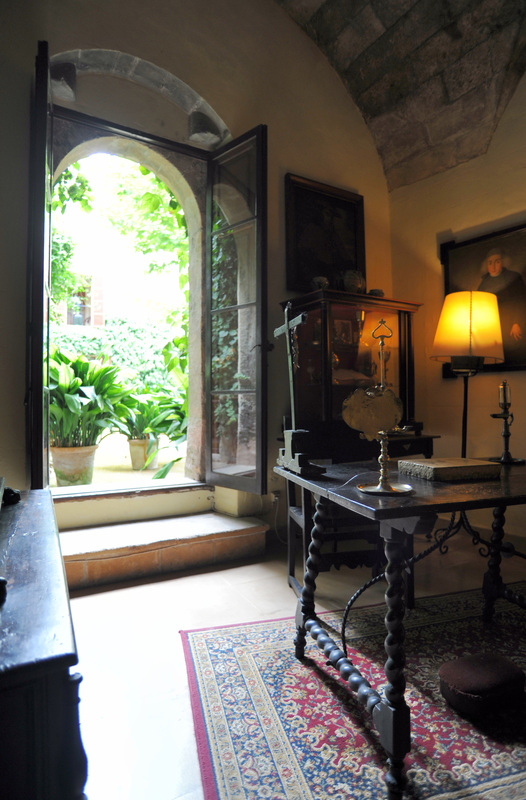 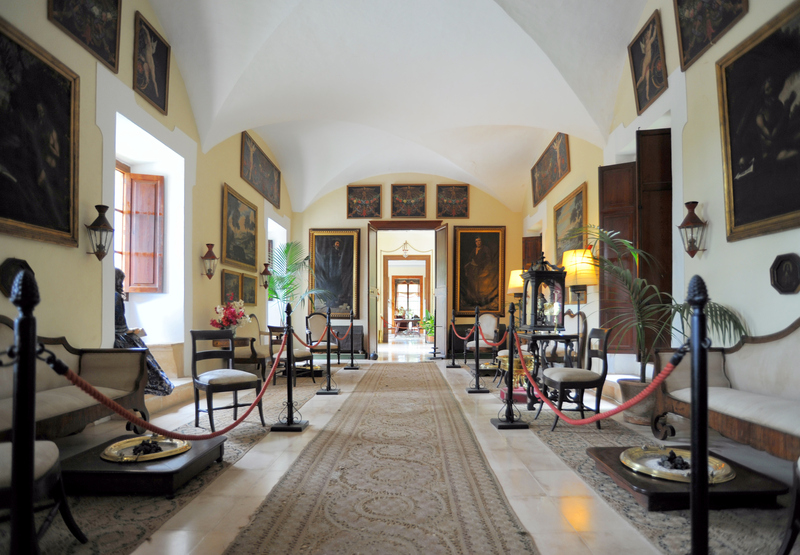 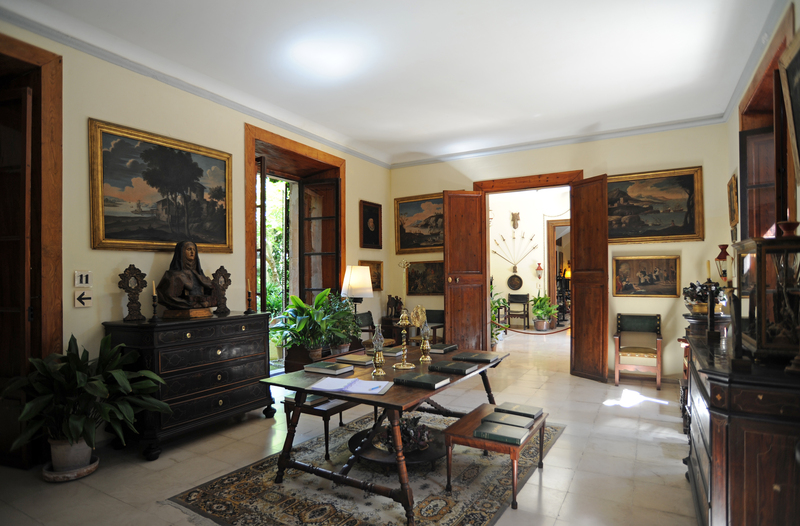 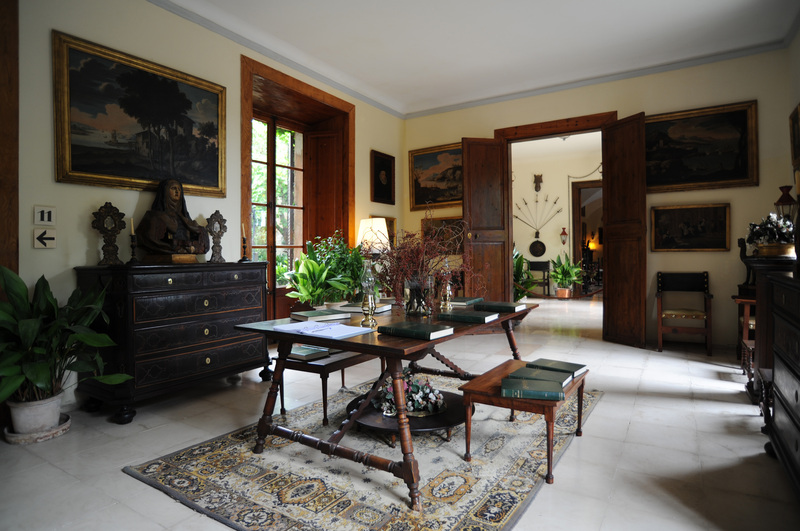 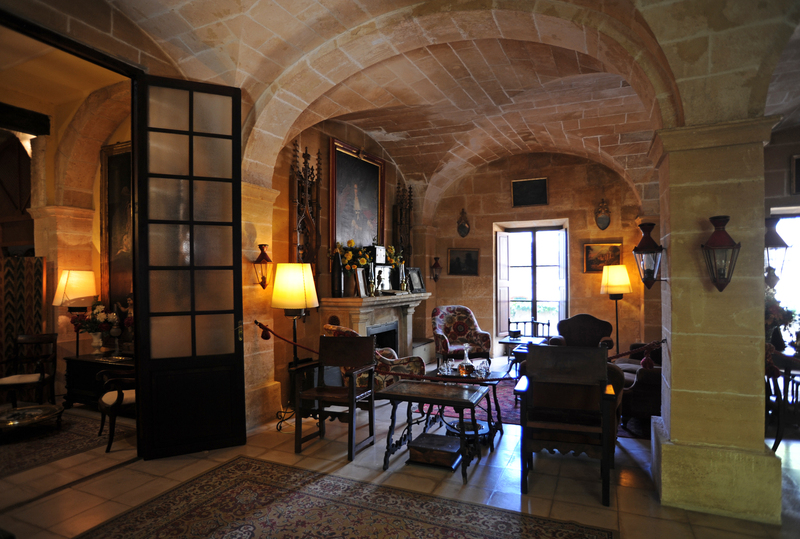 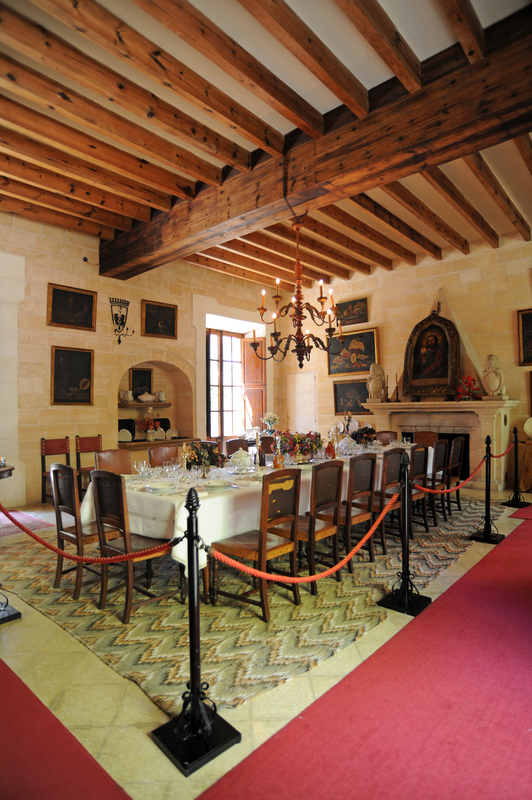 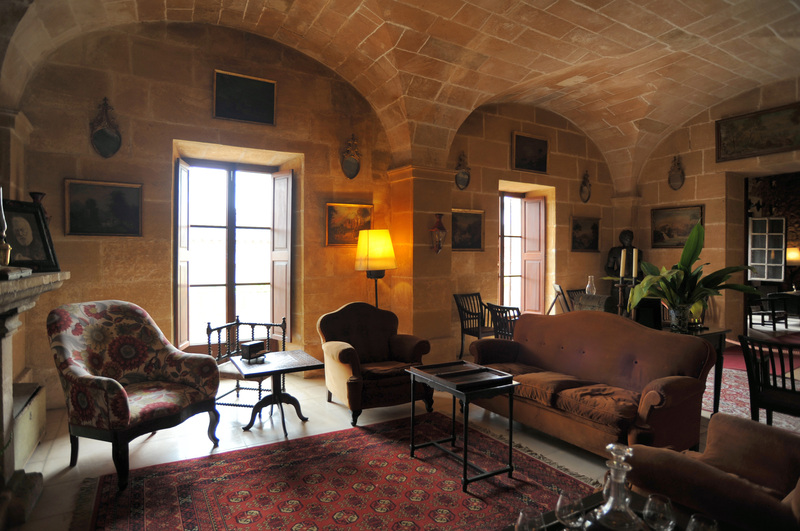 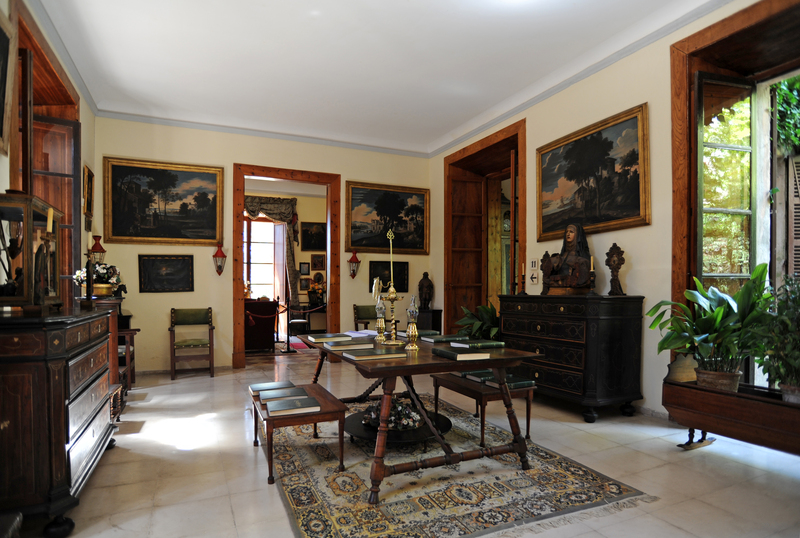 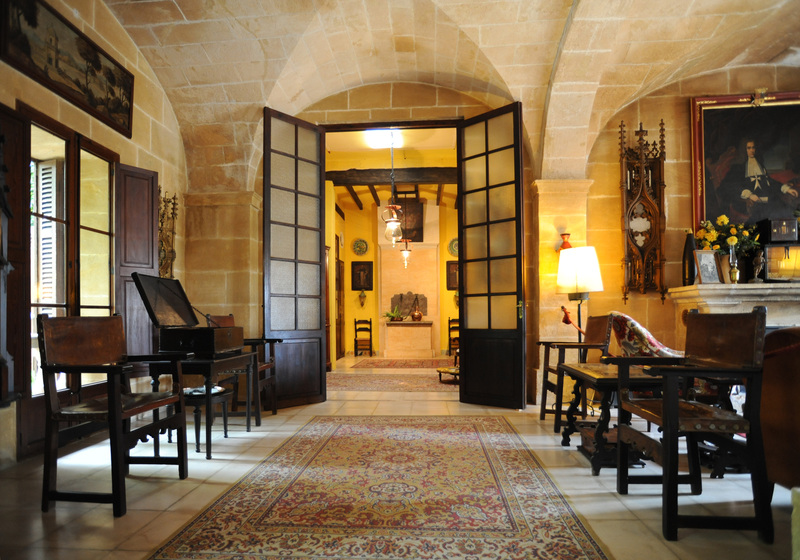 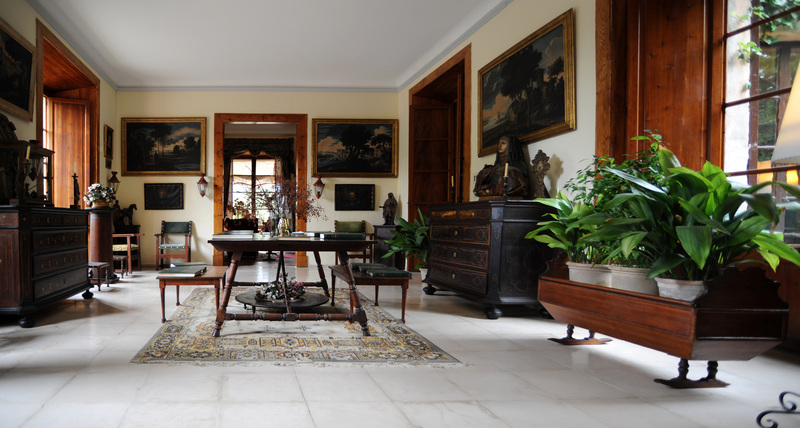 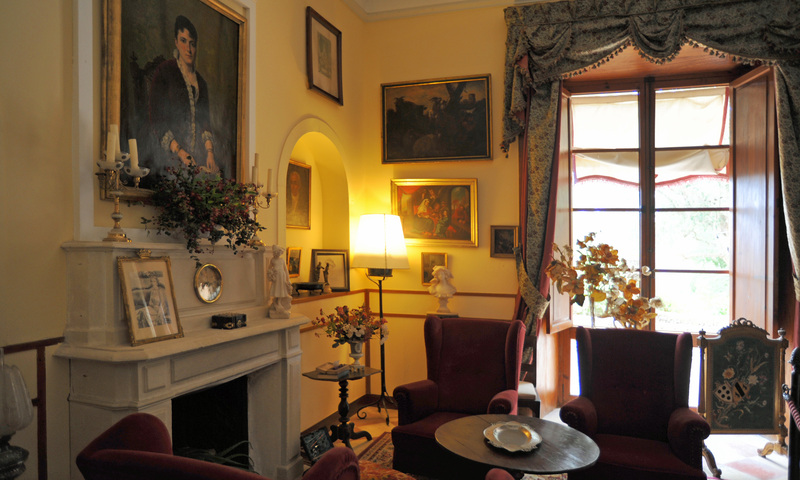 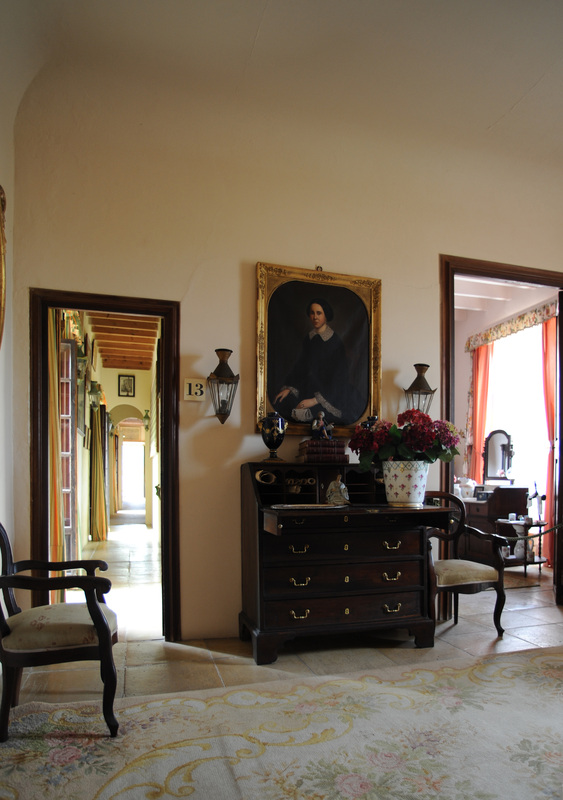 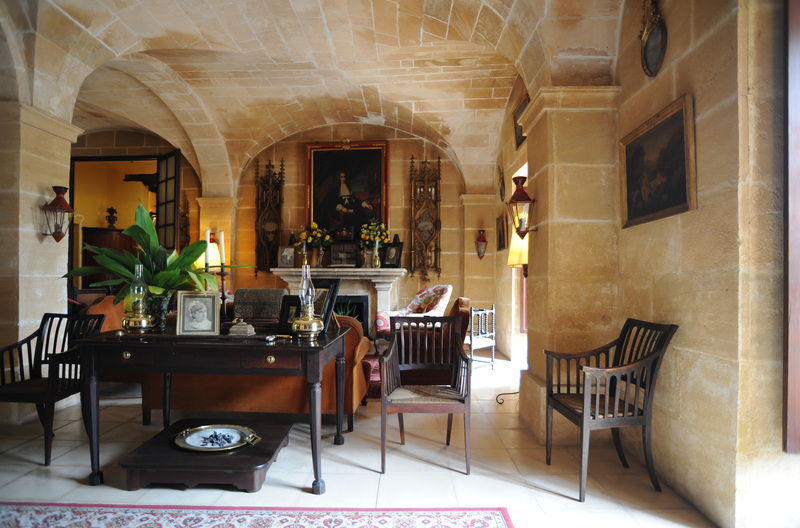 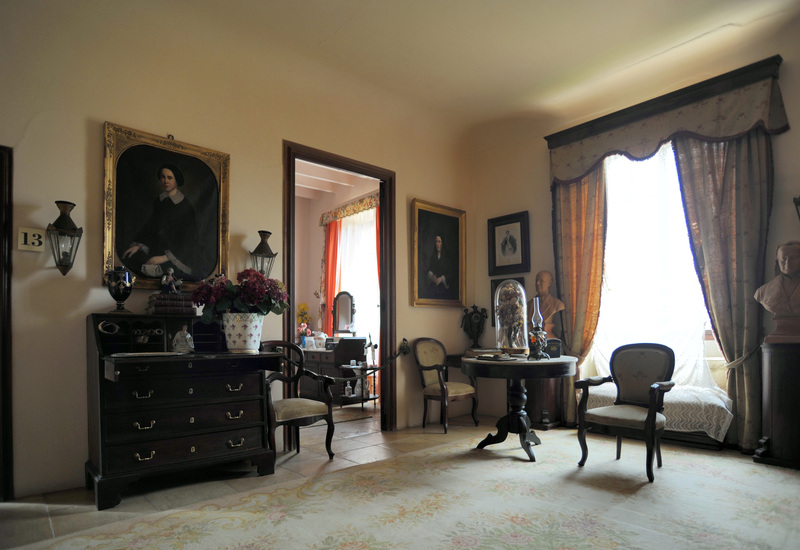 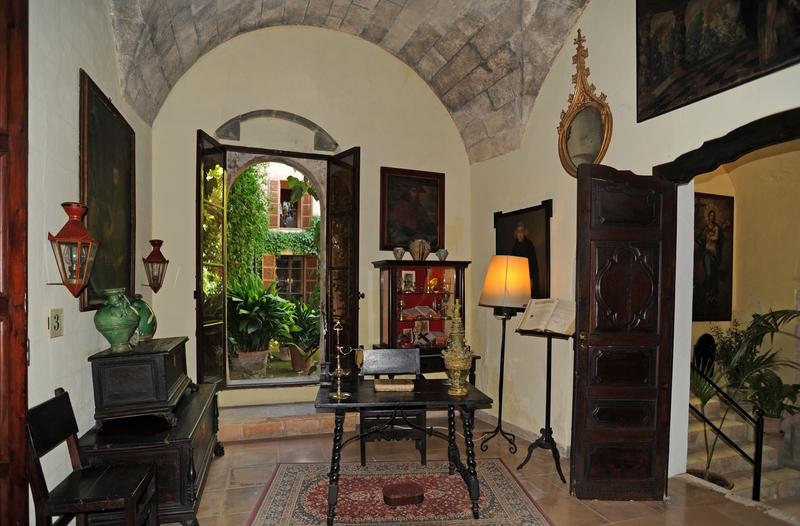 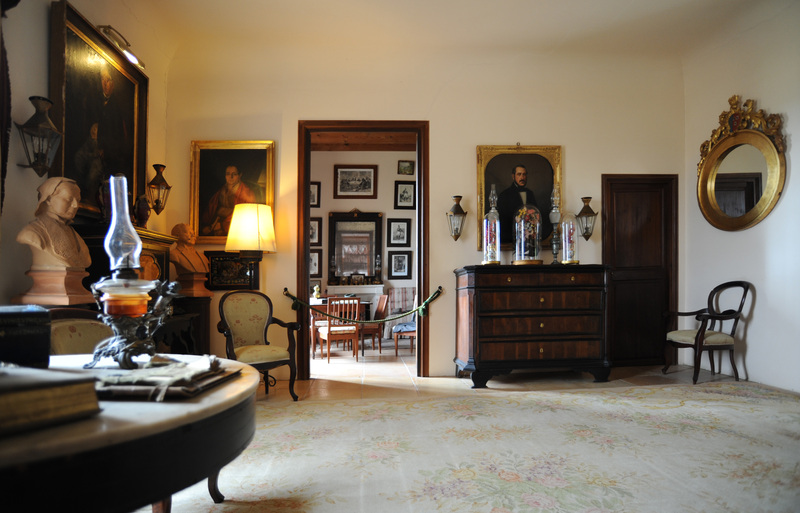 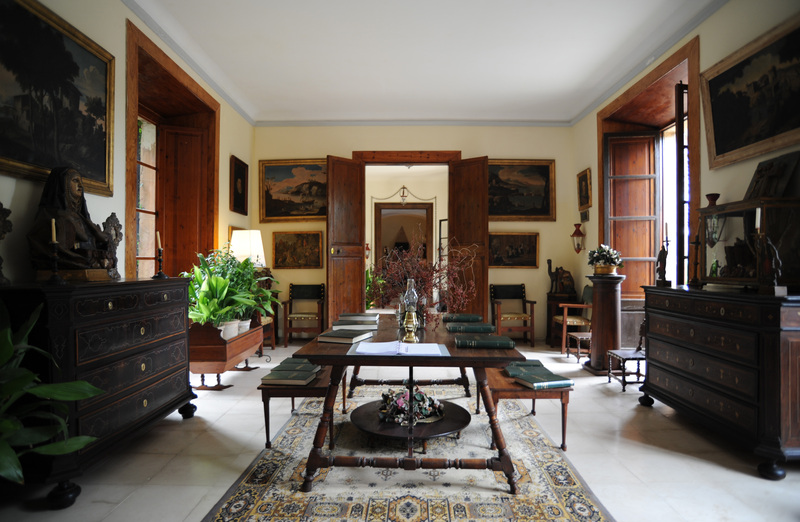 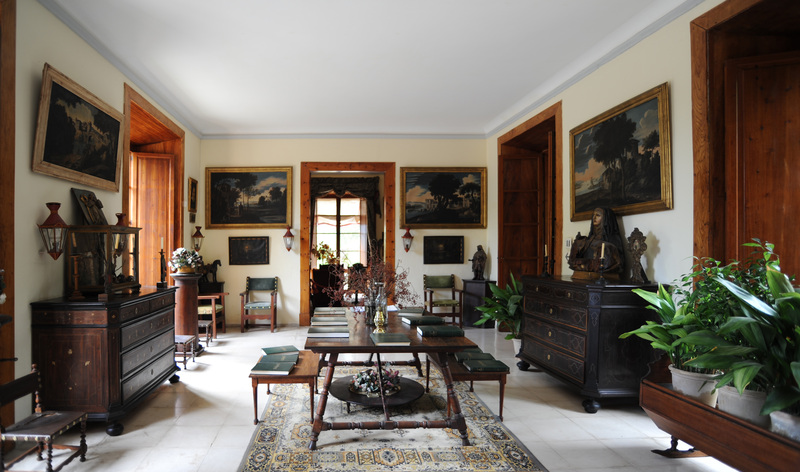 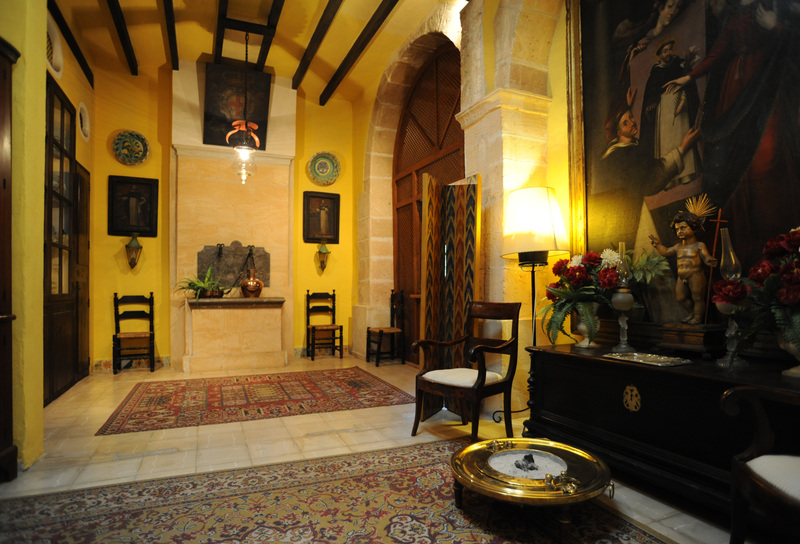 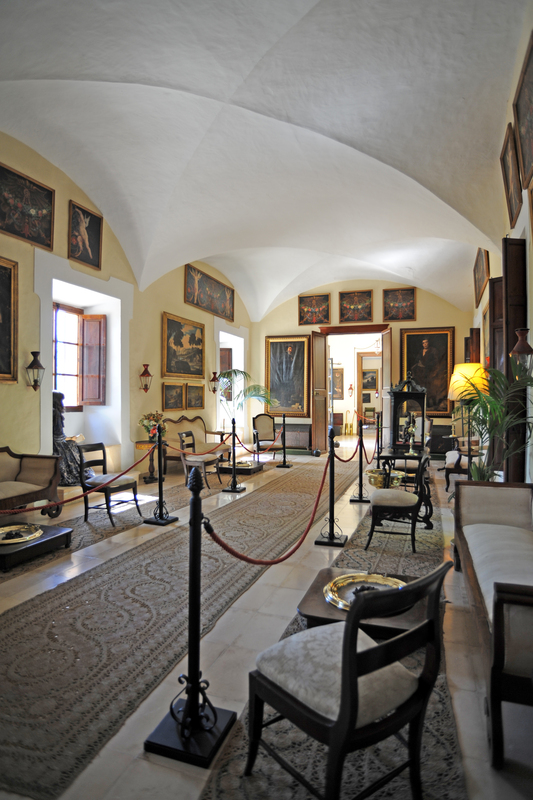 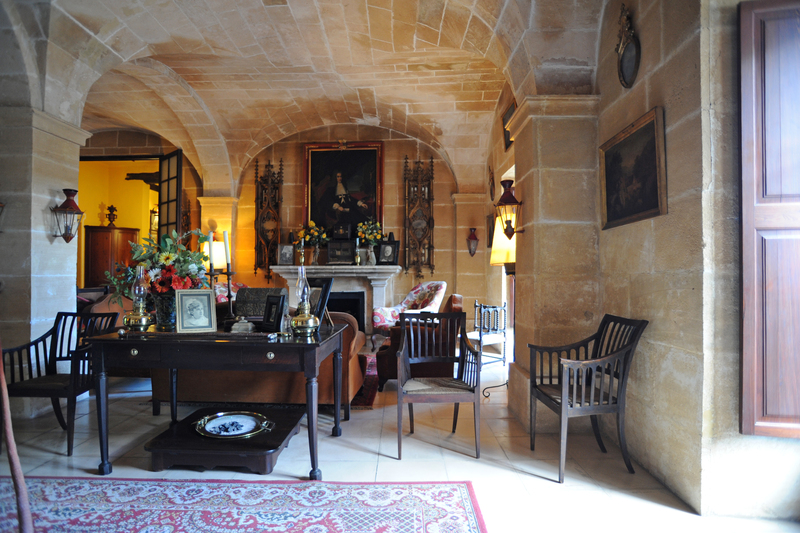 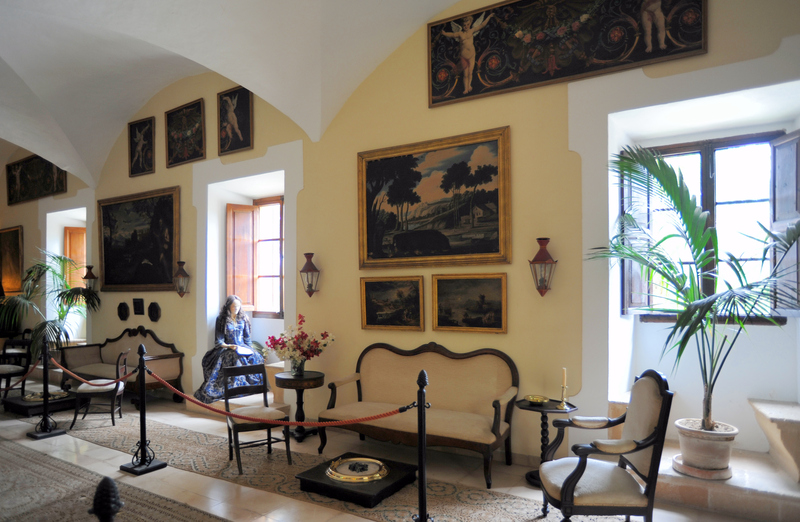 The reception room has furniture and Majorcan paintings (religious and landscape paintings of the eighteenth century). 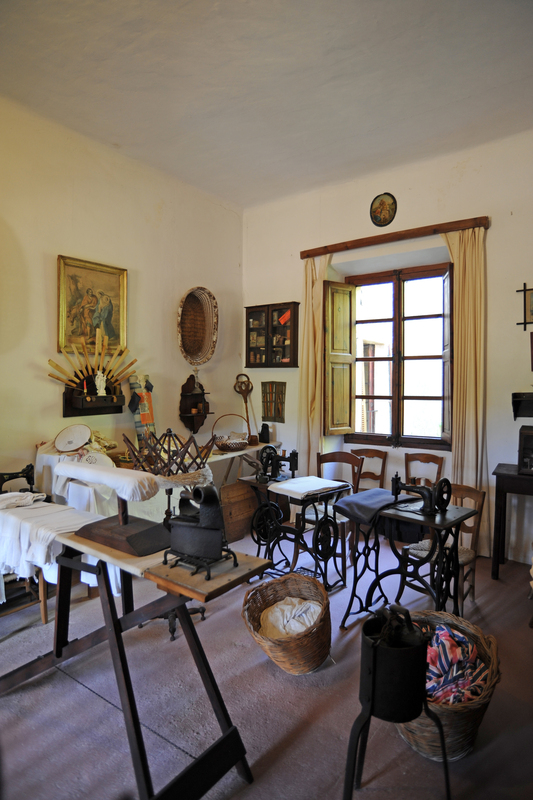 At the end of the room you see a fire of great proportions, the room also contains a remarkable collection of braziers. 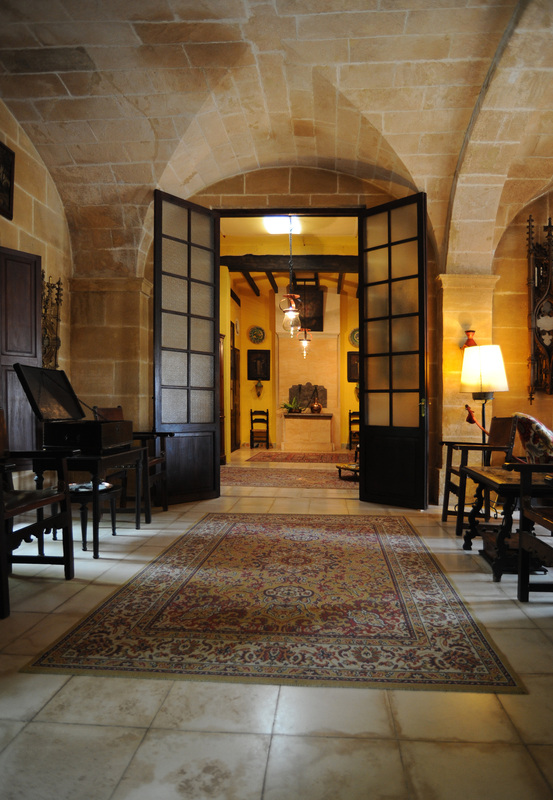 At the bottom of the reception room on the left, a passage gives access to what is called the "priest’s office" and in large estates were invited indeed a priest, often belonging to the family, for religious acts. 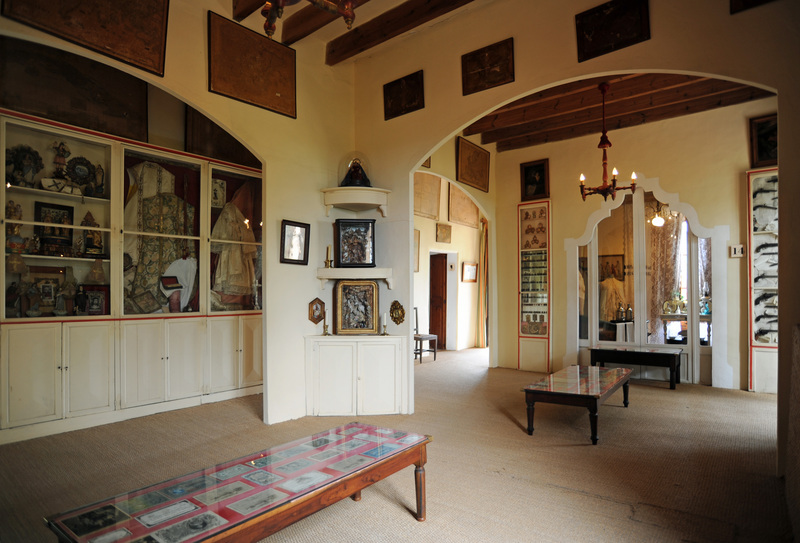 The office of the priest is a square room with a vaulted ceiling, which contains a Carmelite triptych located above the fireplace. 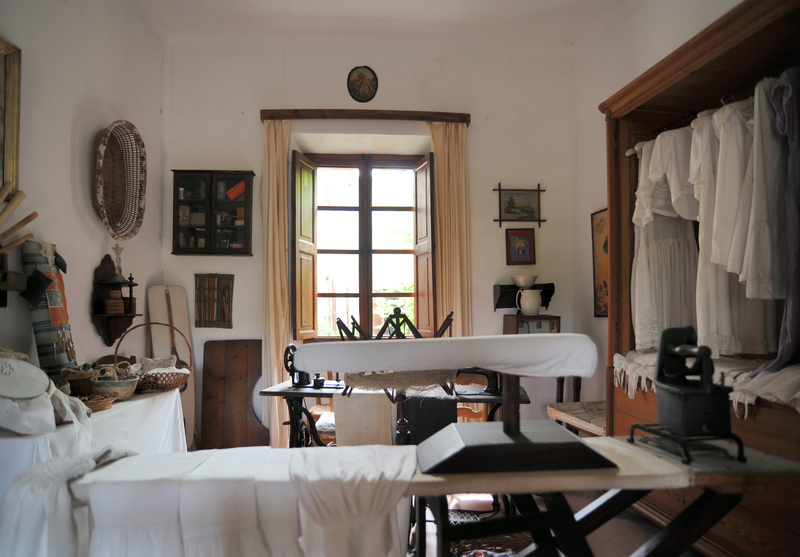 On the table, a lithographic plate is the Baptism of Jesus. 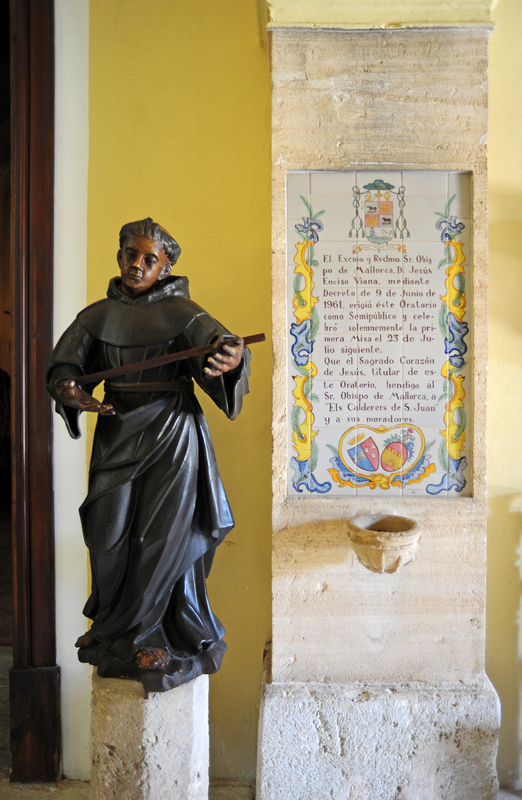 On the way out, a picture of the Dominican preacher San Vicente Ferrer, who appears with wings, in allusion to the name of the Angel of the Apocalypse. 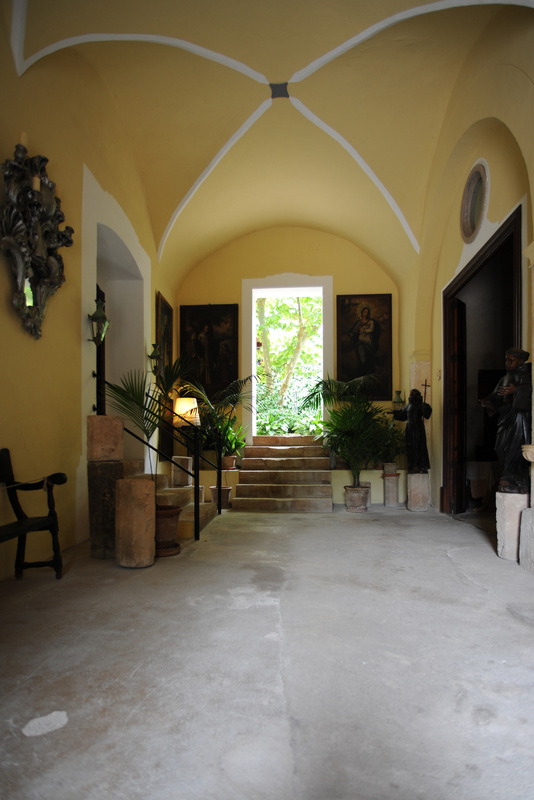 The office of priest you leave a small staircase with four steps to achieve a space once used for weddings. 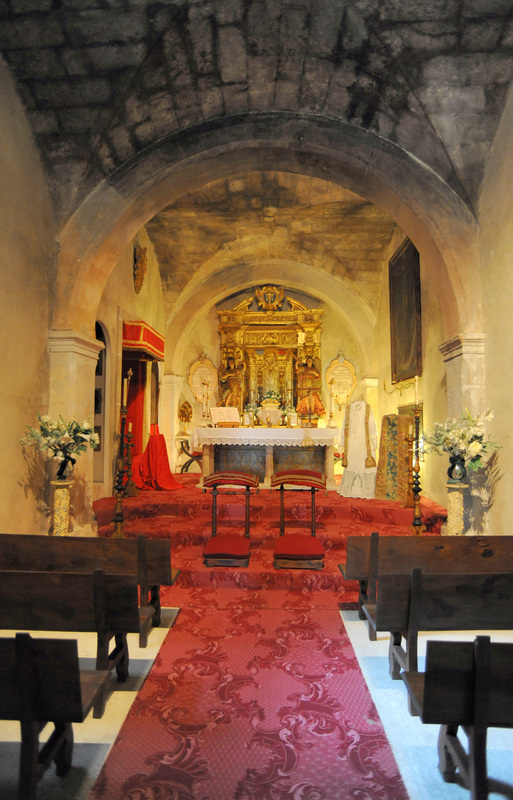 A portion was converted into a chapel in the twentieth century. 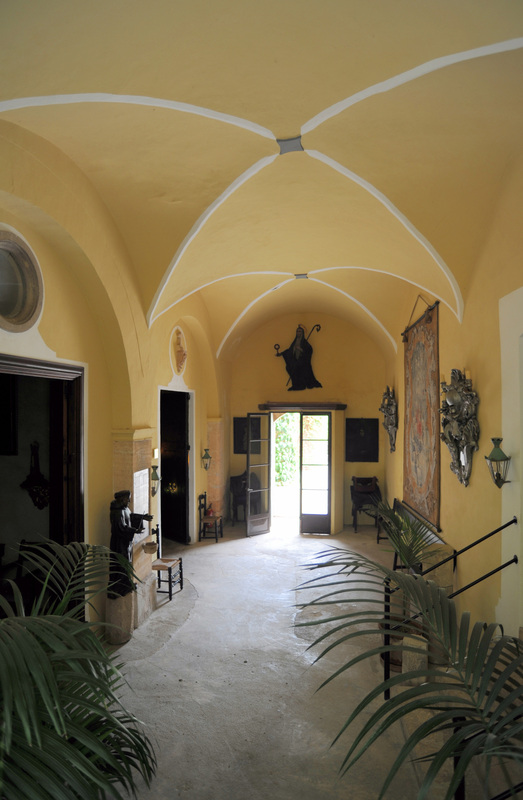 In the lobby ceiling in two vaults, one sees several paintings, like those of St. Bernard of Alzira (Sant Bernat d’Alzira) and St. Grace (Santa Gràcia), and that of the Immaculate Conception. 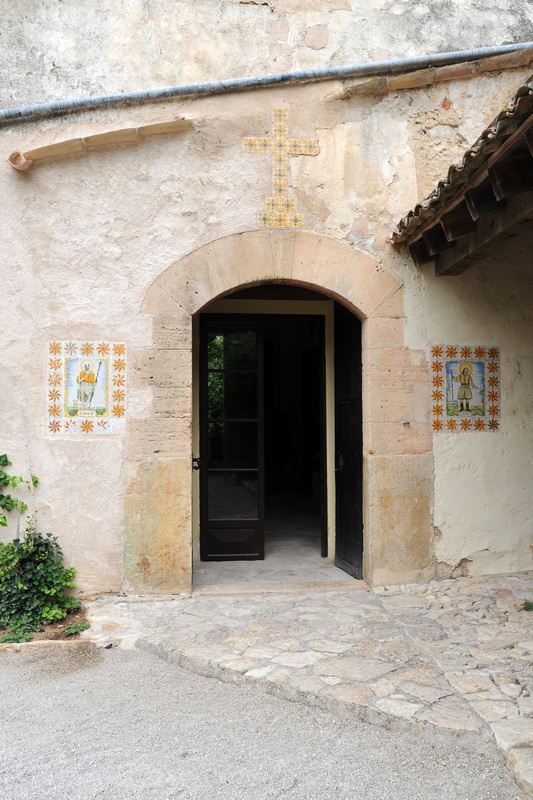 Almost opposite the office door of the priest opens the door of the chapel, with, on the right, a panel of tiles which confirms the semi-public oratory status conferred in 1961 by Bishop J. Enciso. 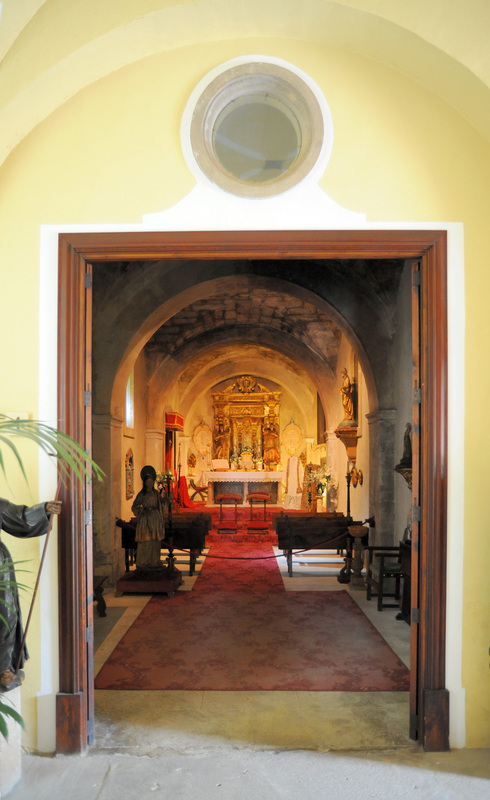 The chapel is rectangular in shape with a ceiling of three arches. 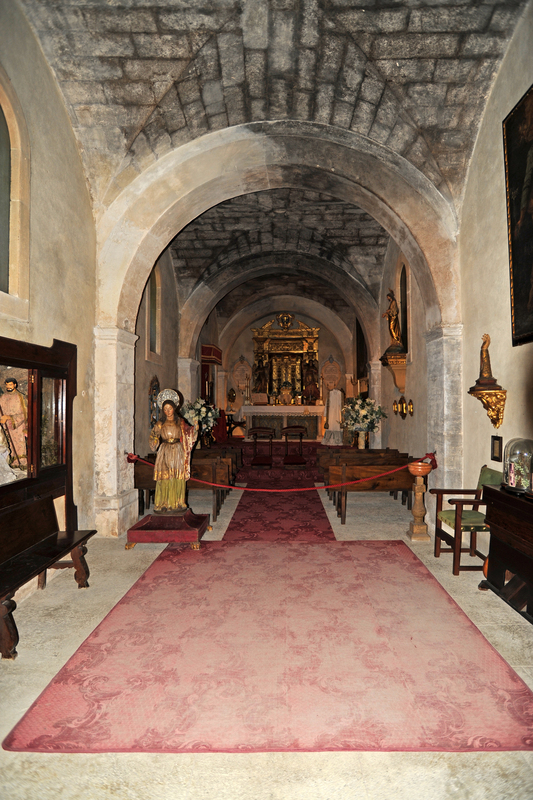 On the left of the first row we see a baroque center, which is used every year for Christmas, this crib was assembled in the church of Saint-Nicolas (Església de Sant Nicolau) of Palma, on the right of the first row, is dedicated to St. Joseph (Sant Josep) painting. 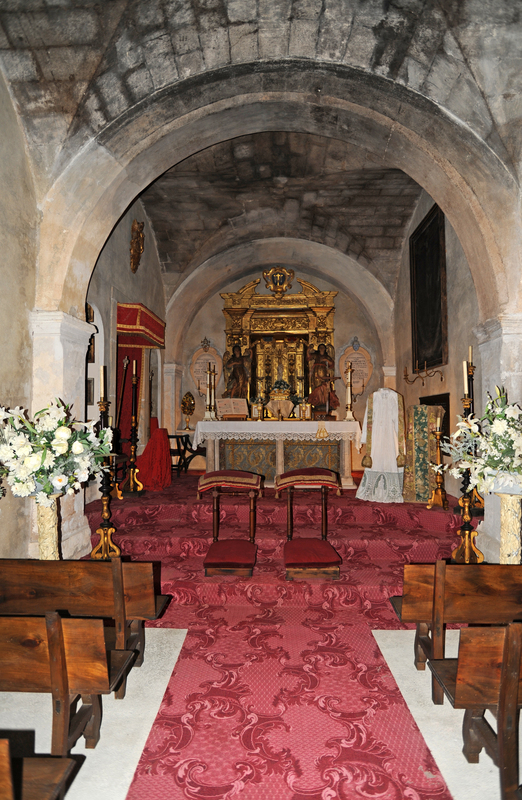 The second bay on the right retains a small grave with the image of the Sacred Heart, while on the left is another image of the Immaculate Conception. 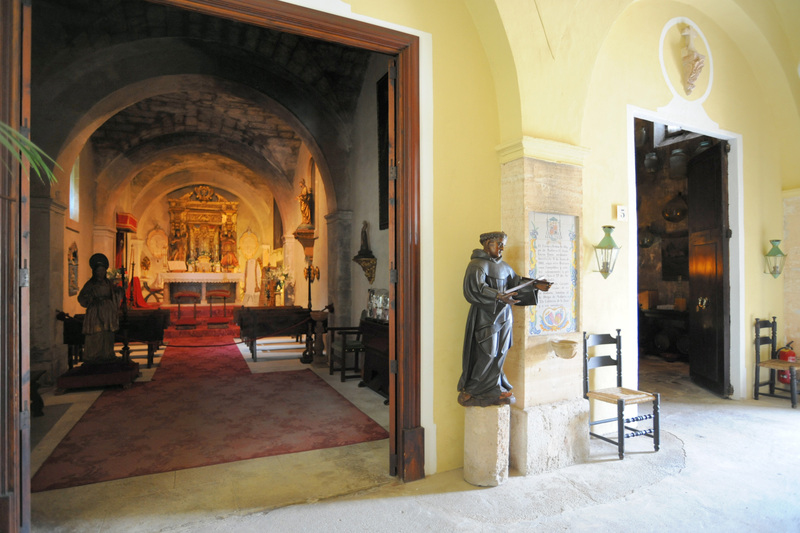 The third bay is occupied by the chorus, dominated by a Baroque altarpiece with two angels on each side and an image of the Virgin in the center. 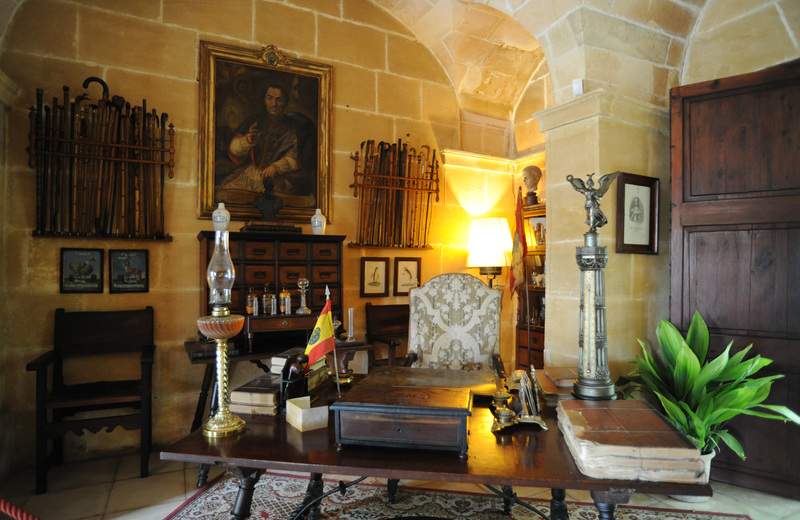 On the wall of the head of the presbytery on the right is a letter concerning the Senyora Margalida de Verí i Fortuna, died in January 1958 and left another letter of 1959 concerning the authorization of Pope John XXIII to bless the chapel. 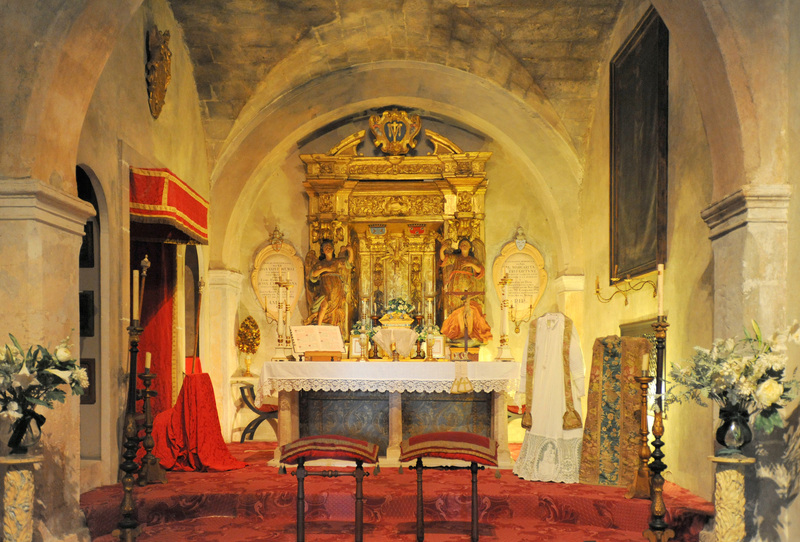 Against the left wall is covered with a fabric seat for the bishop. 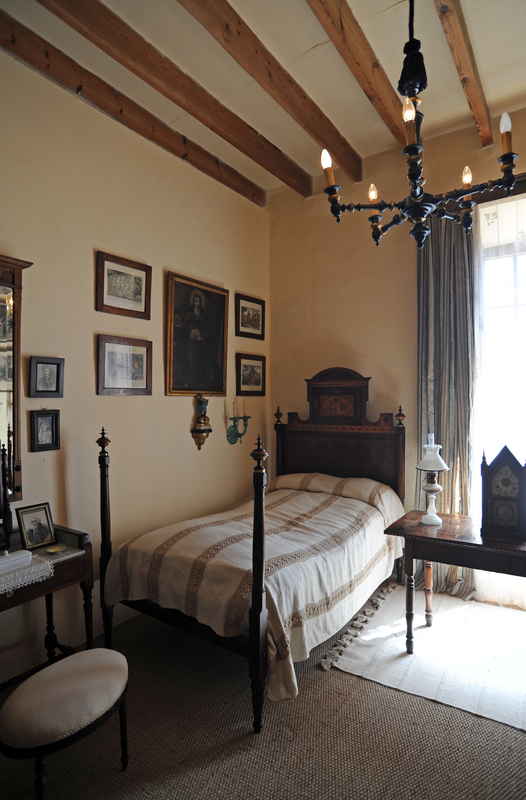 The months in which the owners lived in area, is celebrated daily Mass in the chapel, and there reciting the rosary at sunset. 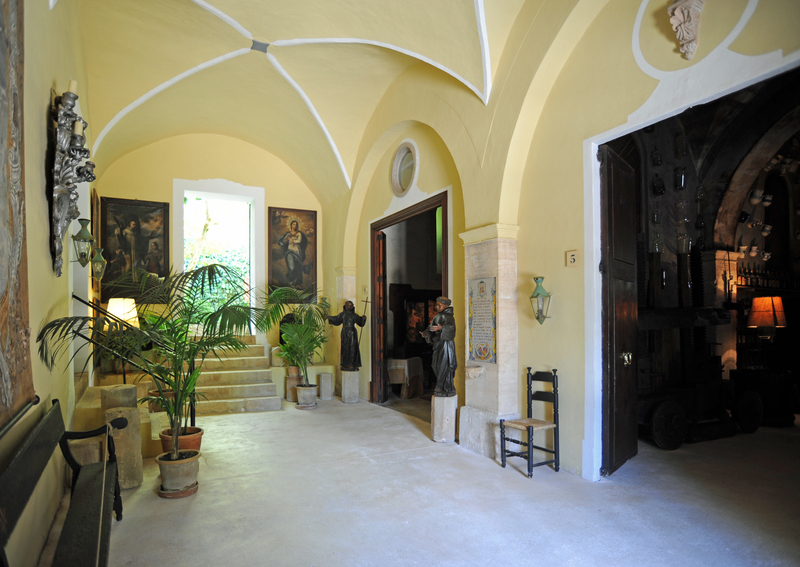 To the right of the chapel is the storeroom. 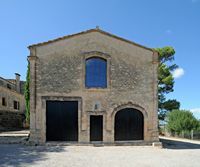 Today, the pantry is in the form of "L" with a total of five arched sections, but before sheltering the chapel, the cellar was rectangular with eight sections, divided into two sections of four units each. 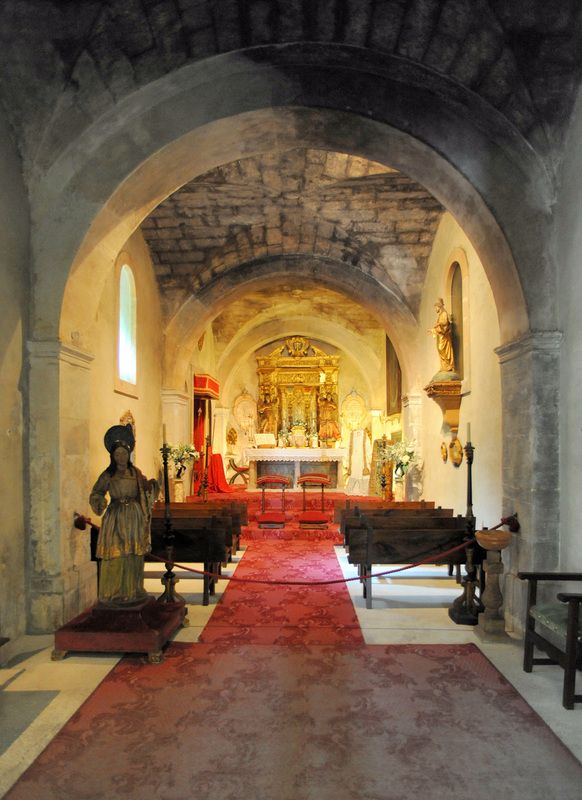 There are four ships on the right and the last aisle on the left, behind the chapel. 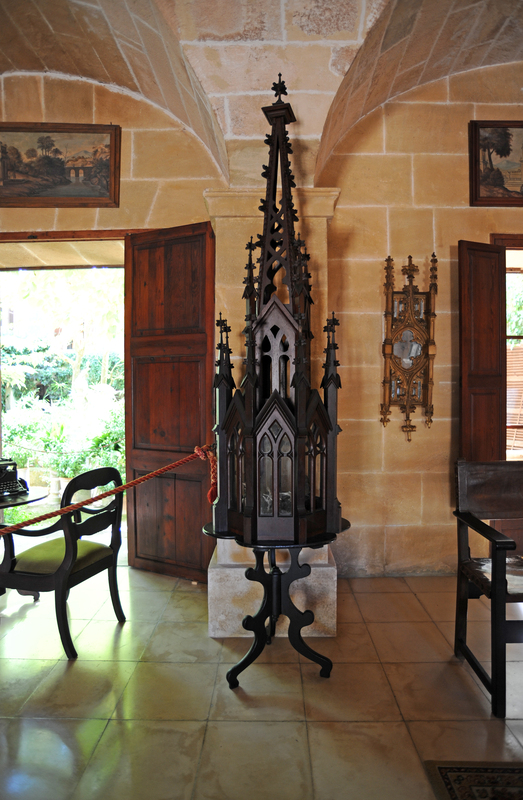 In the left wall of the cellar is an open wooden lattice that communicates with the chapel. 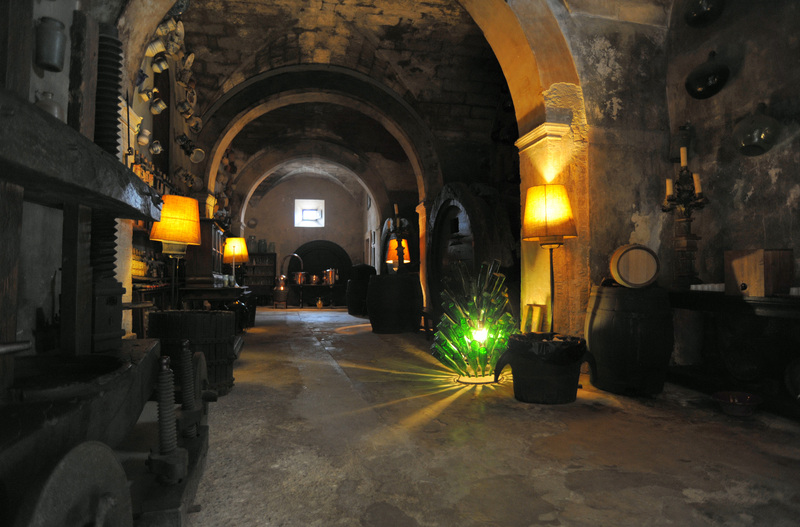 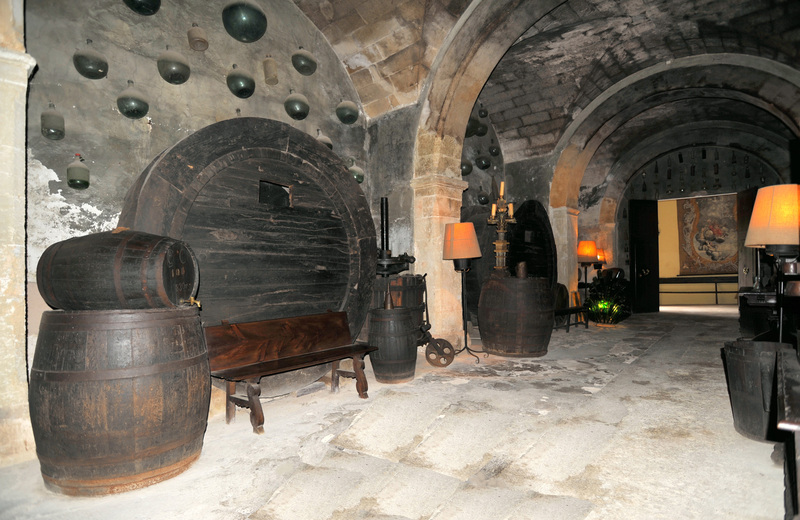 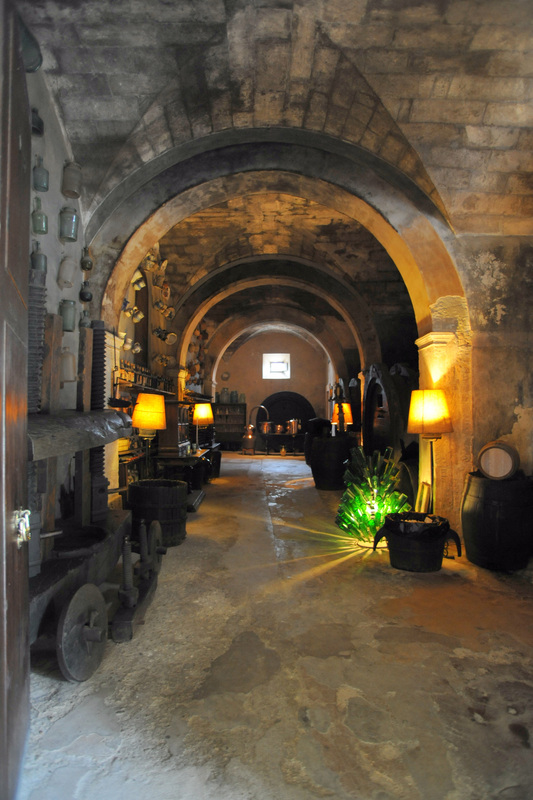 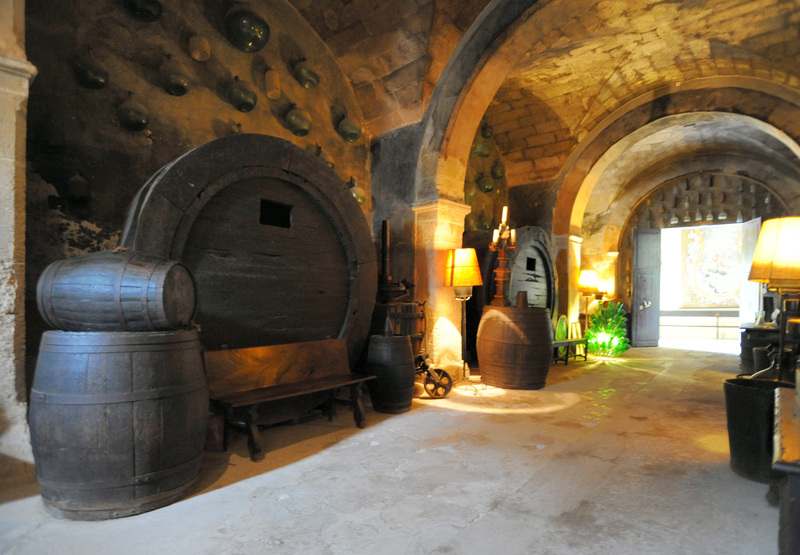 The cellar was used to keep the wine for it to acquire, over the years, the best quality for marketing. 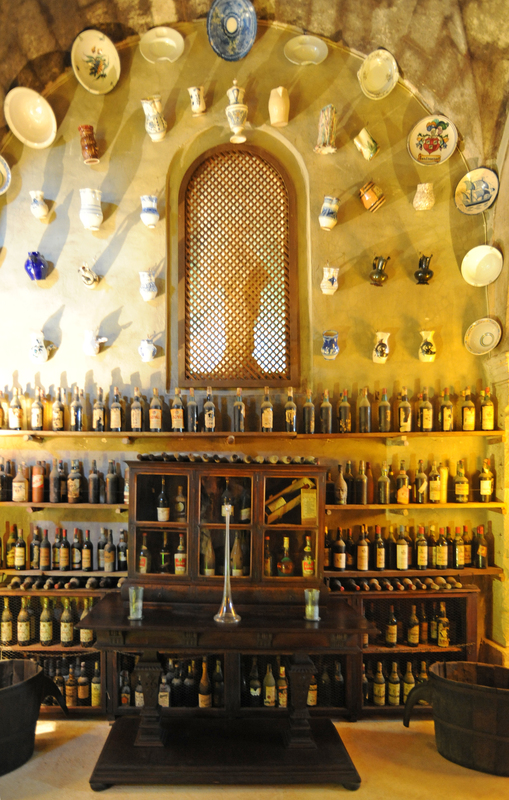 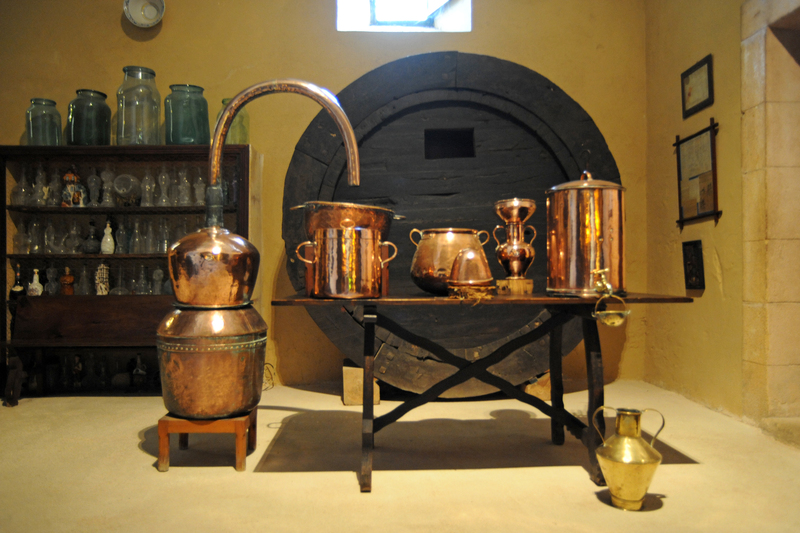 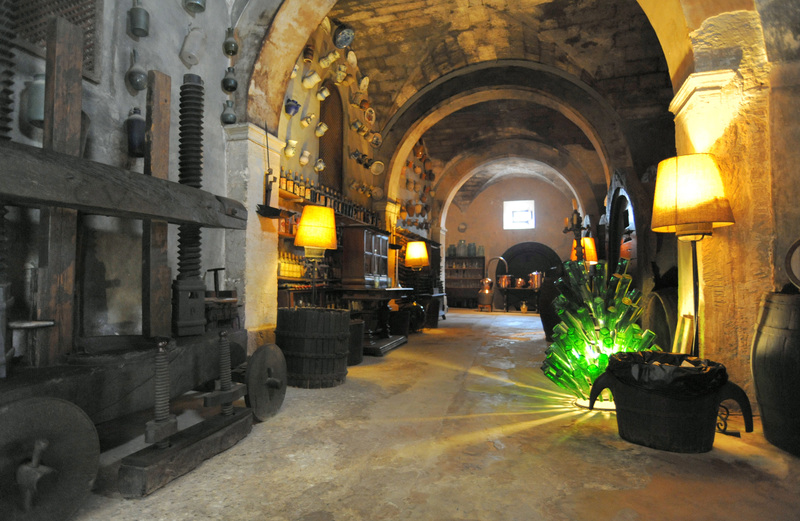 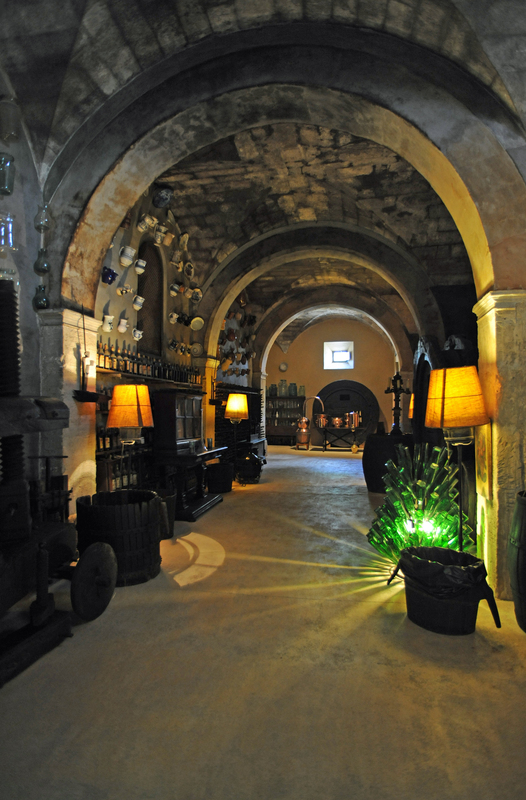 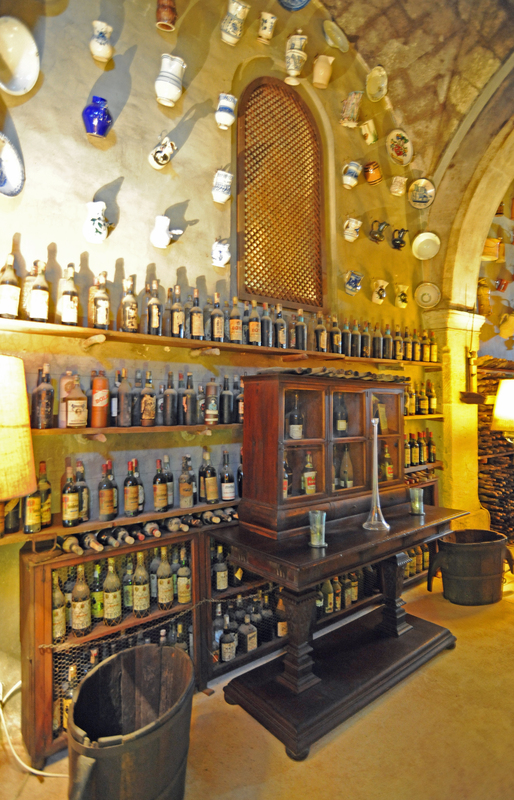 In the cellar are exposed several documents relating to the world of wine as a press with two arms on the left, barrels, bottles of old wine and a copper still. 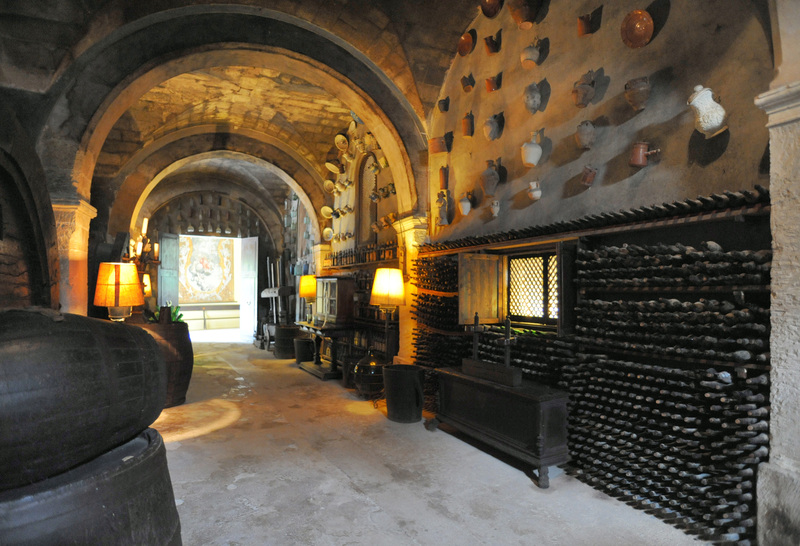 There is also a curious document of 1917 entitled "Els deu manaments del vinicultor" ("The Ten Commandments of the winemaker"). 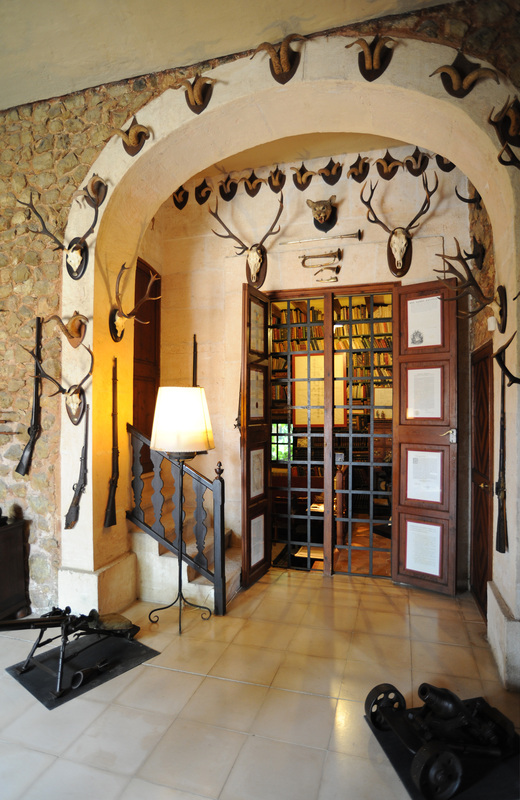 The vine was once the most important source of the domain of Els Calderers income, but the attack on the vineyard by phylloxera in the early twentieth century caused the destruction of the vine. 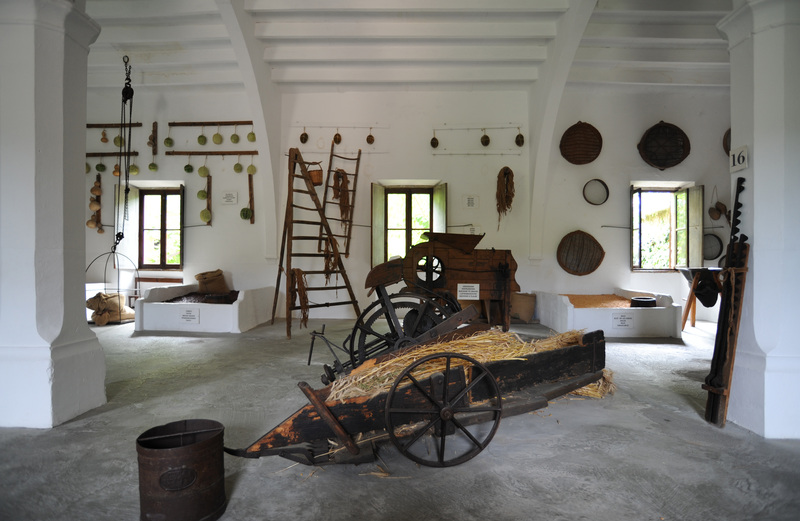 Most vines were uprooted and replaced by wheat fields, so that the grain production became the main source of income. 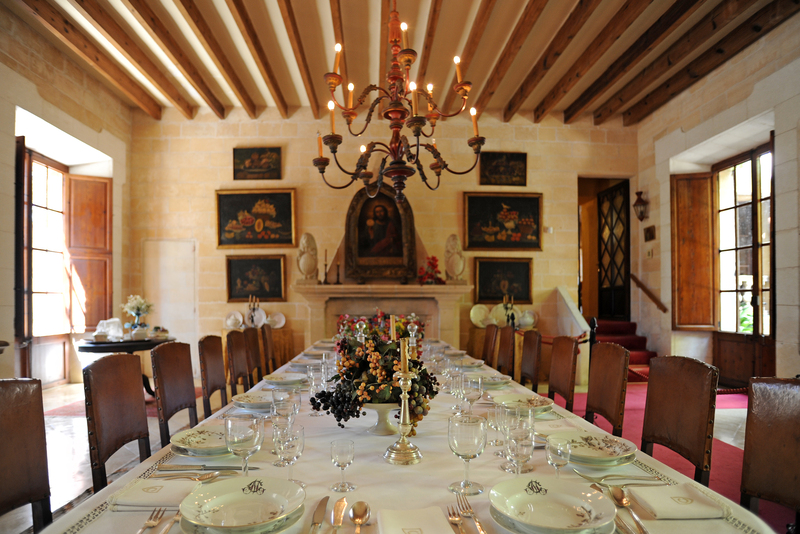 Today, winemakers seek a new beginning, and the house wine can be enjoyed by visitors. 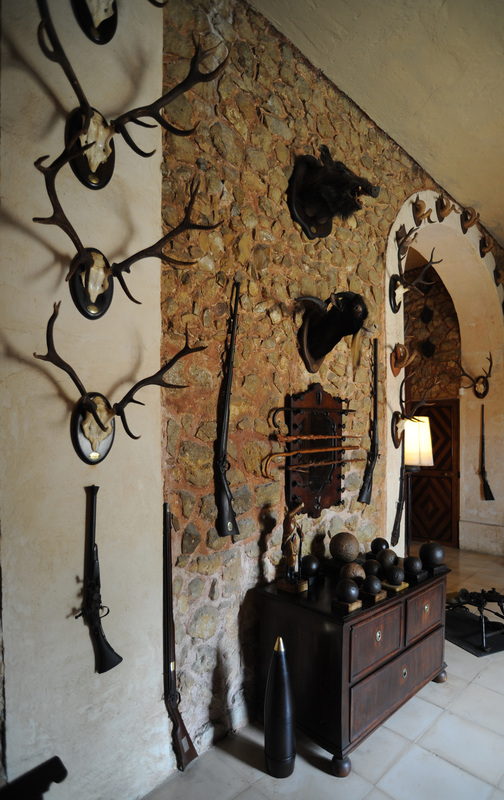 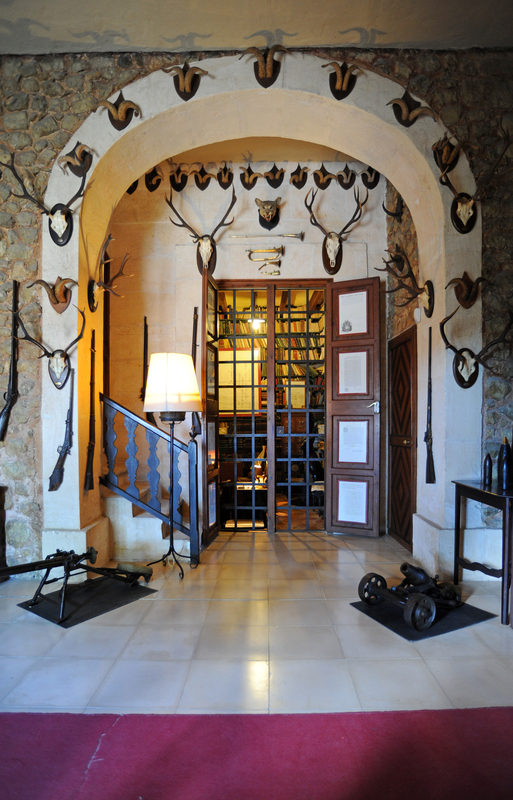 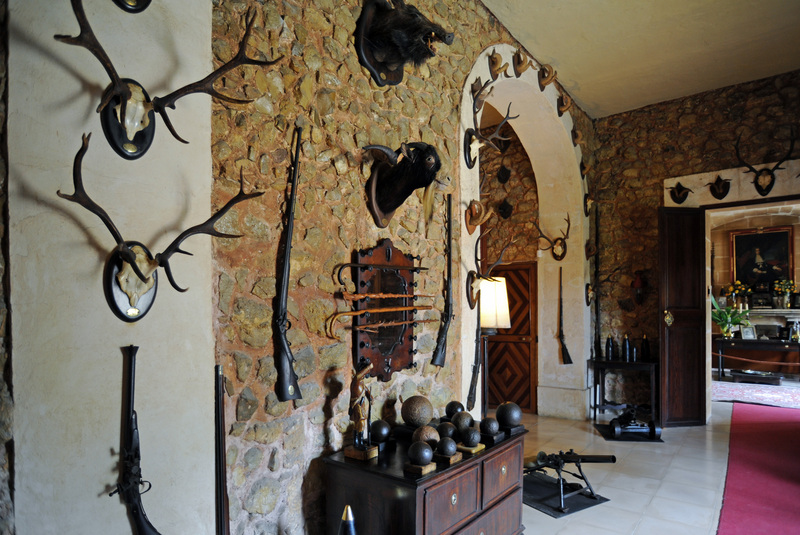 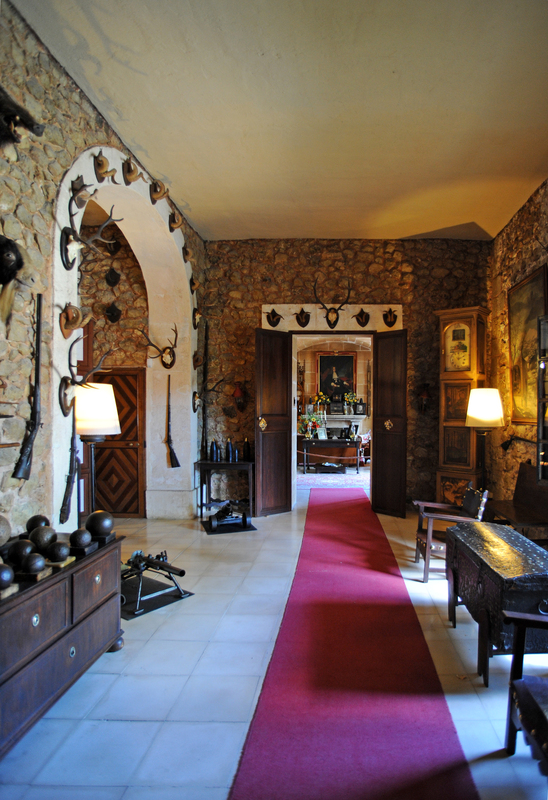 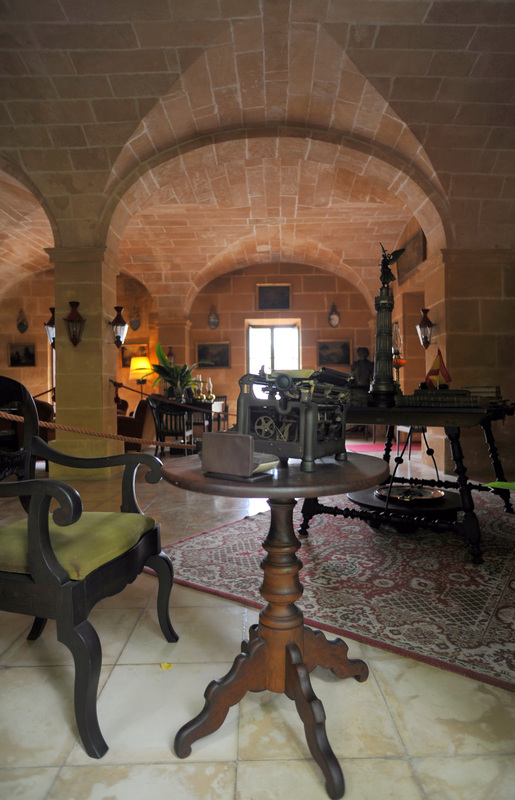 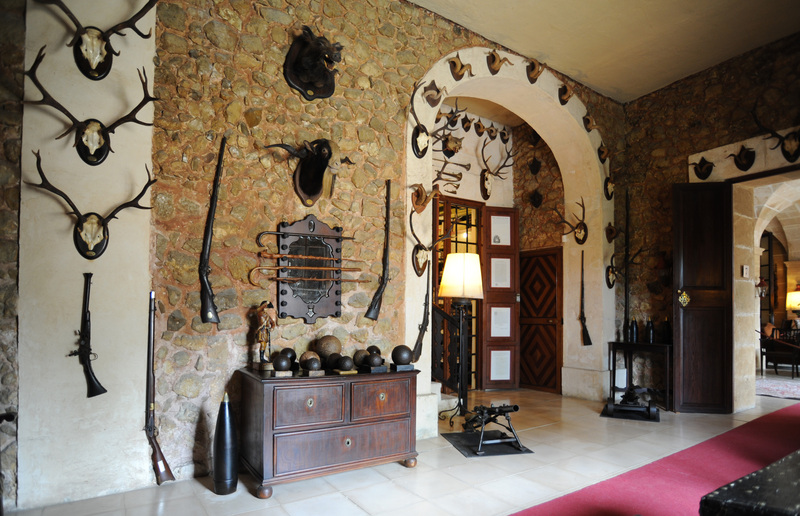 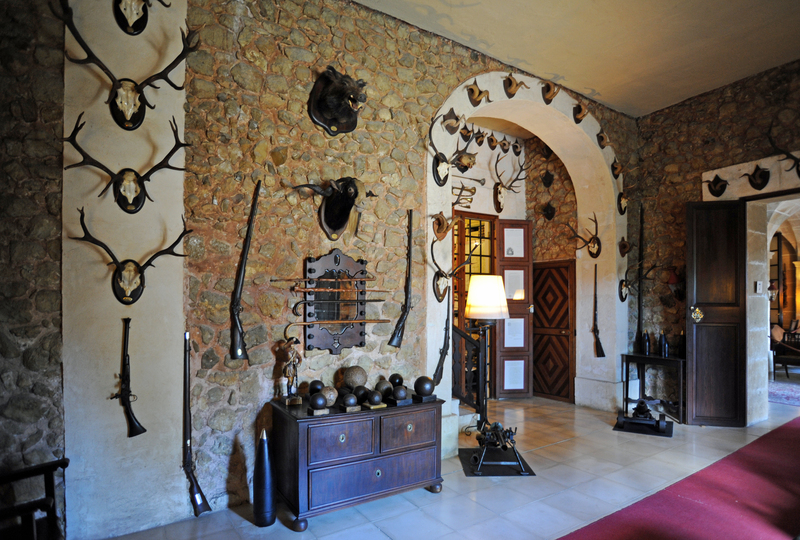 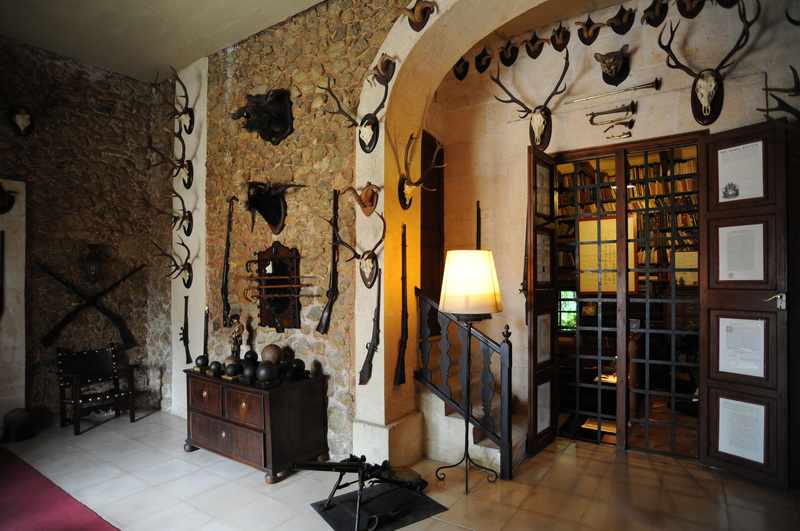 At the bottom of the cellar, left, a staircase back to the halls of the mansion, the first is the hunting room with animal trophies and weapons from different eras, including shotguns, crossbows and cannon balls old, recalls the importance of hunting "Els Calderers". 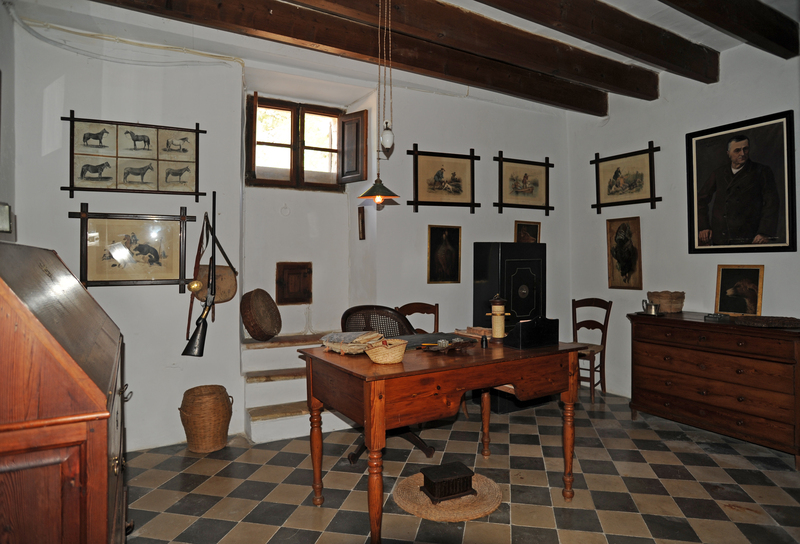 A small room on the left of the hunting room houses the archives of the estate, with papers and documents of the eighteenth and nineteenth centuries, mainly. 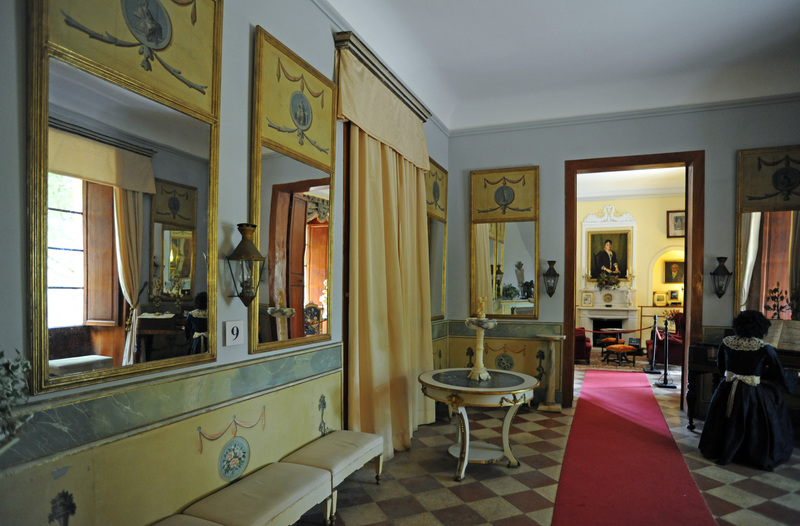 It then passes through the office of the Master, the center of power of the owner, a square room with two vaulted naves, with two sections in each aisle and a central pillar of square section. 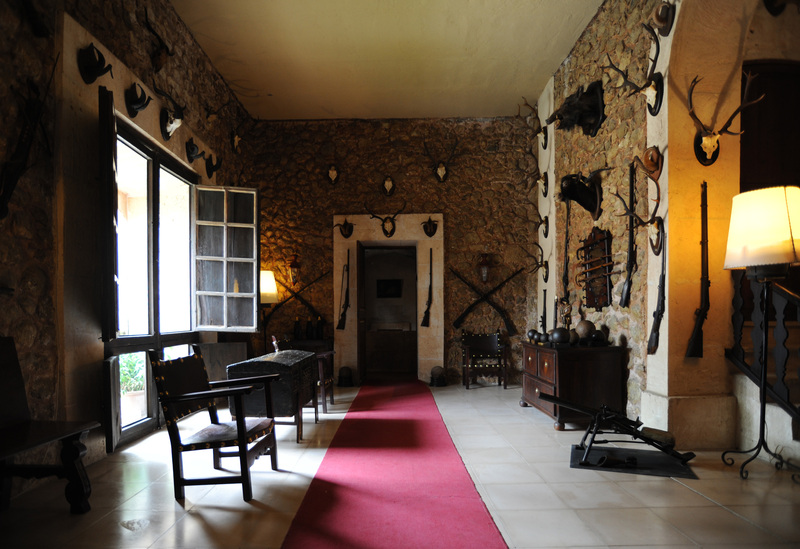 The office has a fireplace surrounded by cozy armchairs invited talks to men own at the time. 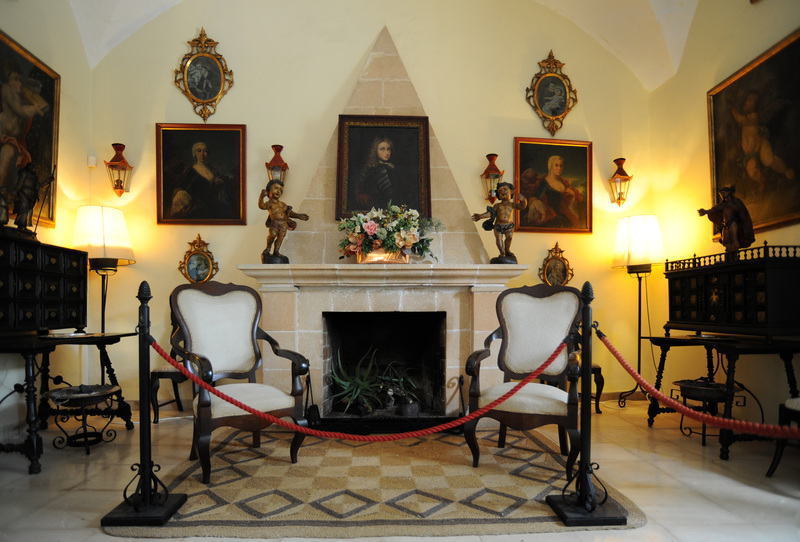 Above the fireplace, a portrait of a man wearing the Maltese cross which was identified as Ramon Despuig i Martínez de Marcilla, Grand Master of the Order of Malta in 1737. 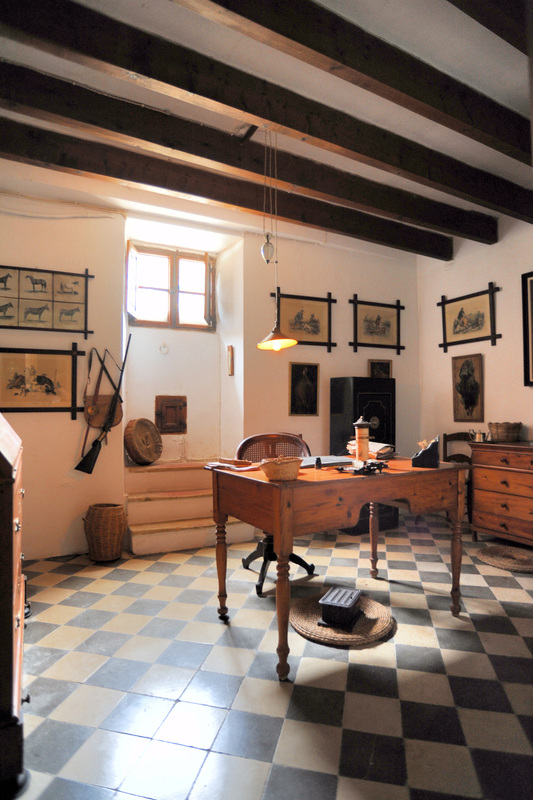 Office and a portrait of the bishop Bernat Nadal surrounded by a collection of canes can also be seen. 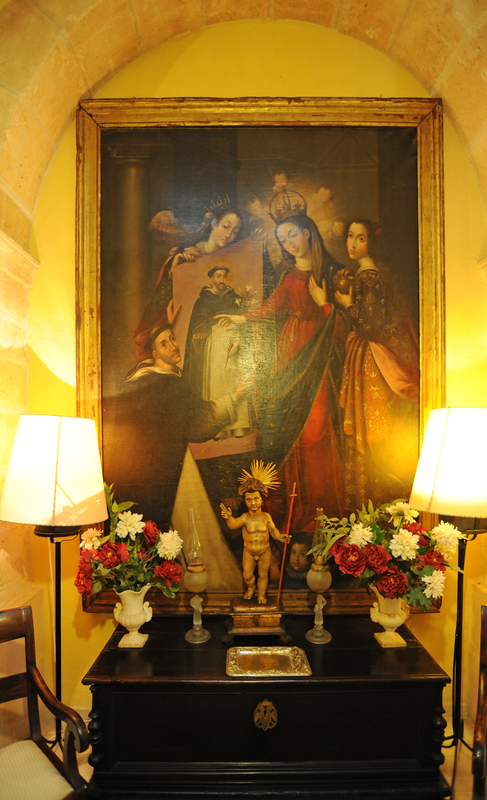 The office of Master is exited for this anteroom on the right a picture of the Virgin Mary with the Dominican saints. 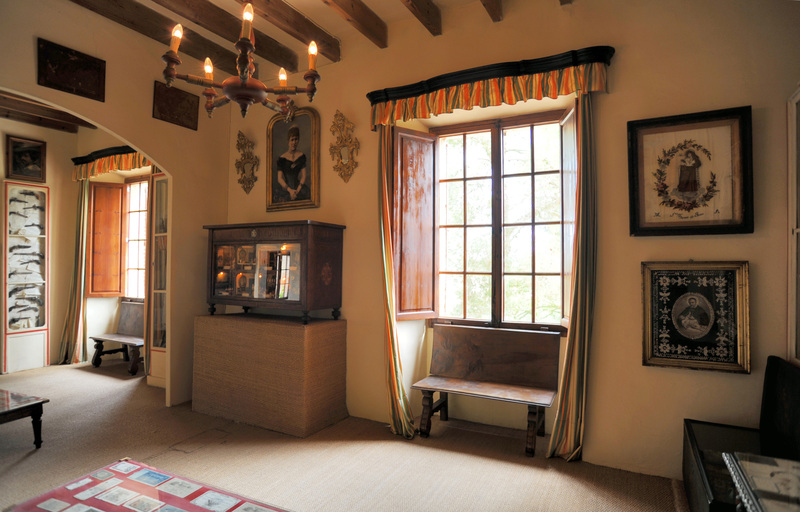 At the bottom of the hall is a remarkable double bowl sink, two bedside tables representing Trinitarian saints above the washbasin is a painting with a crest and motto Libertas. 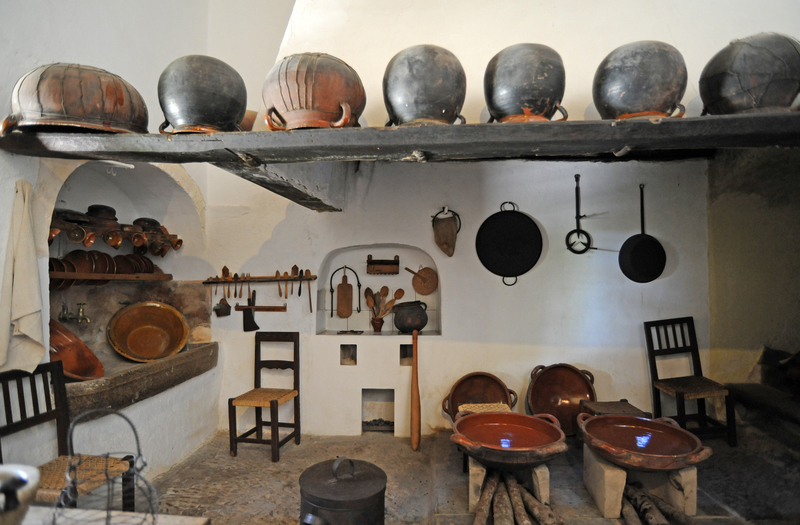 On the right of the hall you enter the kitchen Masters with tiles from the early twentieth century on the walls, and traditional kitchen utensils, such as clay pots and copper pans, and so on. A model represents the stove to work. 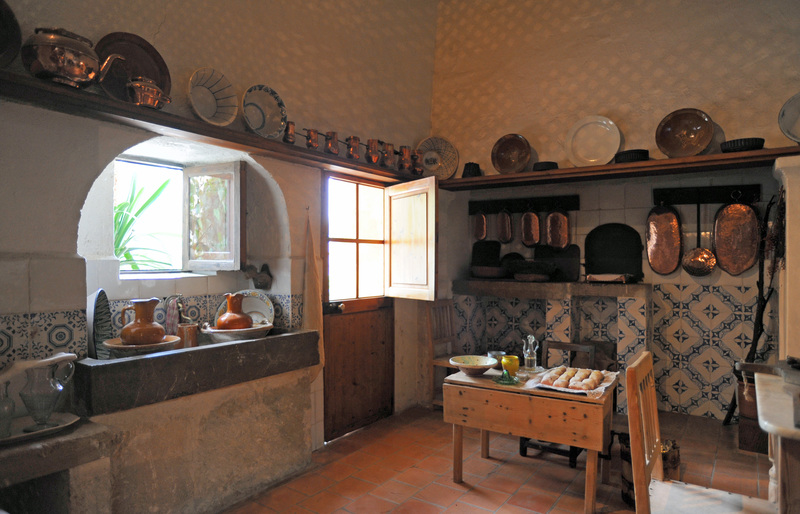 This kitchen was used daily until 1994. 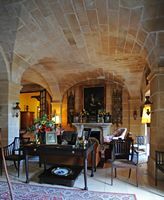 On the left of the hall, go down four steps to get to the dining room, the room has a beamed ceiling reinforced by a huge cross beam. 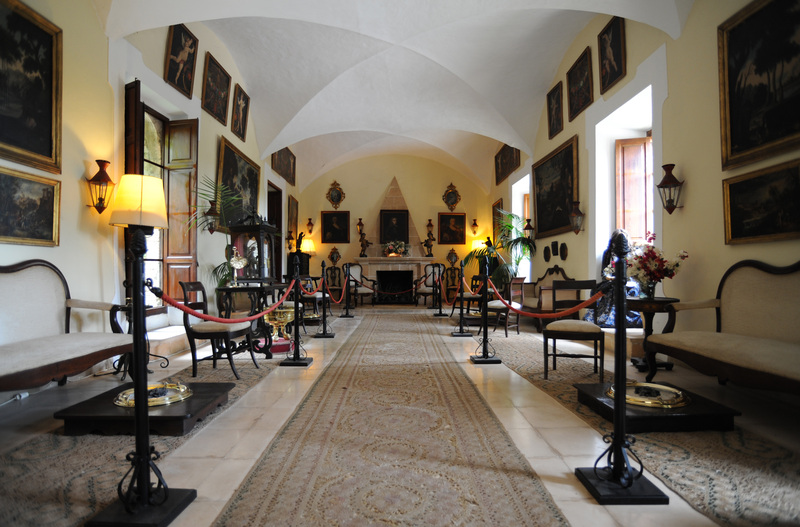 The fireplace is surmounted by a painting of Corpus Christi, with ornate frame. 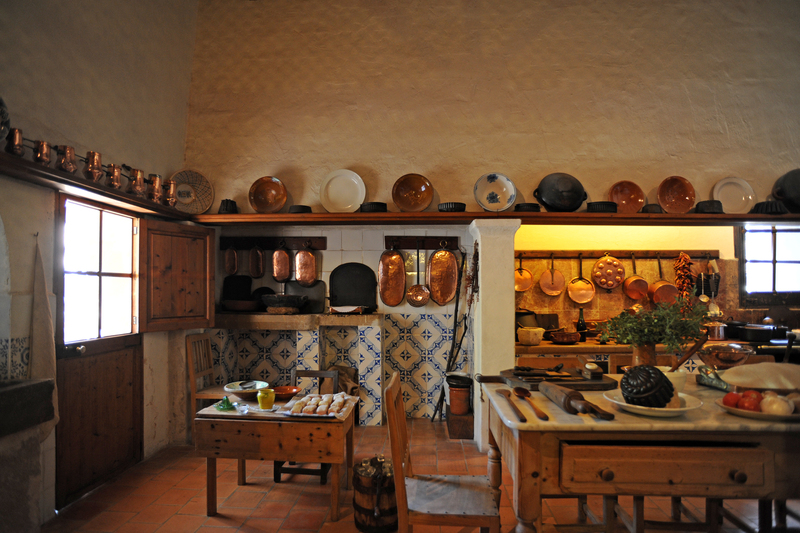 The crest of Juan is placed above the wash basin and there is also still lifes. 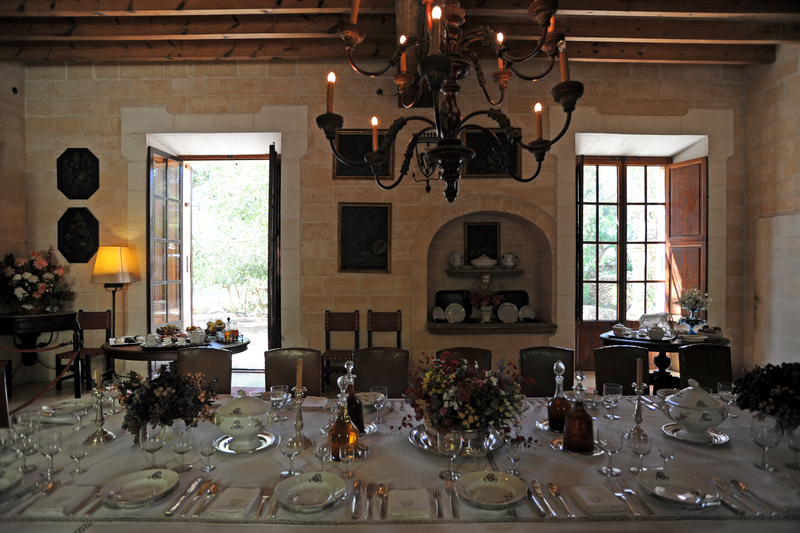 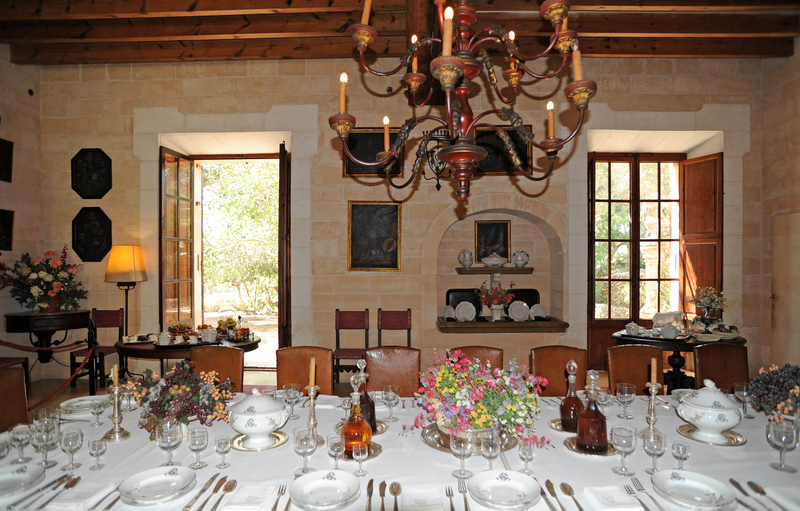 The room is dominated by a large, elegant table set for eighteen guests. 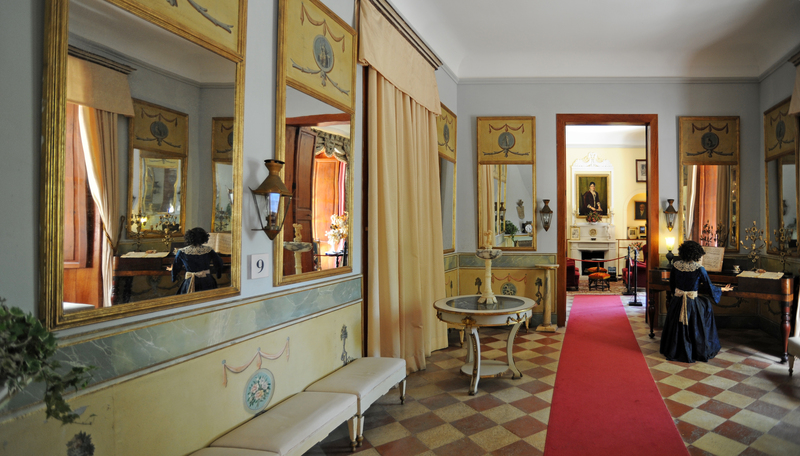 The tour continues through the music room, with a historical decoration of the nineteenth century, mainly classical, with decorative mirrors, and Egyptian Revival elements such as the sphinx of the chimney. 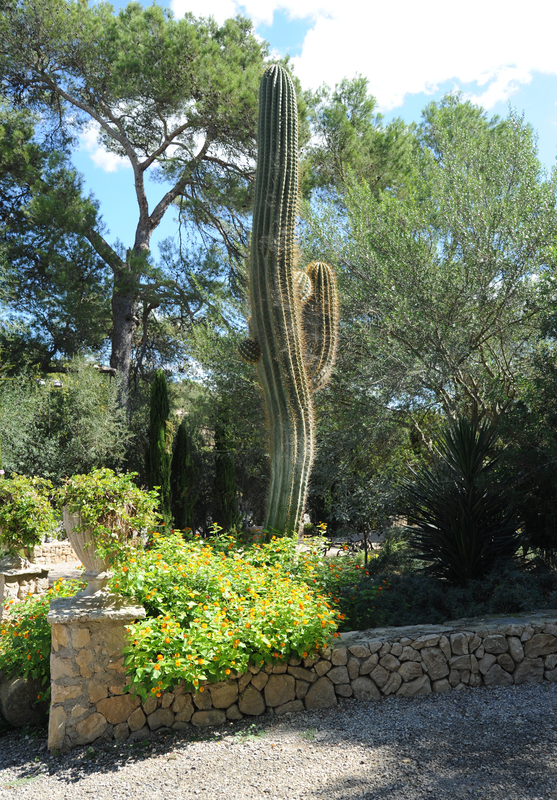 Attention is drawn to the traditional musical instruments of Majorca, as the short flute Mallorca, called "flaviol" which is played with one hand. 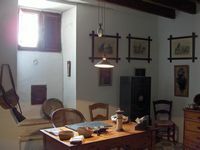 In addition to many other instruments used only in Majorca, the violin is the subject of a long tradition on the island. 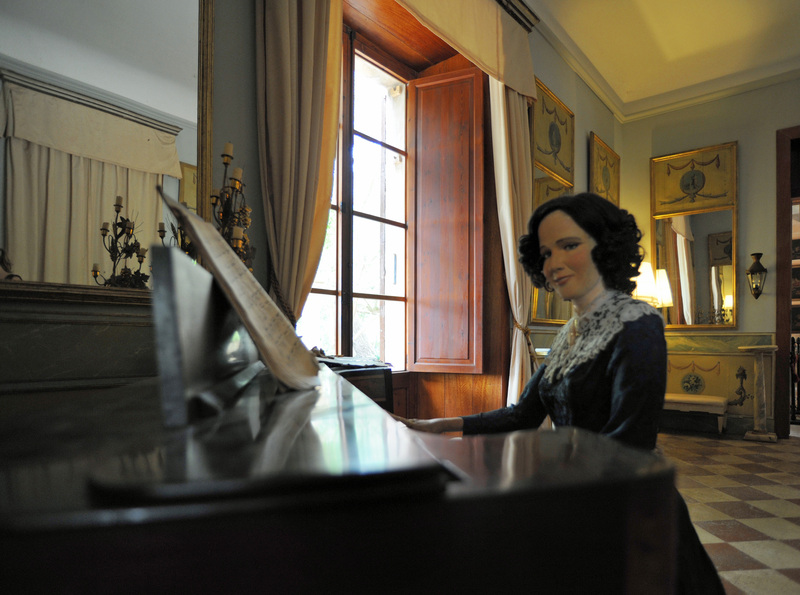 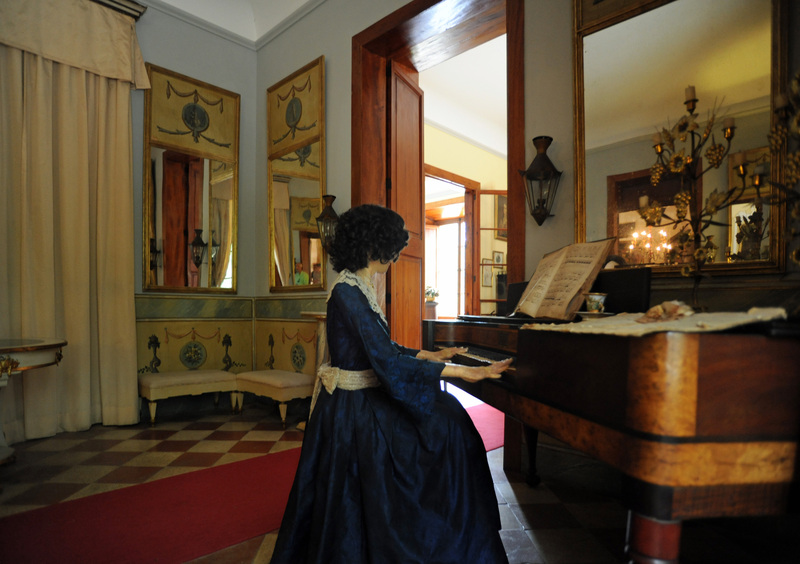 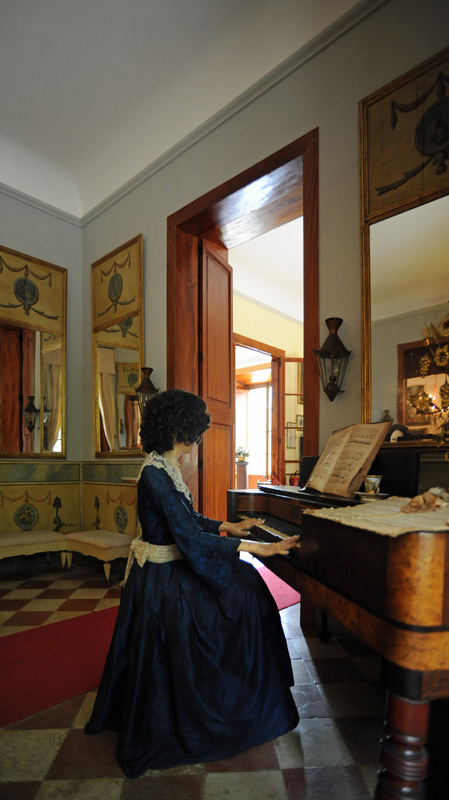 The mannequin piano dates the beginning of the nineteenth century, she wears a dress of silk Majorcan origin. 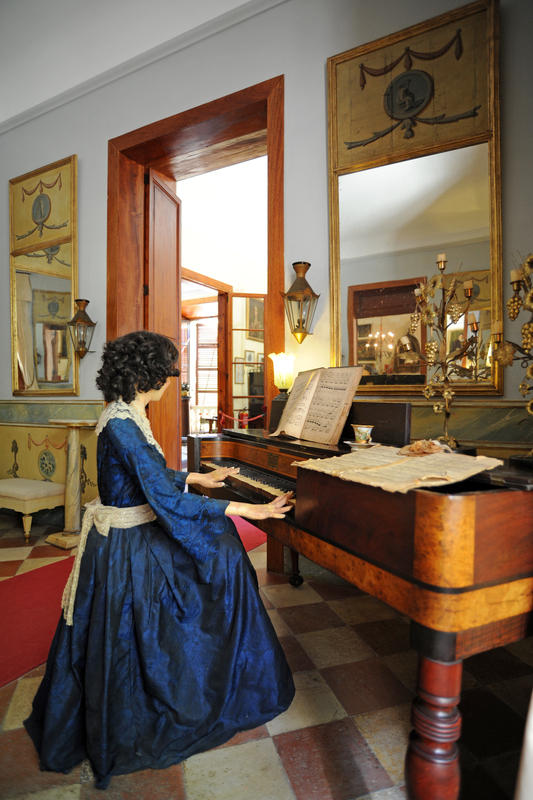 The music was one of the favorite pastimes of women in past centuries. 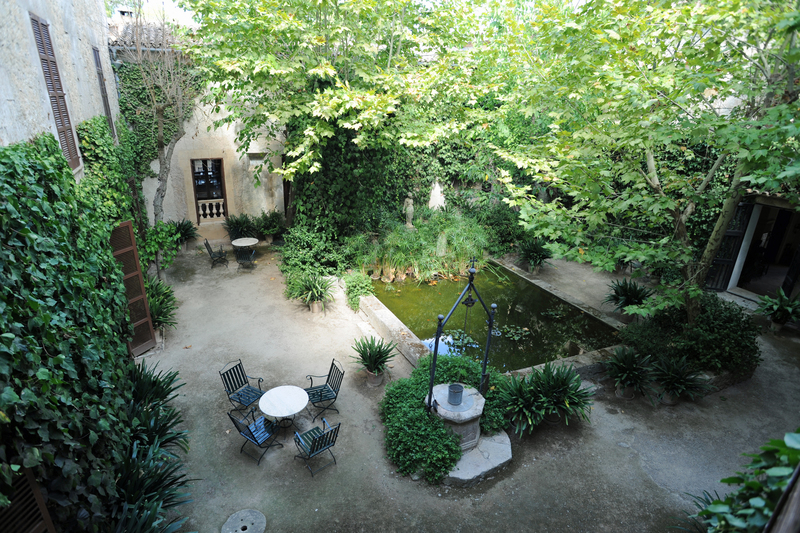 In the small romantic patio could listen to music outdoors. 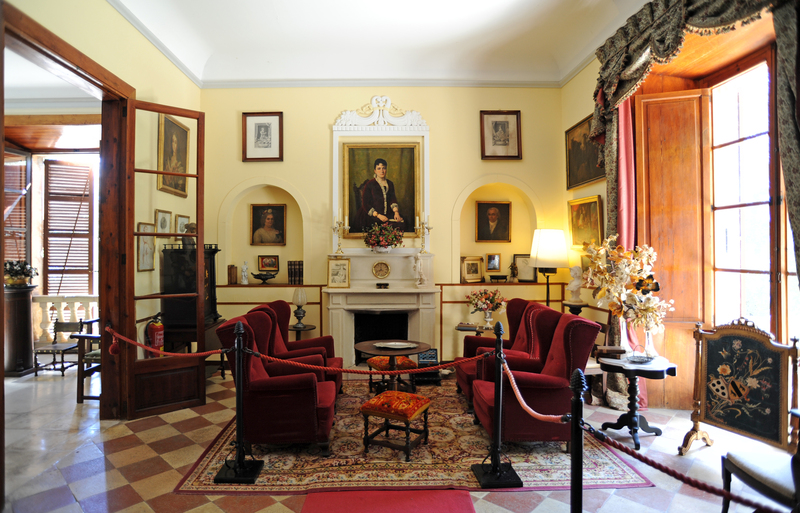 The salon of Madame is decorated with a portrait of the lady and many photographs. 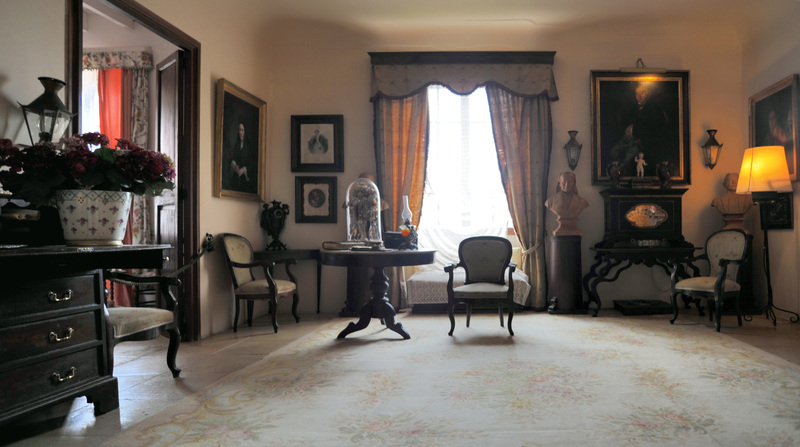 The salon of Madame was also home to the grandmother when reading, sewing and prayer hours absorbed in a peaceful atmosphere that is still perceived. 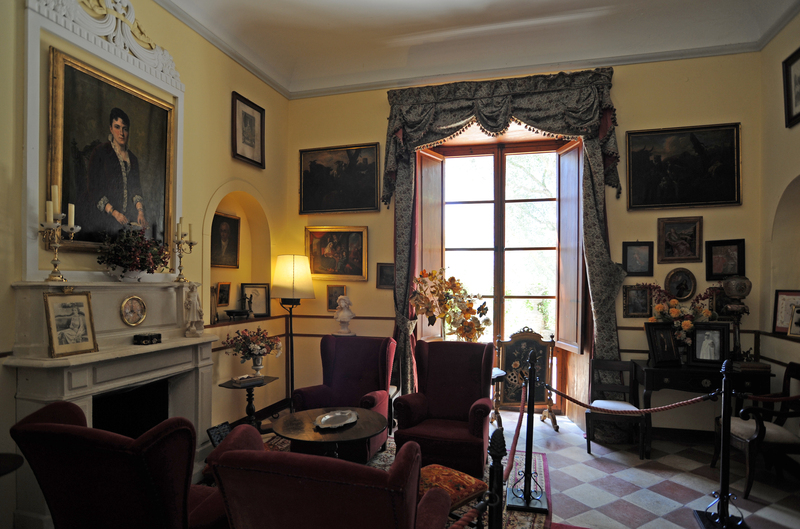 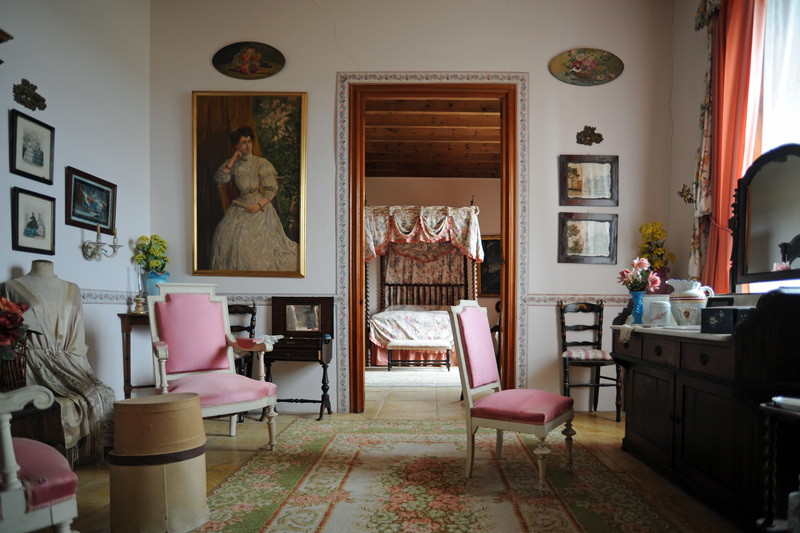 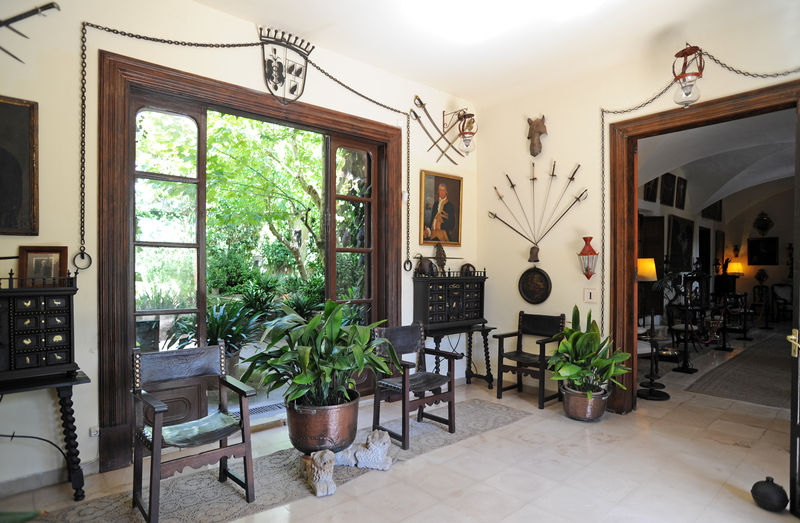 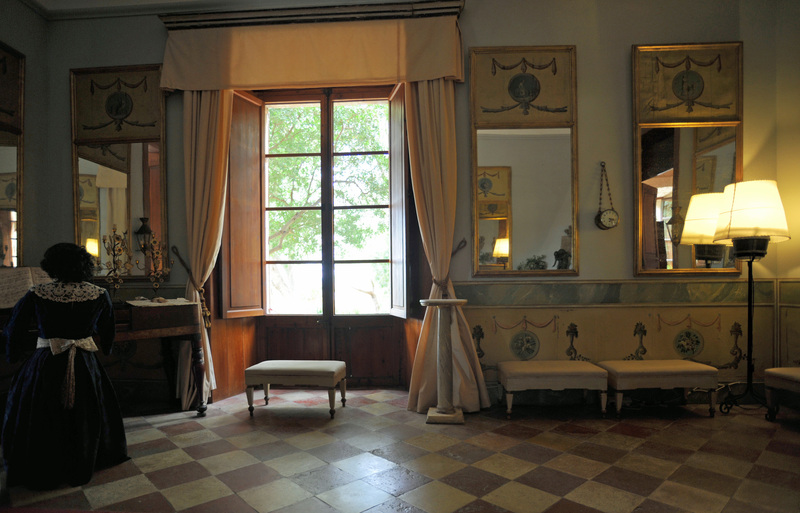 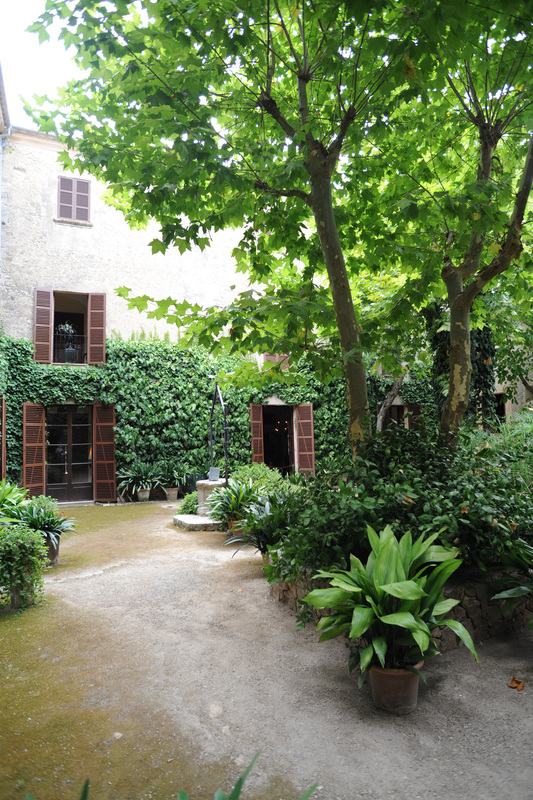 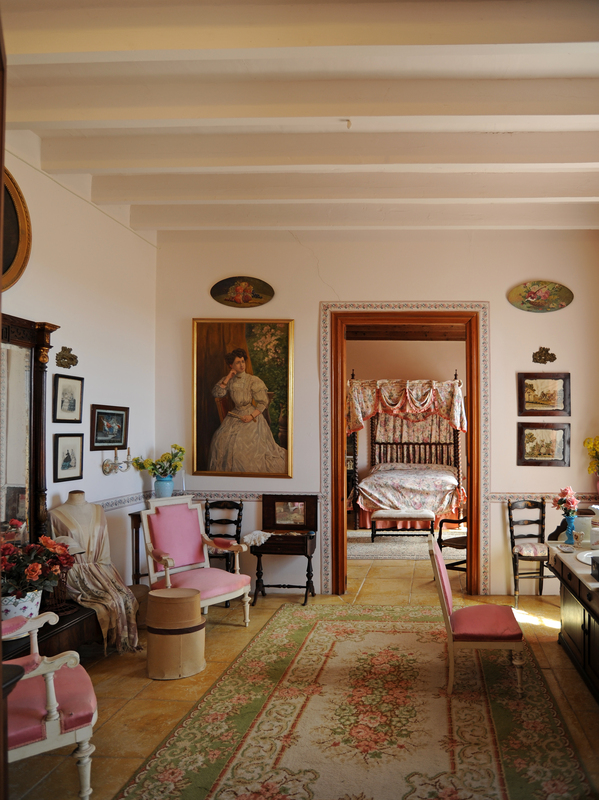 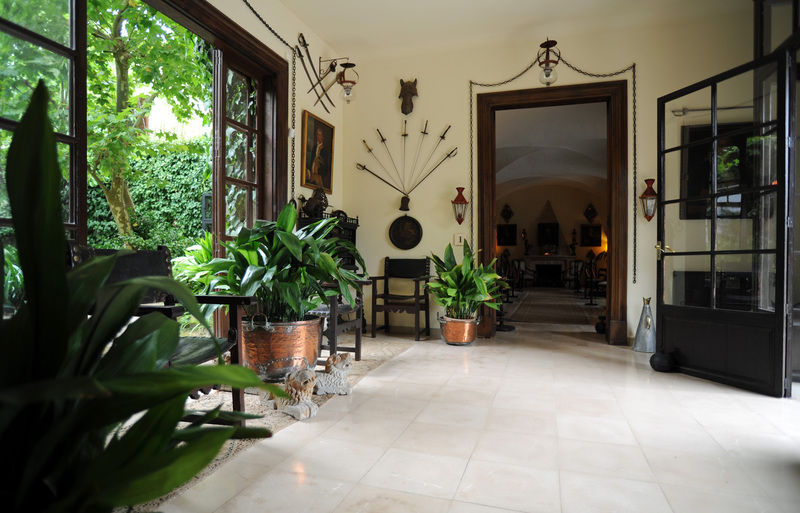 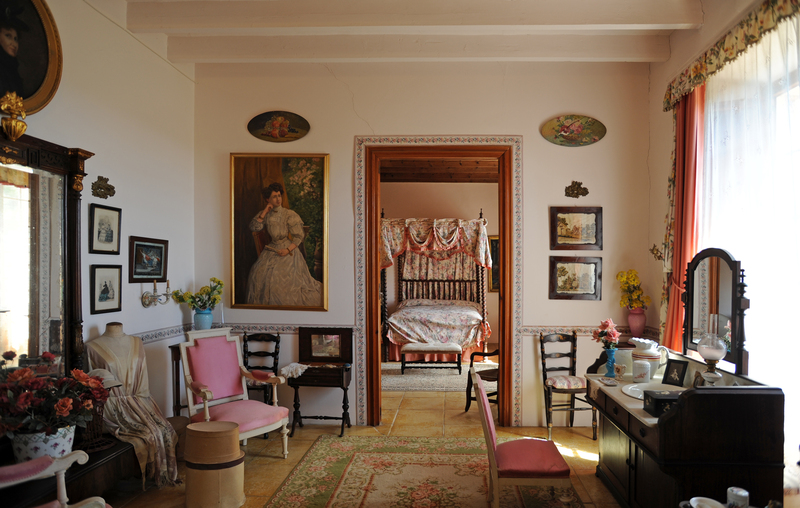 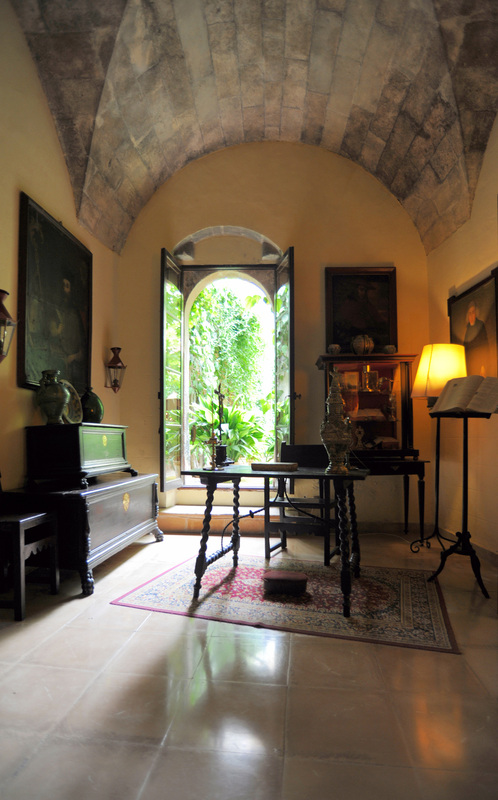 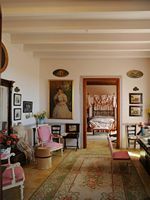 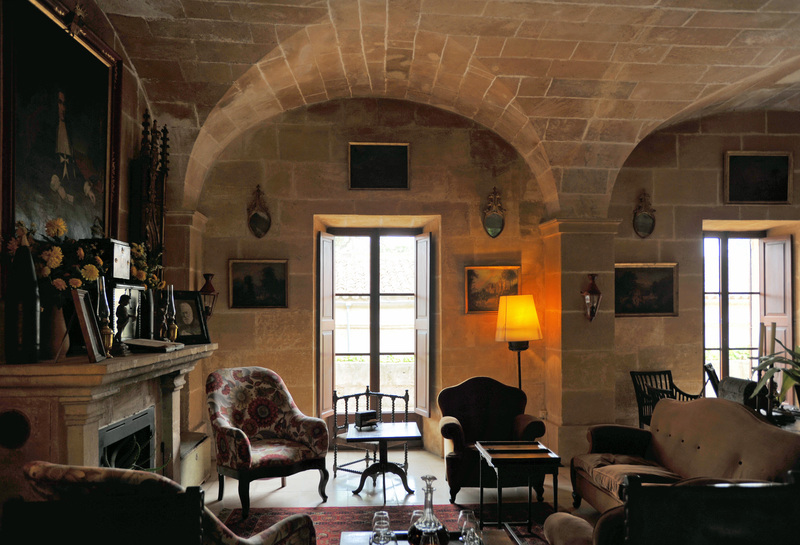 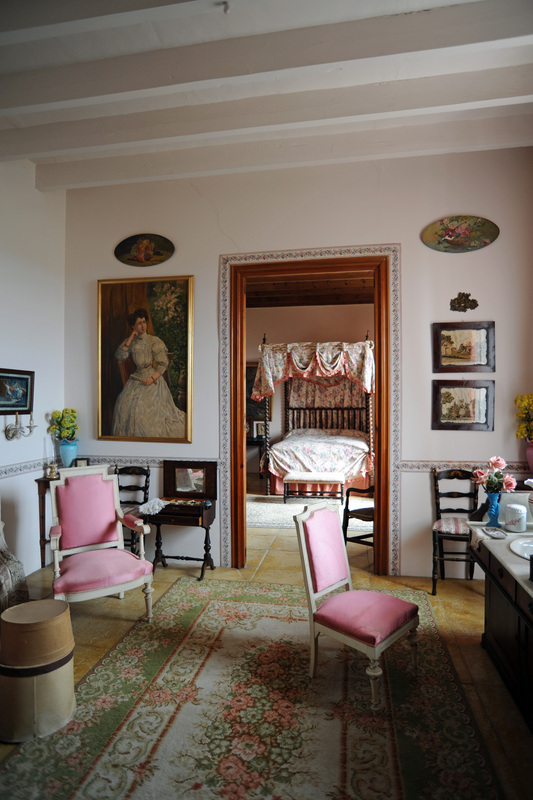 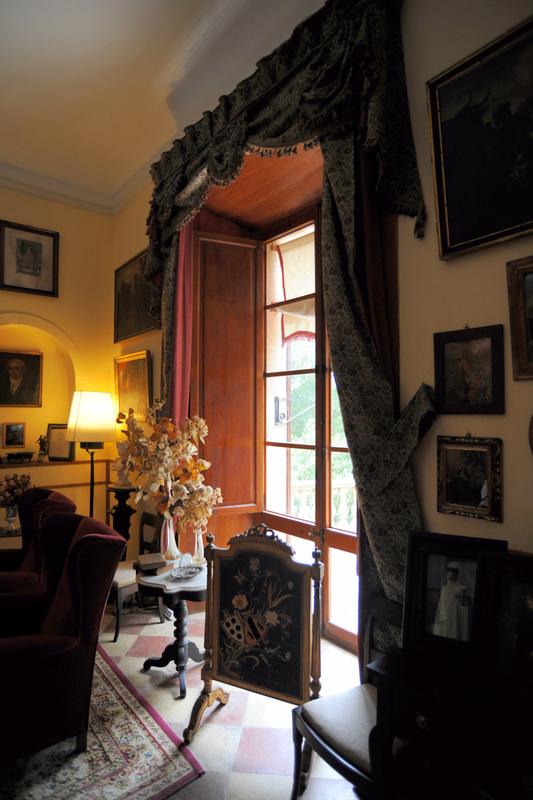 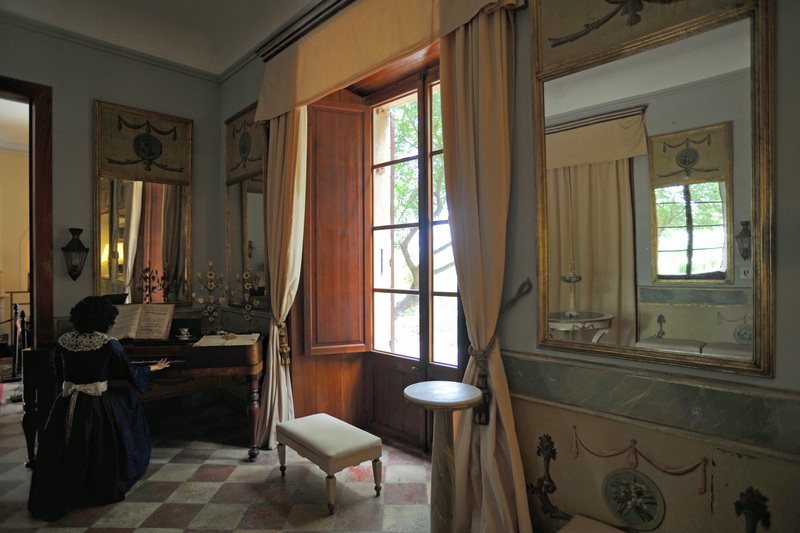 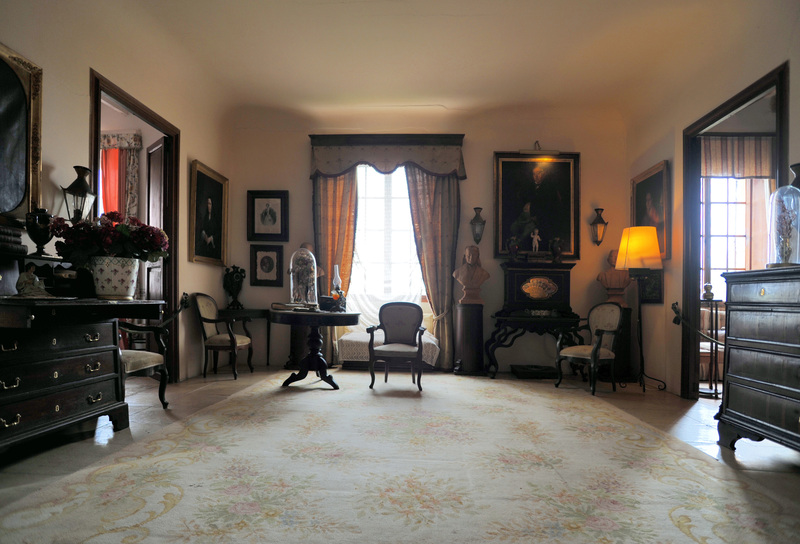 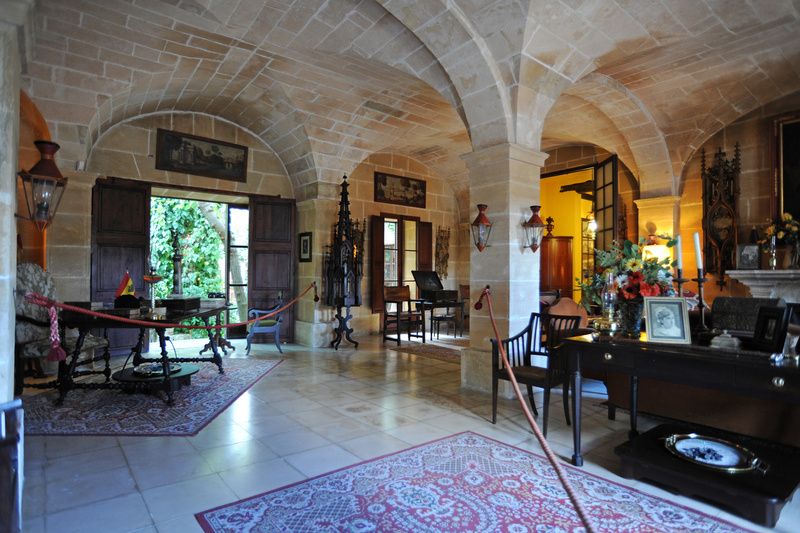 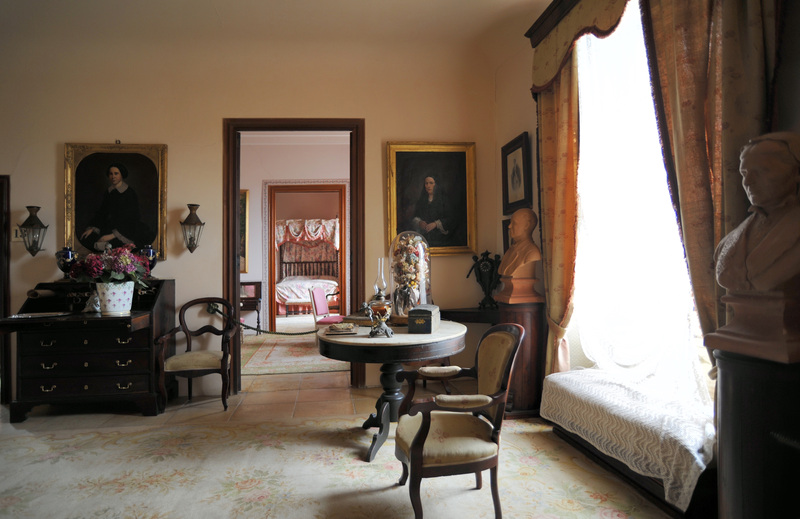 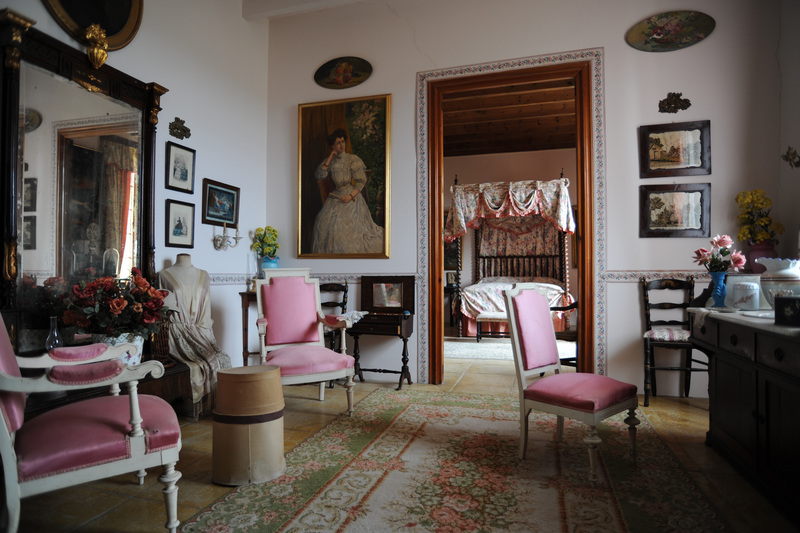 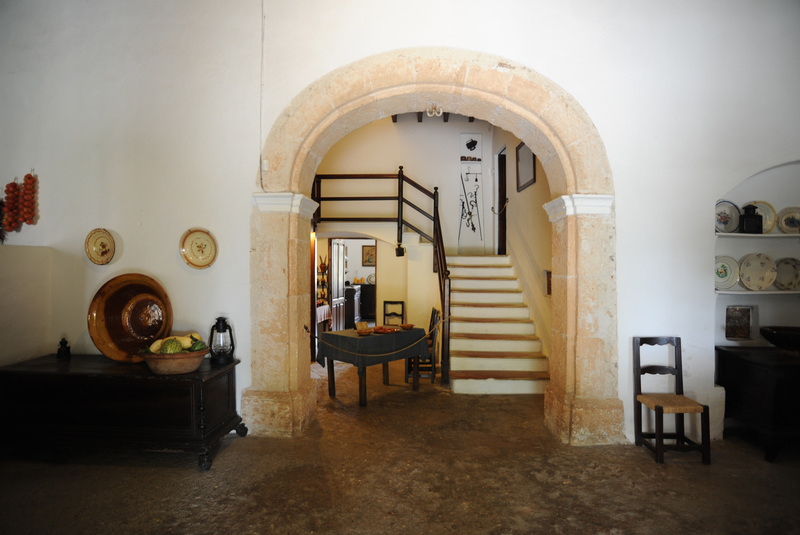 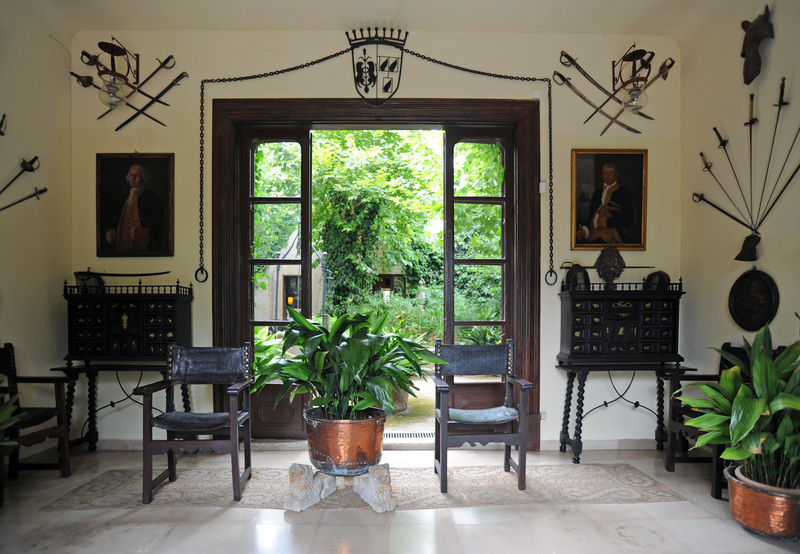 The parlor, which follows that of Madame, offers an interesting Majorcan furniture and Majorcan landscape paintings of the eighteenth and nineteenth centuries. 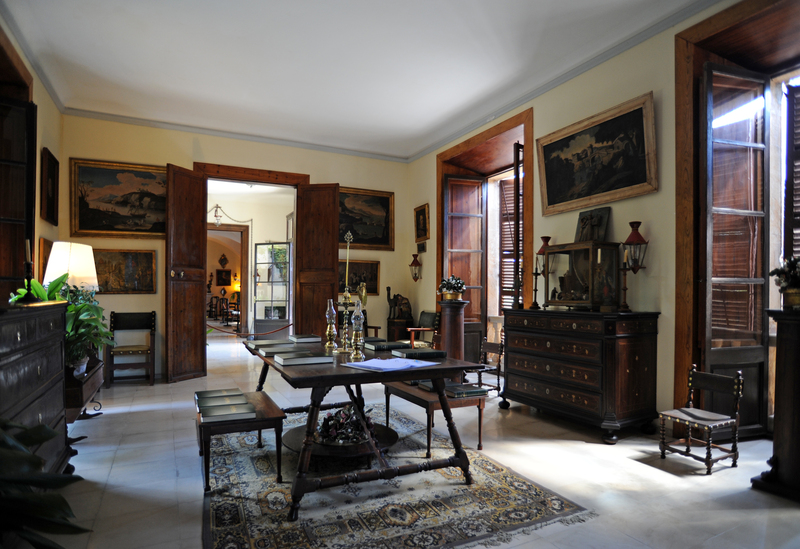 The living room occupies a large space where before there were kitchens. 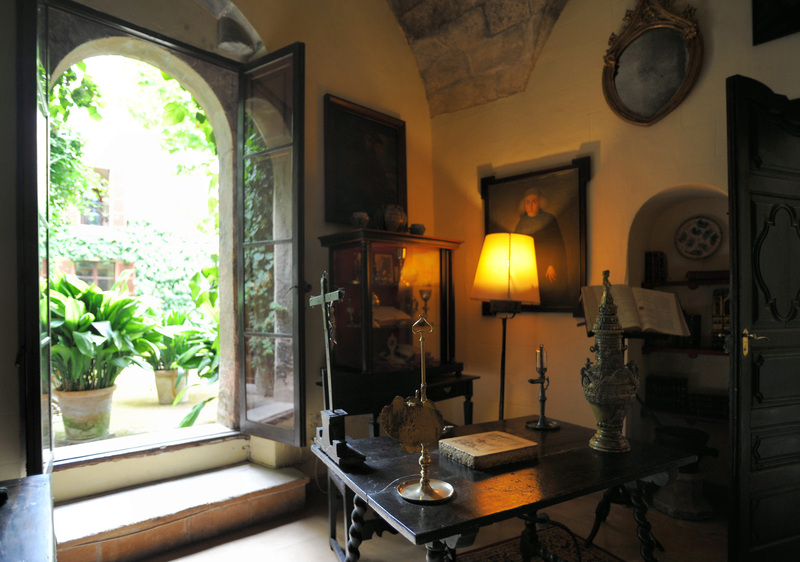 We also note parts from a monumental crib, portraits of Philip II and Philip IV, and a bust of a nun, or perhaps a "Mater Dolorosa" from an altarpiece. On the table is a book that you can sign or write down their impressions. 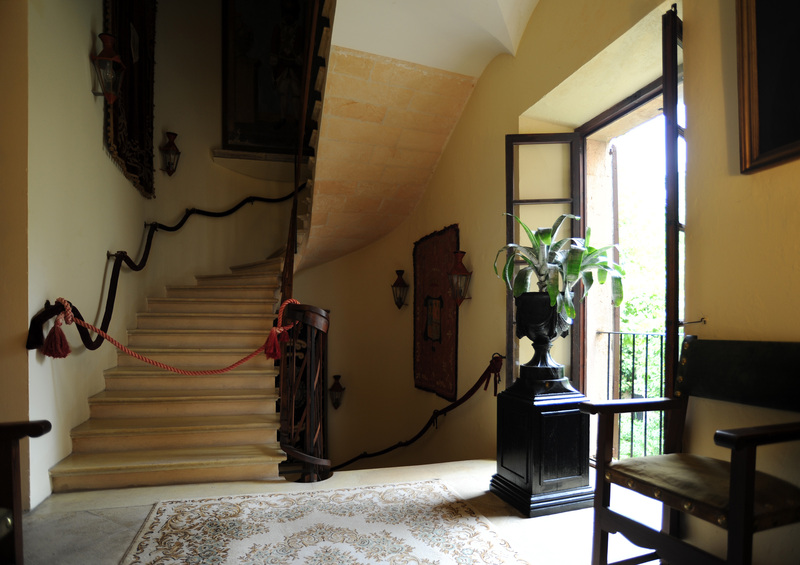 Left the show begins the stairs up to the second floor where you can continue the tour of the mansion. 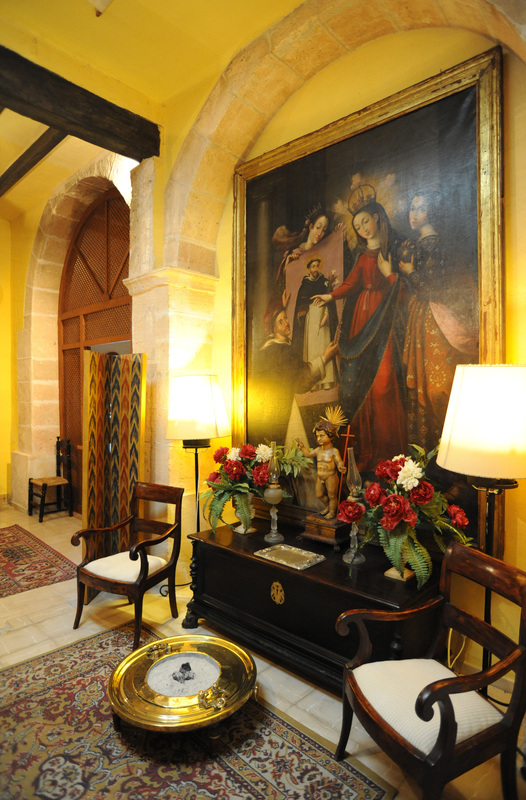 The lobby includes decorative elements, such as a lamp and monumental portrait of a bishop of the Sentmenat family. 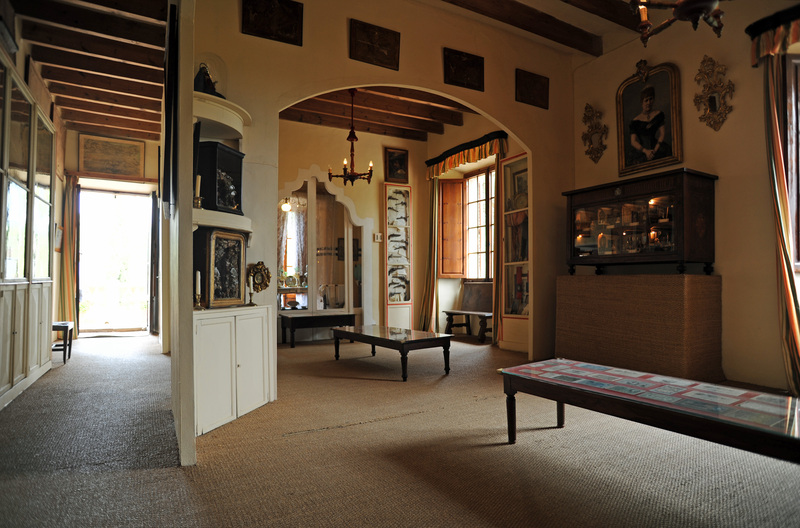 The staircase has heraldic tapestries adorning the wall. 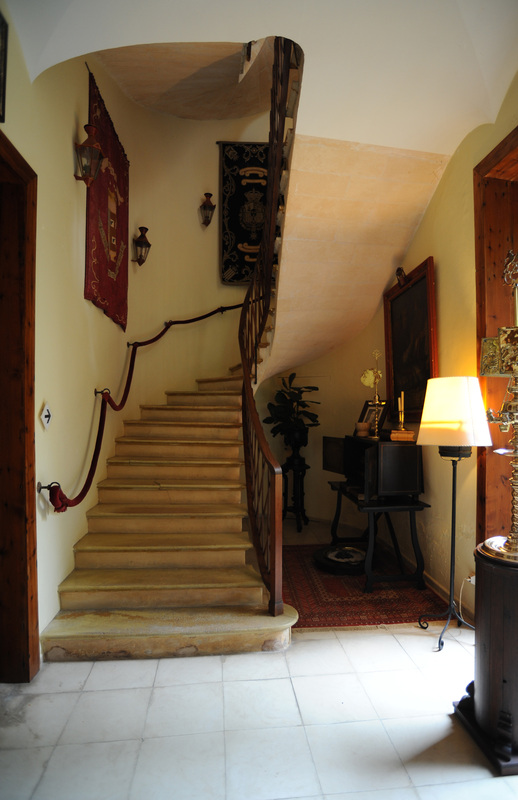 This staircase is unusual that the steps are less high as it goes. 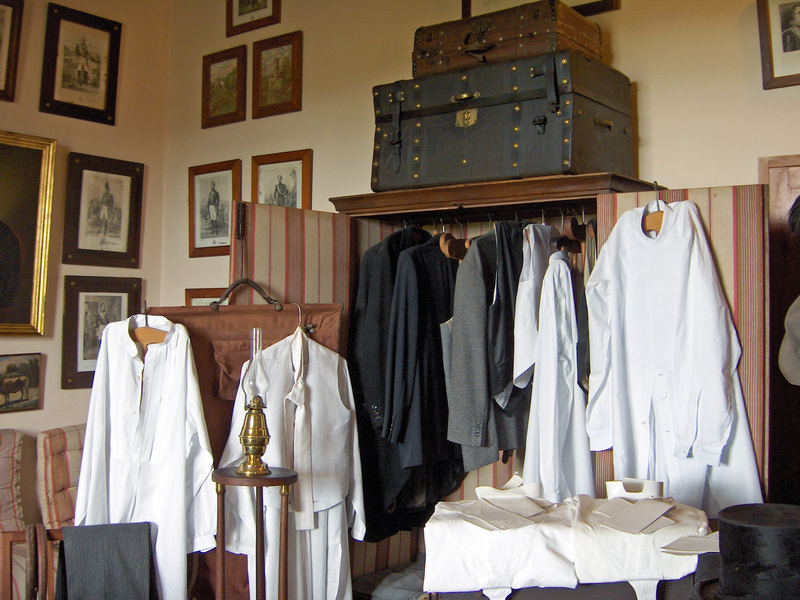 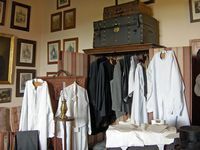 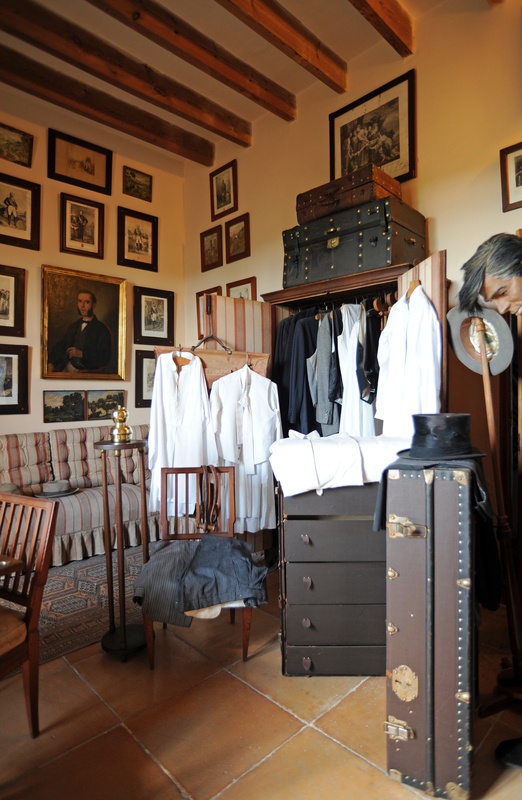 Upstairs are the bedrooms of the Masters with a total of five rooms served by a hallway and a service corridor: the hall, opposite the staircase gives access to the wardrobes of Mr. 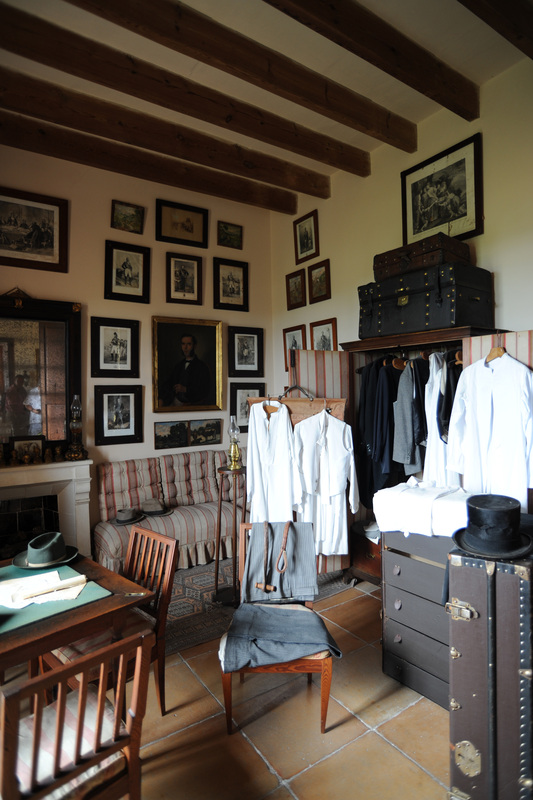 Right, and the wardrobes of Madame left. 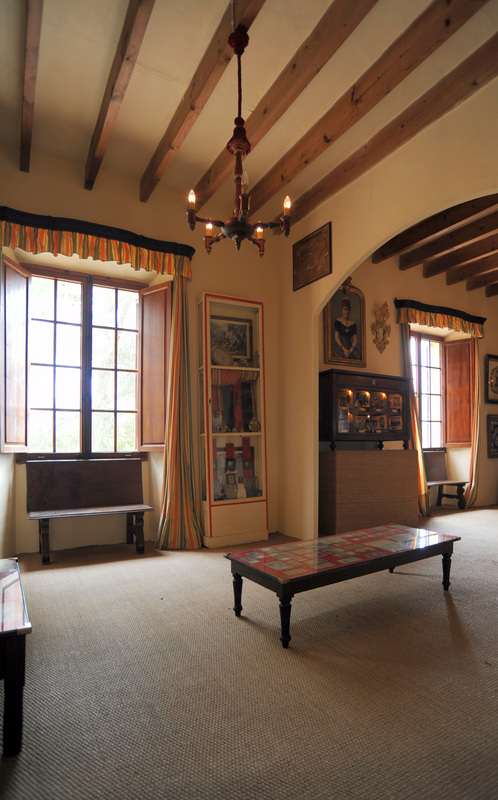 The lobby has a large number of objects and curiosities: the chronological framework of the popes (Leo XIII to 1878), the kings of Spain, and emperors of the Holy Roman Empire, plans and maps (map of Palma, 1894), and various religious images, as a Franciscan Arbor Seraphico. 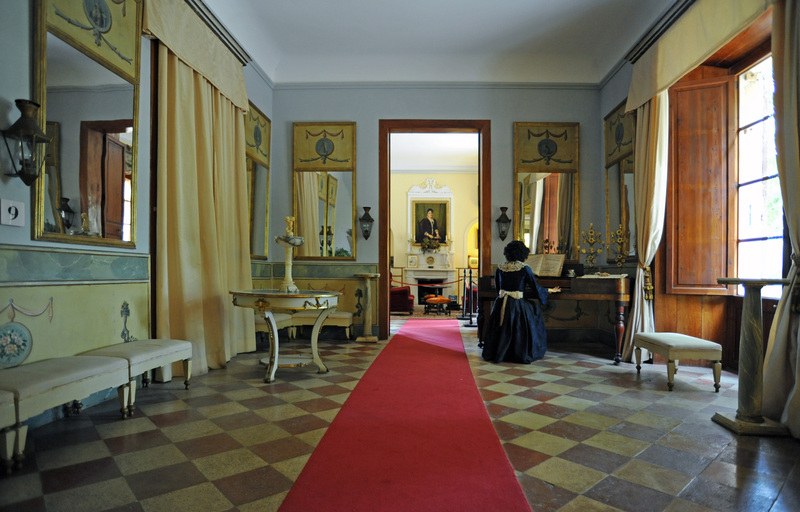 To the left of the hall, the tour continues through the service corridor, long and narrow, designed for the servants and maids do not go in the middle of the rooms. 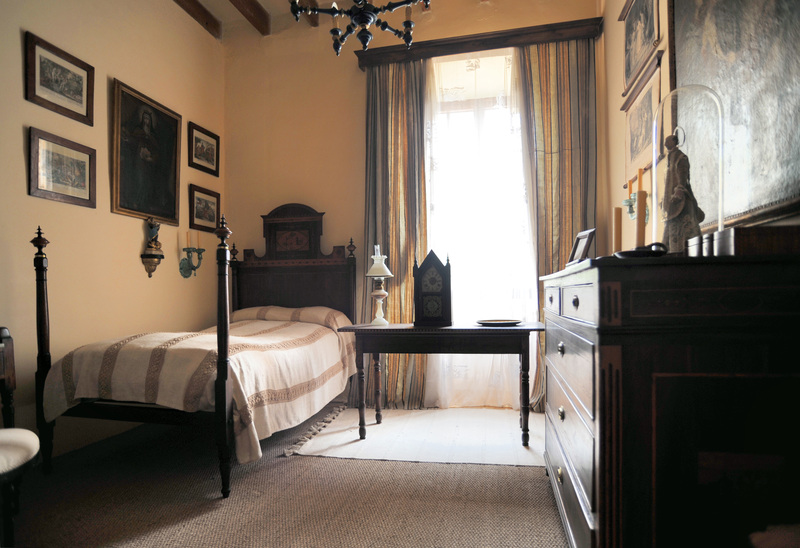 The service corridor gives access to the master bedroom, a single bedroom and a bathroom toys. 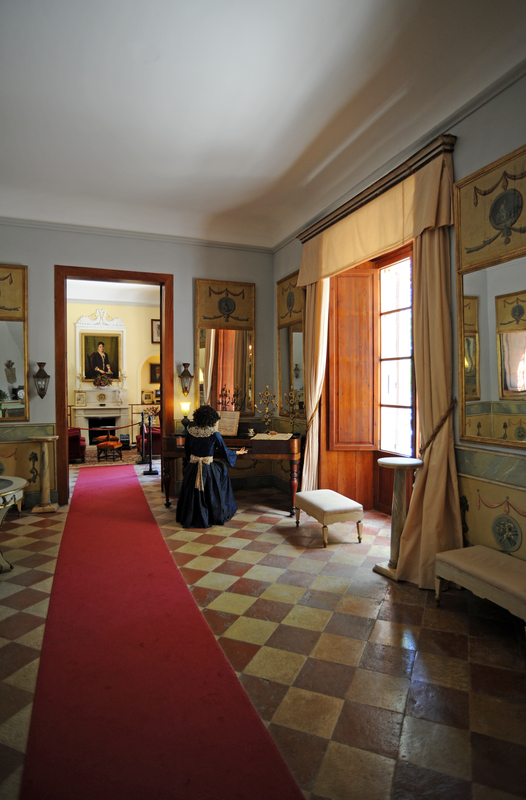 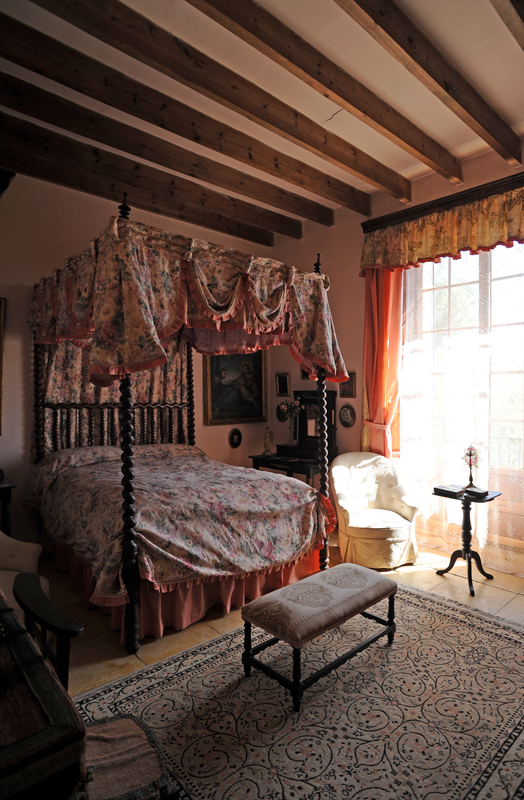 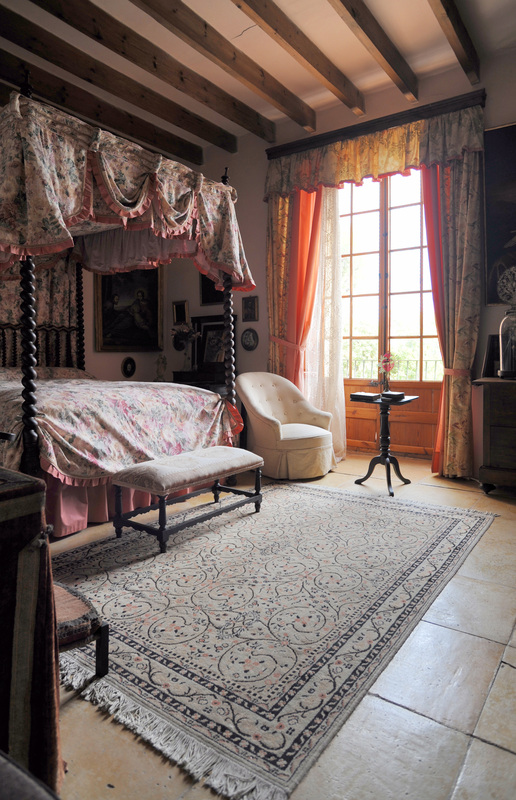 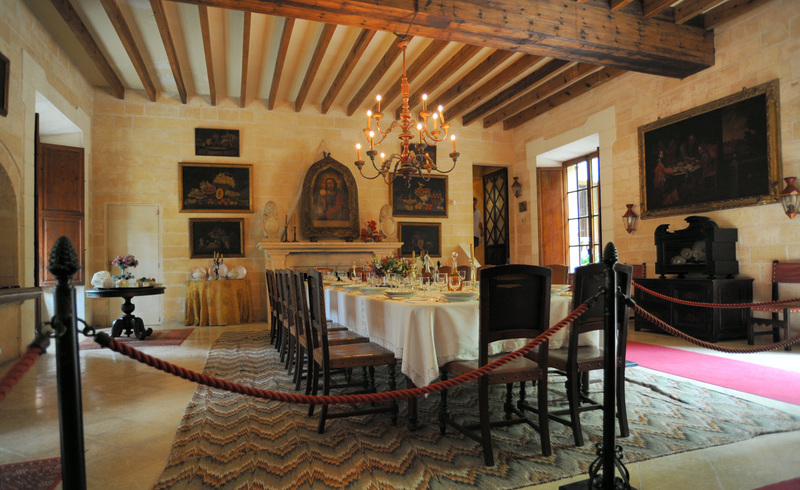 These rooms are decorated in styles of the seventeenth and nineteenth centuries. 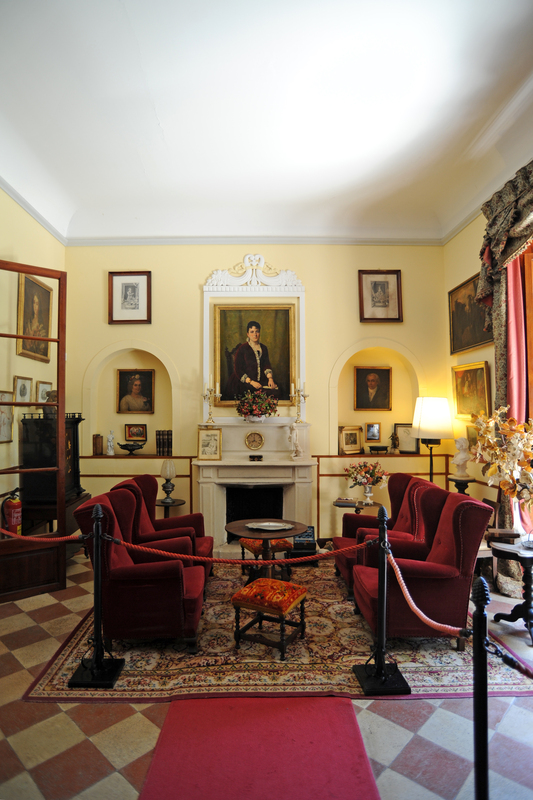 To the left of the hallway, closets Lady has a nice convenient laundry and a painting that is a copy of the portrait of the Countess of Ribas by artist Antoni Ribas. 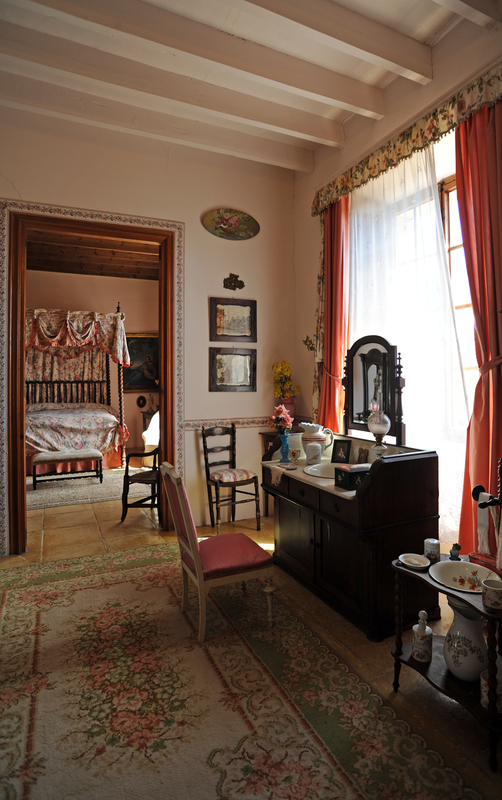 The wardrobes of Madame, a door leads into the bedroom. 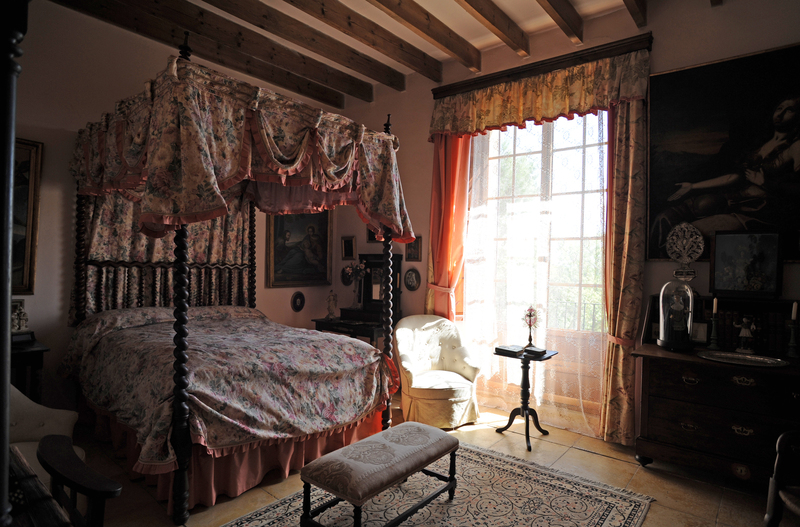 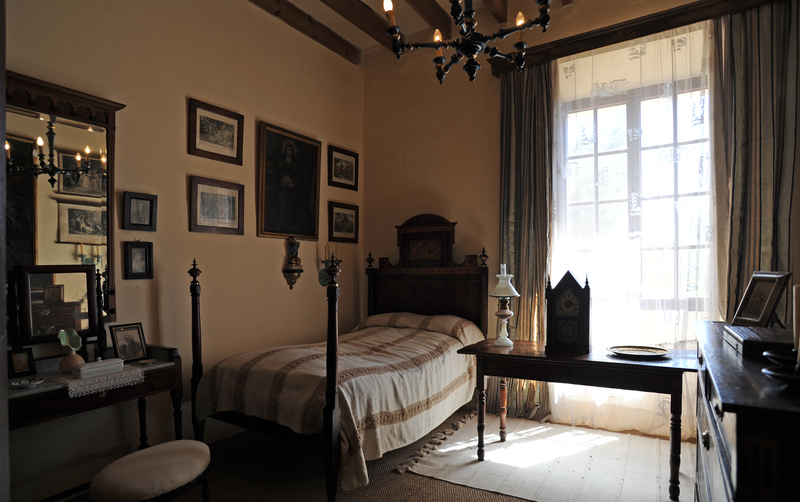 To the right of the hall, the first room you see is the bedroom of the Masters. 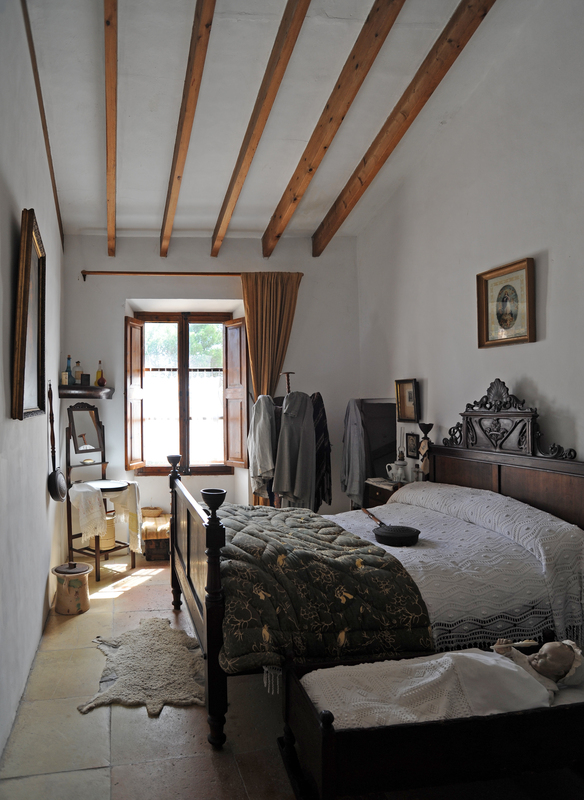 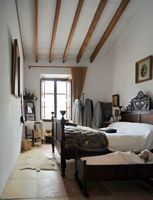 The bedroom is furnished with an elegant canopy bed, a typical example of a classic bed Mallorca, and a "canterano" traditional three drawer cabinet whose exterior is decorated with rich inlays. 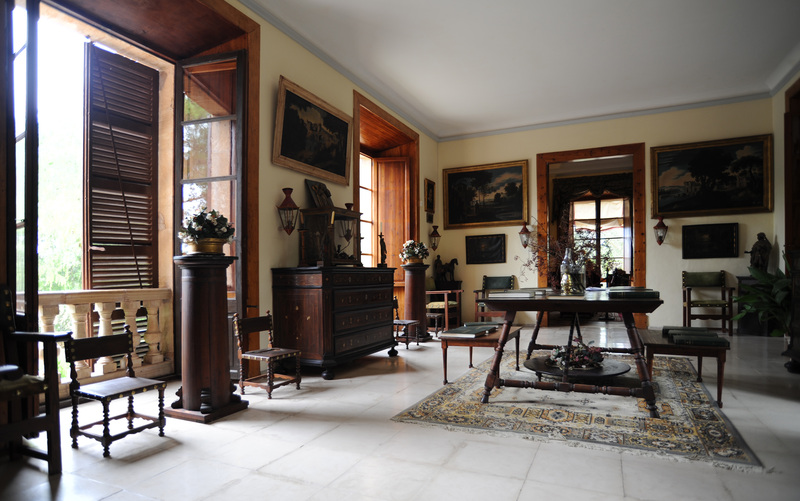 The mahogany furniture comes mainly from the famous city of furniture production in Mallorca, Manacor. 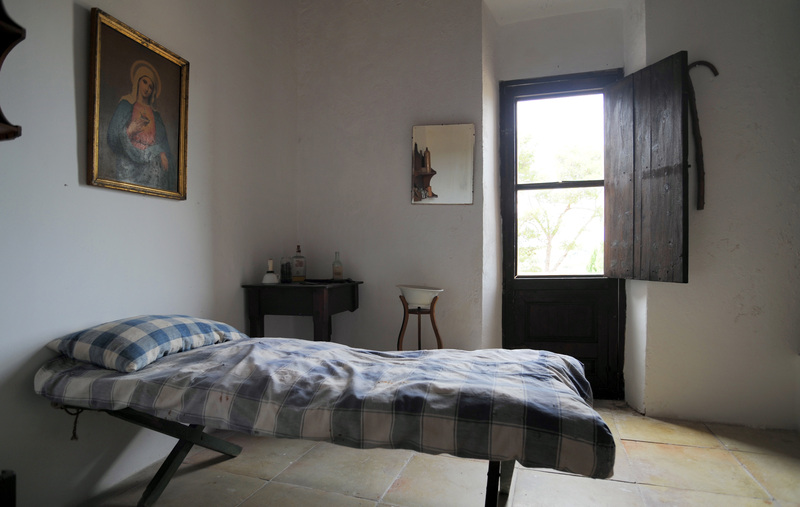 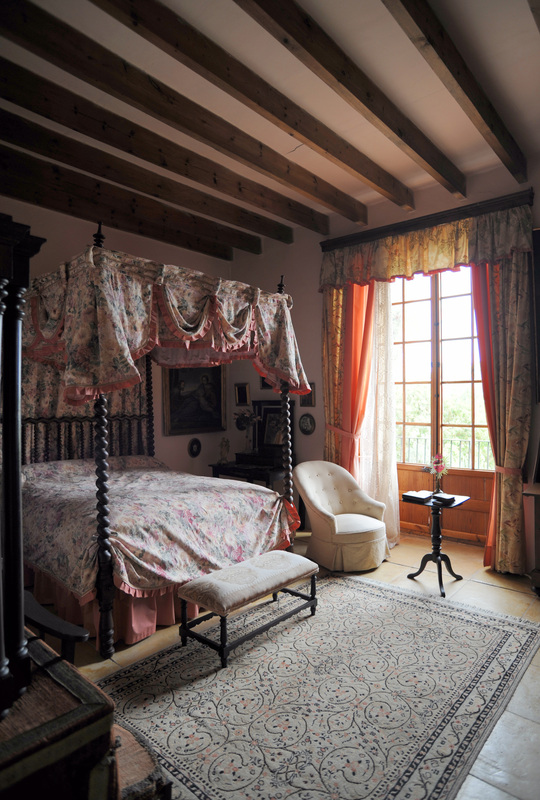 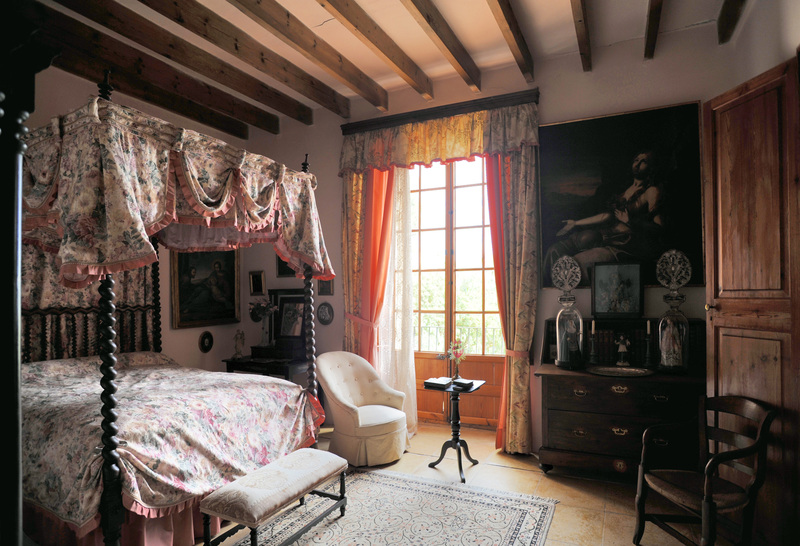 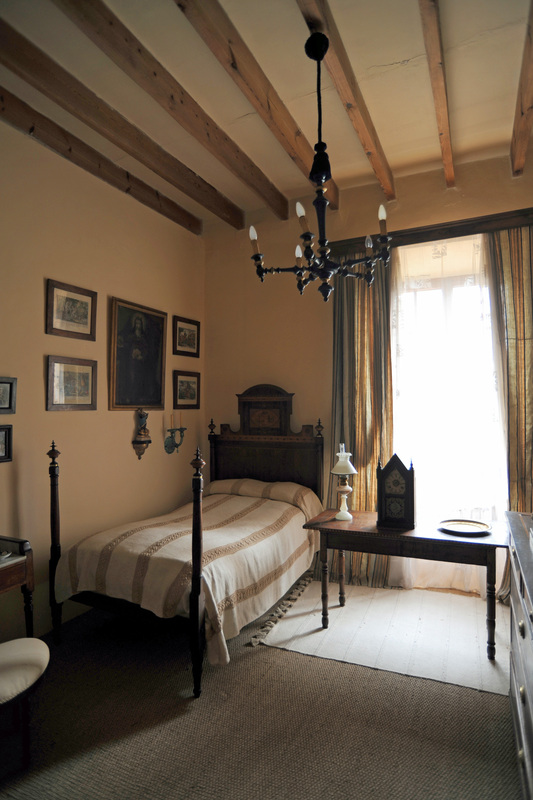 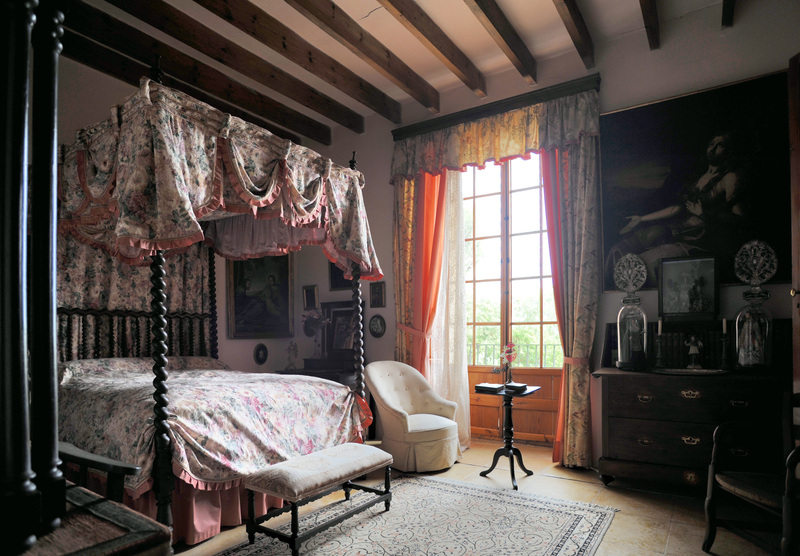 The Master bedroom also contains a table of the Holy Family, another of Maria Magdalena and an image of the Virgen del Carmen. 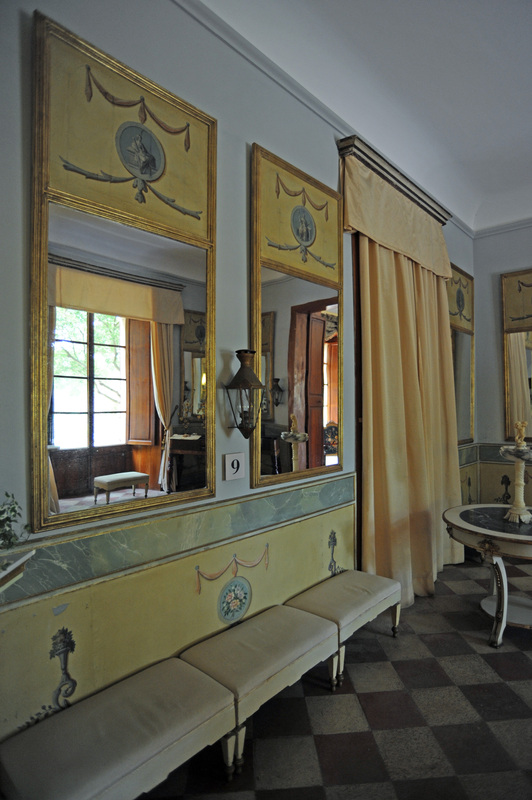 Later in the hallway there is another bedroom with elegant marquetry commode. 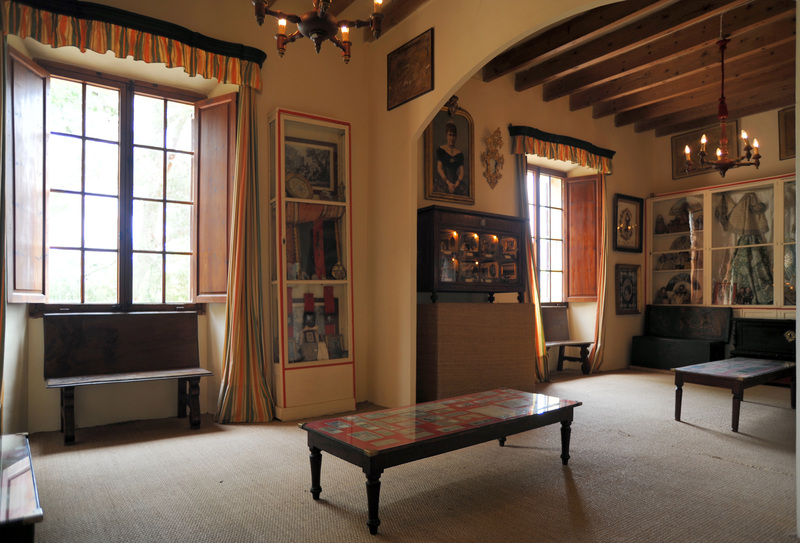 The toy room, also on the right of the hallway, with clothes, boxes, religious icons, costumes, guns, coins and notes, and a dollhouse that reproduces in miniature a house at the end nineteenth century Majorcan, with copies of paintings by Joan O’Neille (1828-1907), above, we see a portrait of Queen Maria Cristina. 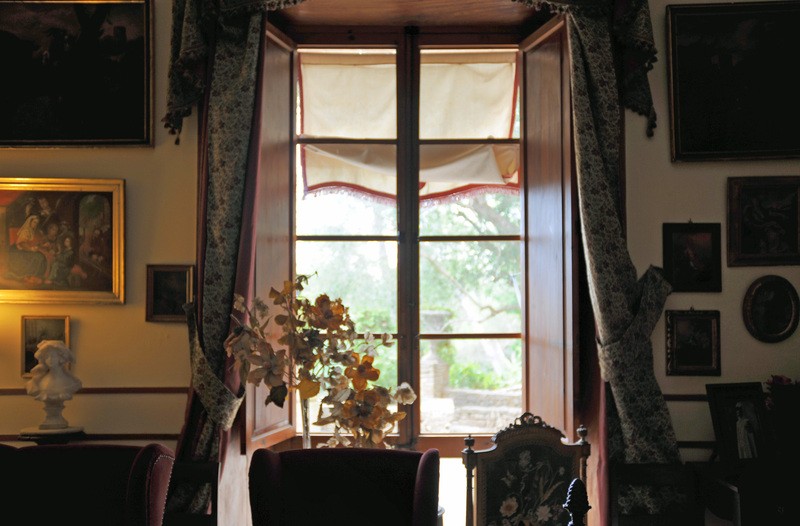 Basically, windows with curiosity at the time. 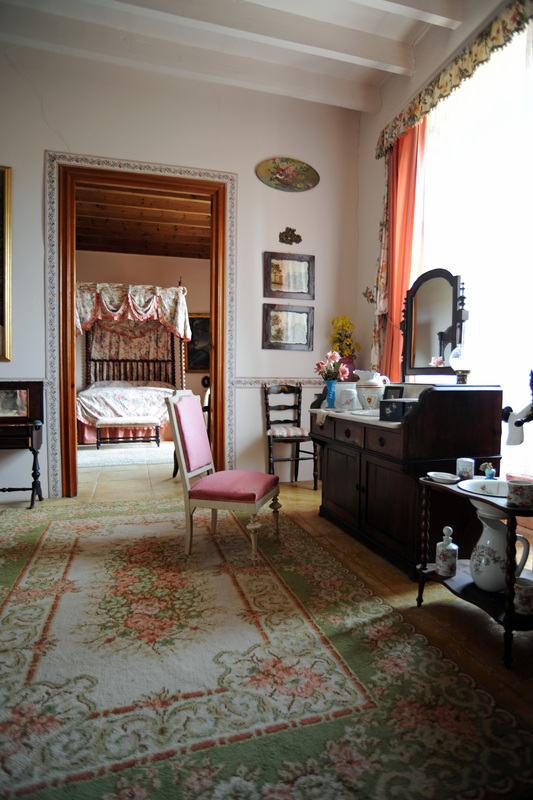 A side of the room is a toy room of bath time. 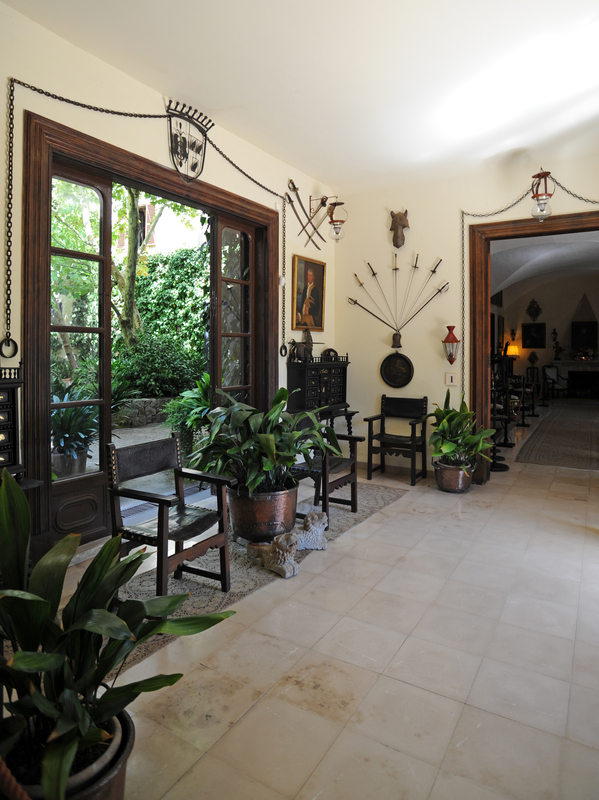 Down the hall you reach the terrace. 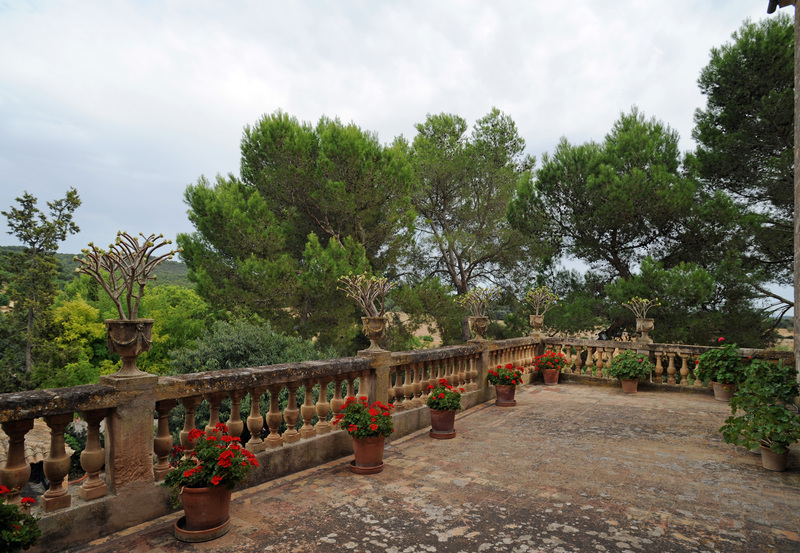 On the right side of the mansion was added a body-storey building topped by a protected by a balustrade decorated jars terrace. 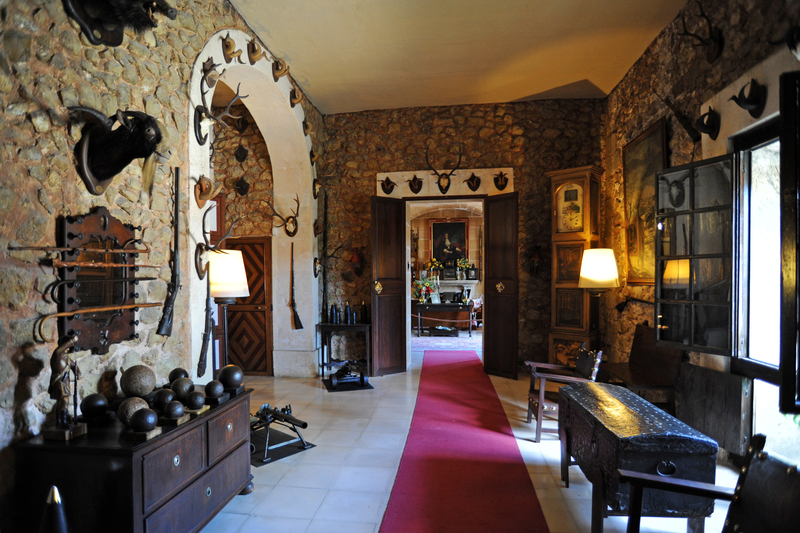 The upper corner of the main building is decorated with gargoyles in the Gothic style. 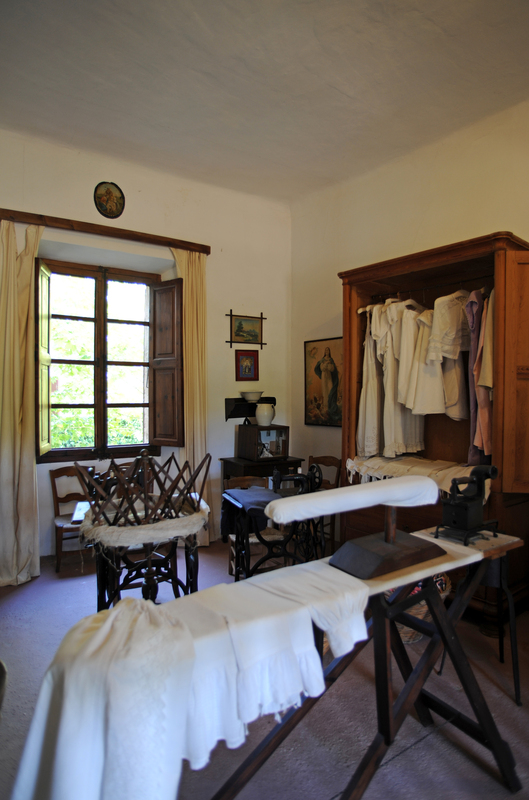 Domestic and sewed them fro, making small talk at the same time. 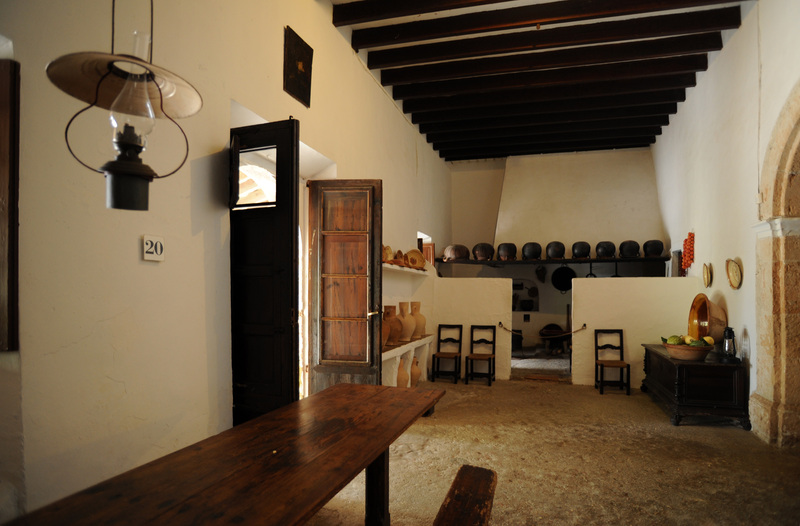 Through a small door lintel, we go into the attic, also known as the "cuartera". 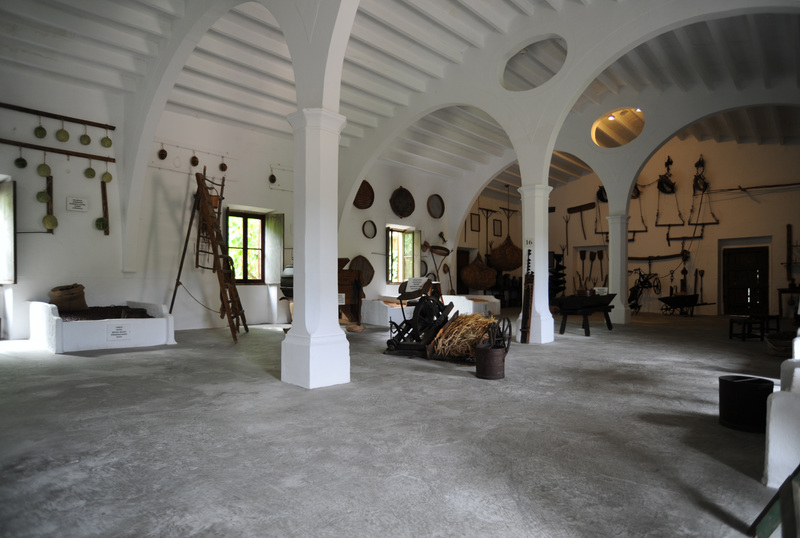 The attic room is very large, with two arches supported by octagonal pillars for three square base with two elliptical openings at the top. 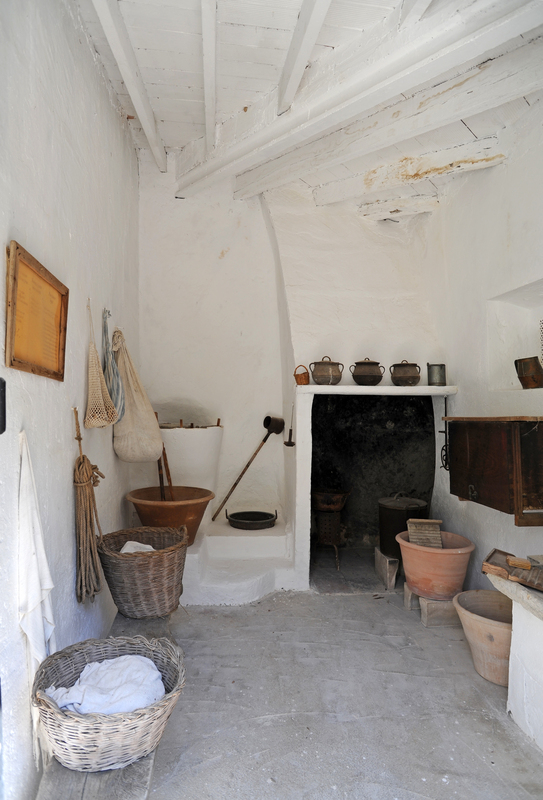 Coming out of the attic at the bottom right, you can see two chambers: the left is very simple, a laborer with a bed of straw. 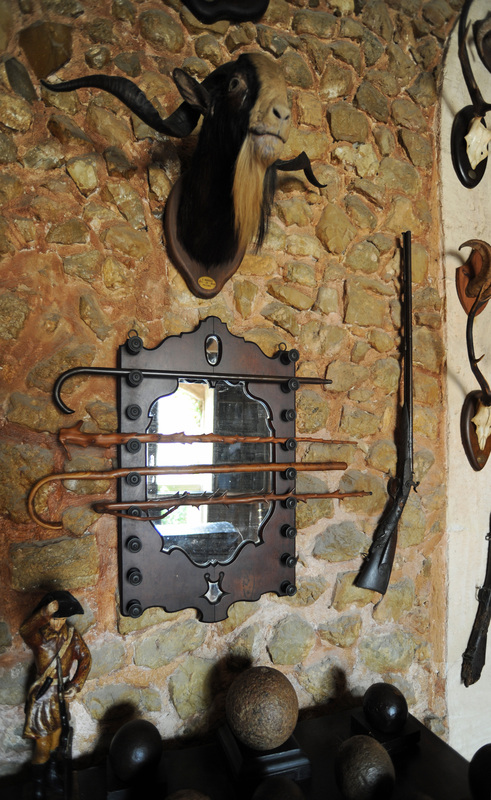 Right, the chamber manager, with today curiosities, like a basin and a maridillo, or heater. 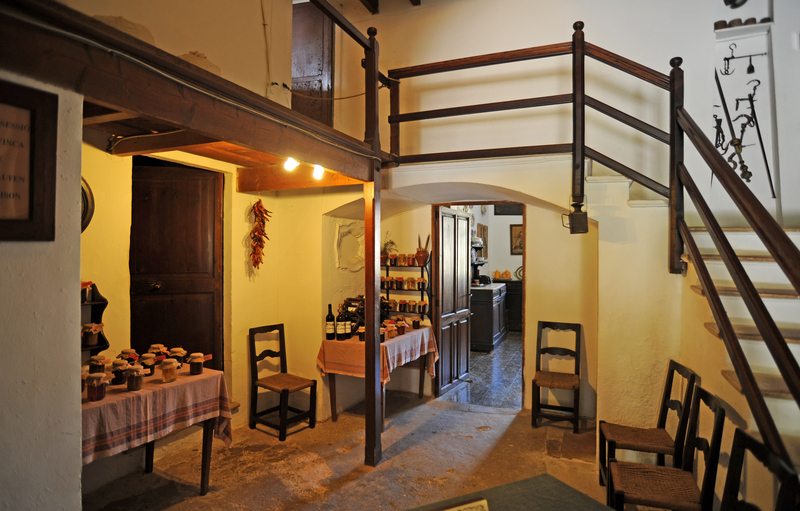 We descend to the ground floor by a staircase to reach the office of the commissioner who has a safe. 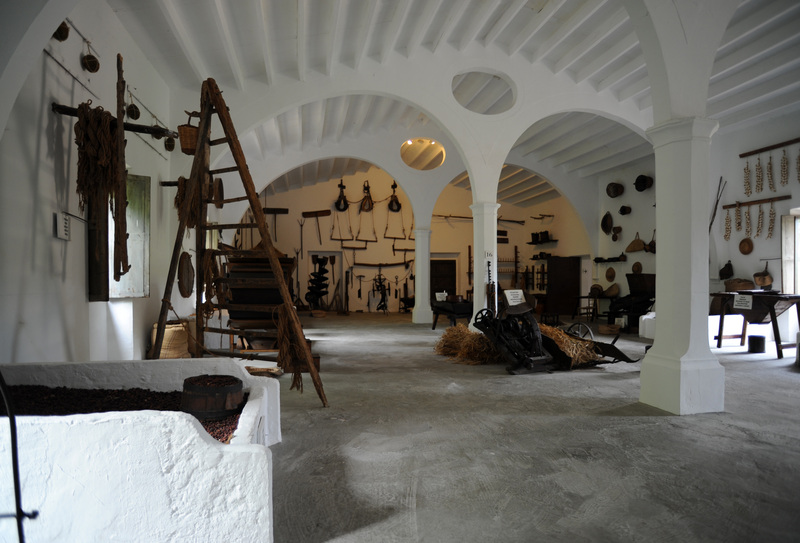 An estate manager of Els Calderers, Antoni Oliver i Gaya (1863-1936), was an important figure who traveled throughout Europe in the early twentieth century, making the import of modern agricultural machinery. 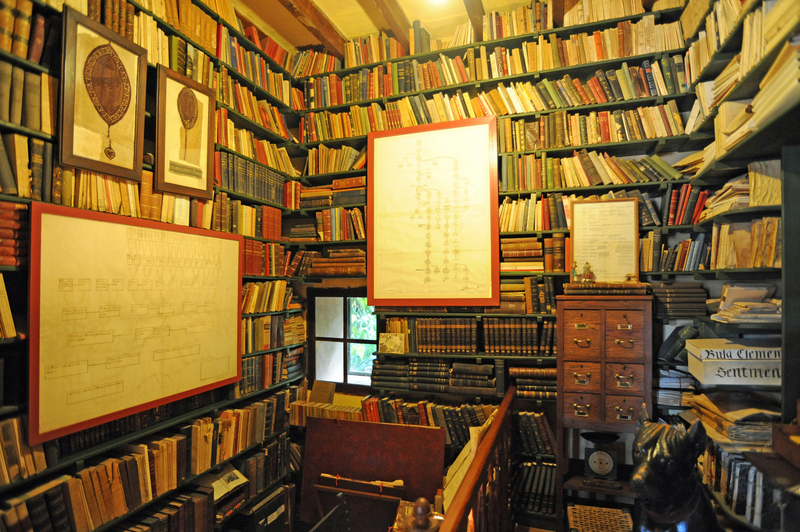 He was called to lecture and write newspaper articles. 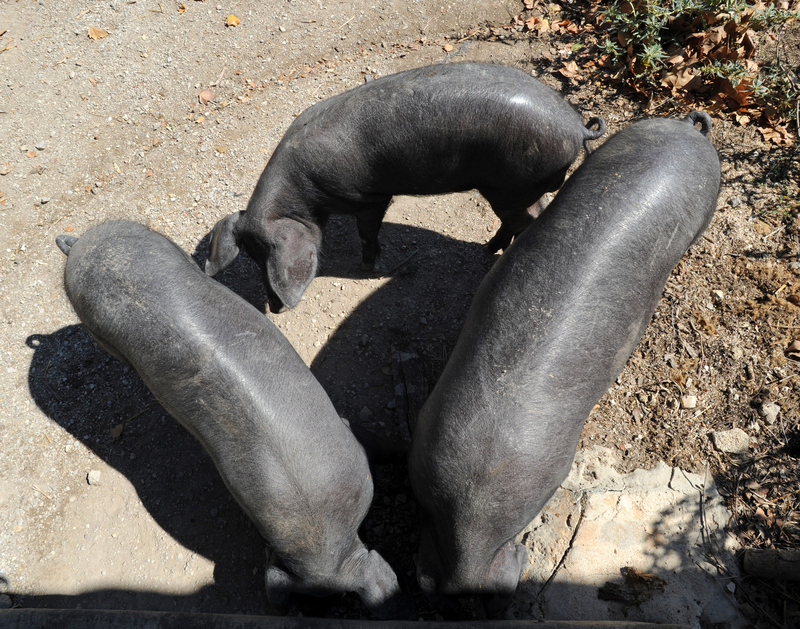 It is renowned for being a great introducer of technical improvements in animal husbandry. 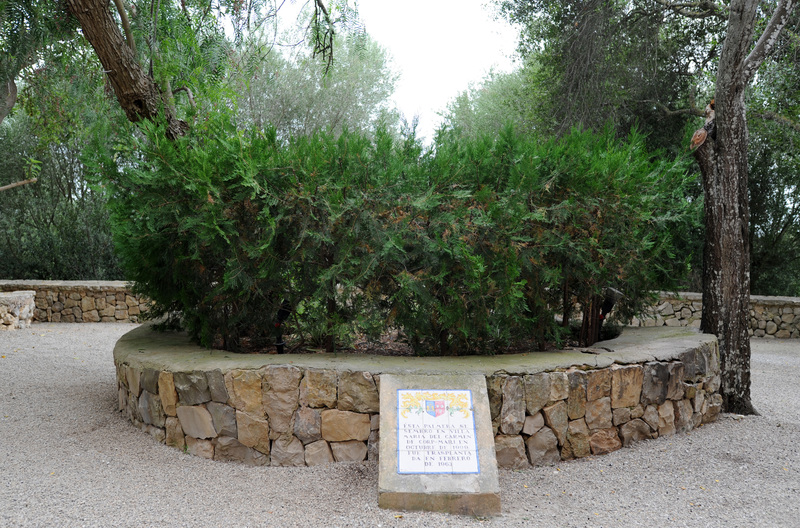 The municipality of Sant Joan called him "Illustrious Son of Sant Joan" and he dedicated a street. 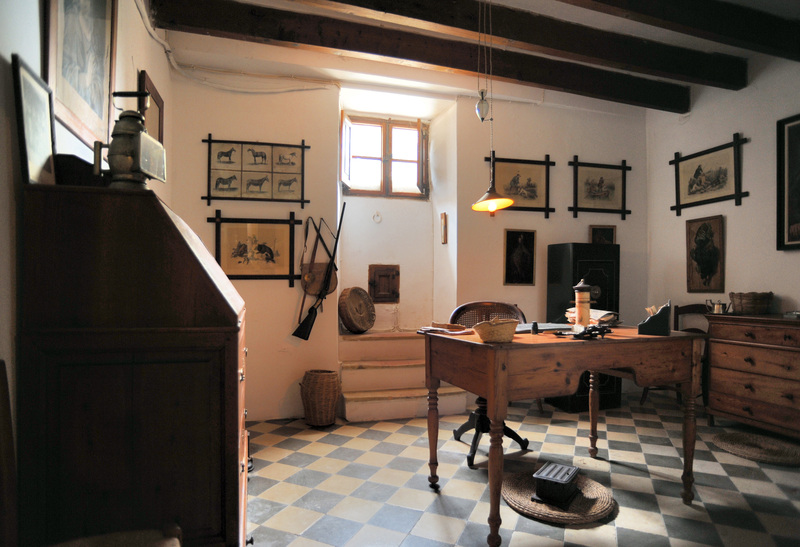 The office has a photo of the family Antoni Oliver in 1919. 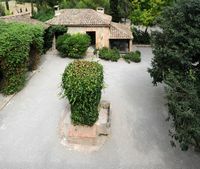 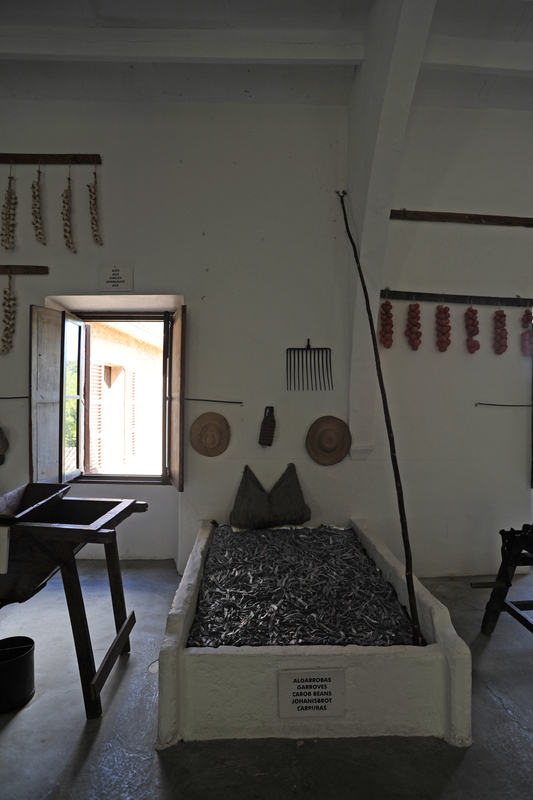 The ground floor housing the controller is divided into two bays by an arch: in the first bay is a typical Majorcan farmhouse kitchen with a large fireplace. On the other side of the arch is the refectory of laborers. 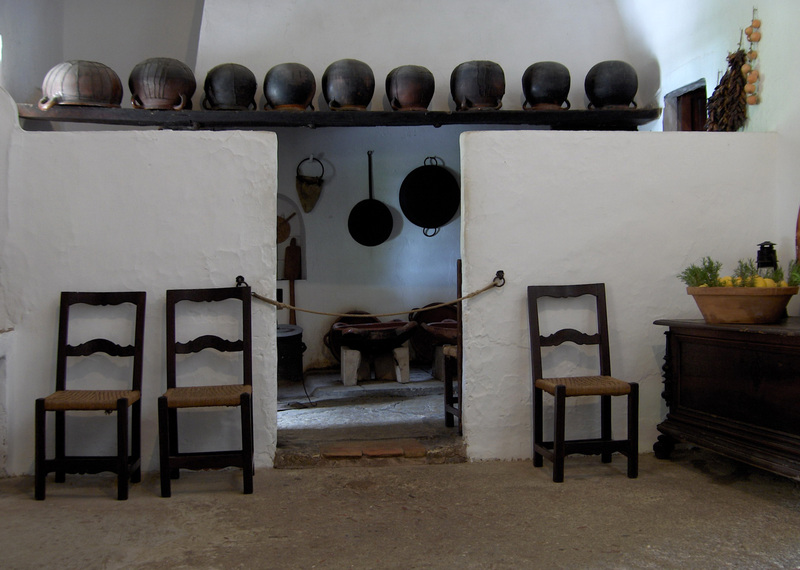 On the left there is a table of farmhands. 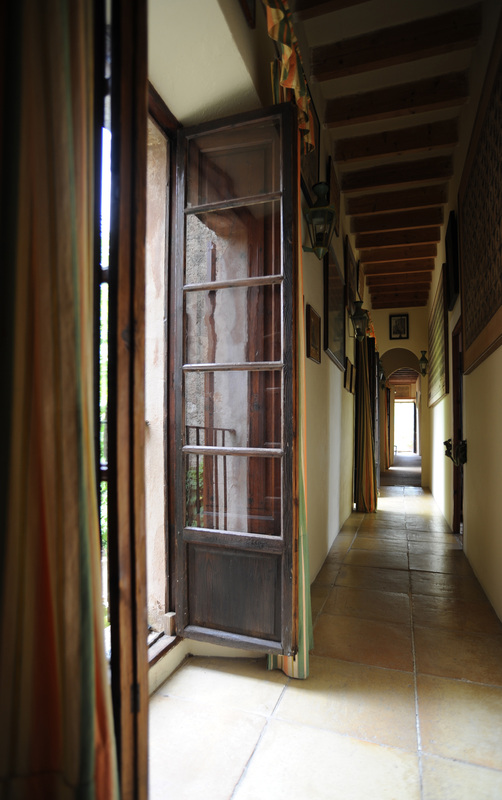 We leave the housing of the controller through a door arched, covered by a canopy. 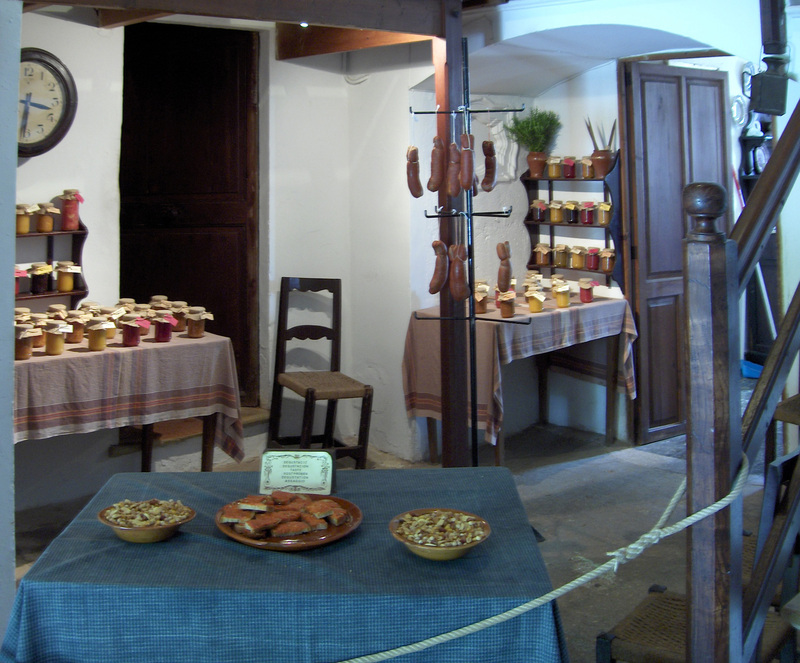 To the left of the door of the manager, is an oven with door lintel, which were baked in bread and coca. 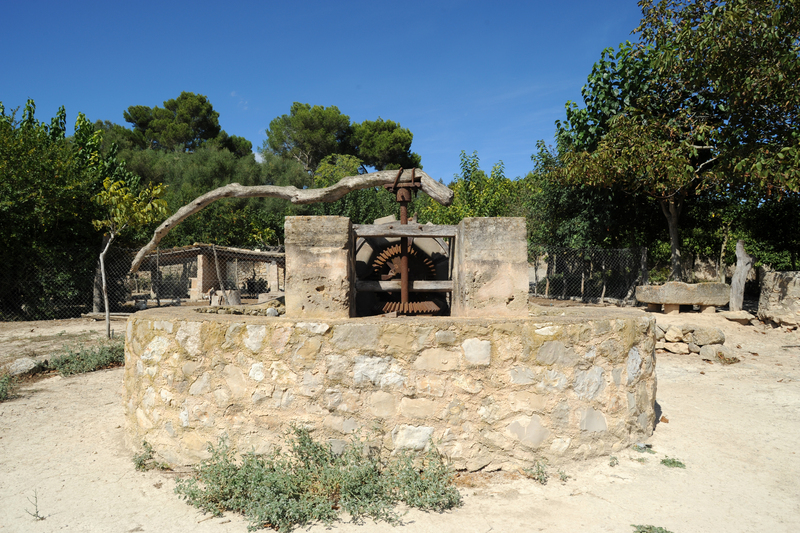 The machines have been replaced by the first single cylinder gasoline engine in Mallorca. 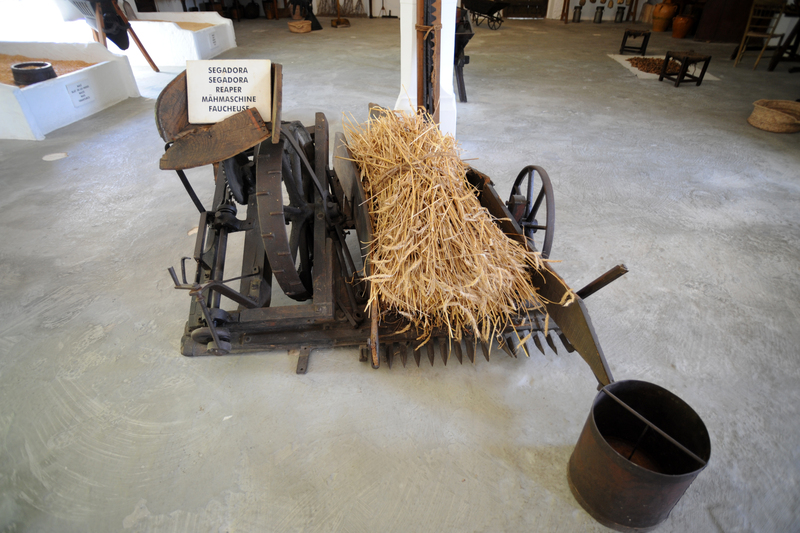 This engine was used to generate electricity and, later, to power grain mills. 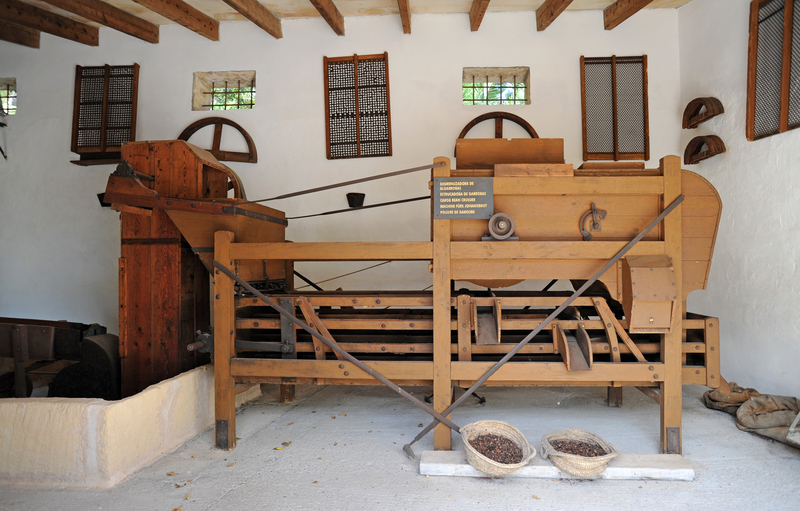 Locust beans, locust seeds are used to feed the pigs, a machine used to grind the bean. 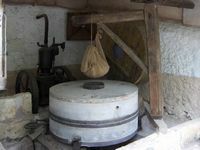 We then go to the laundry room where the linen was washed and dyed fabrics, we see a tank, a fireplace and a utensil called a scoop. 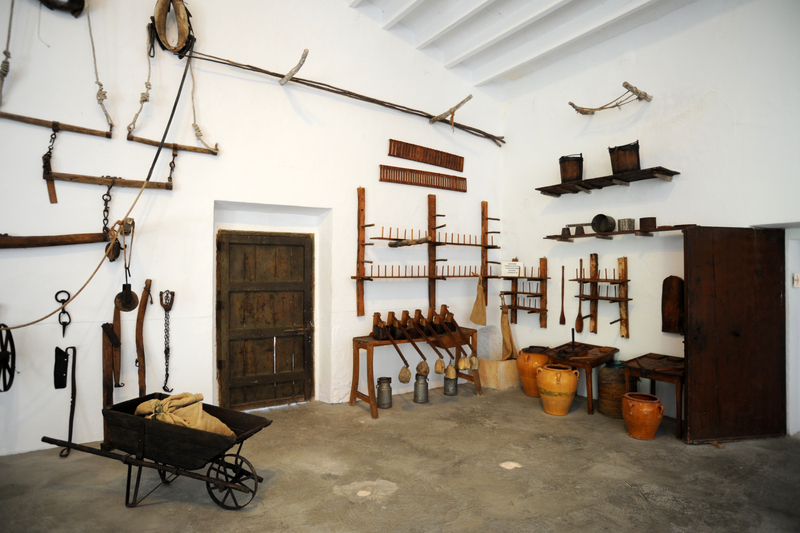 The carpenter’s shop and the blacksmith with the original tools. 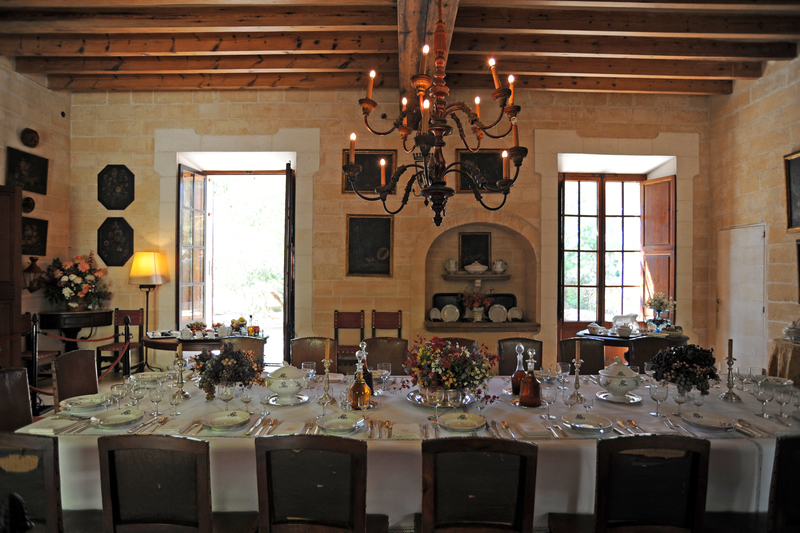 The old barn on the right of the mansion, is now used as a multipurpose hall for weddings and banquets, or for business presentations. 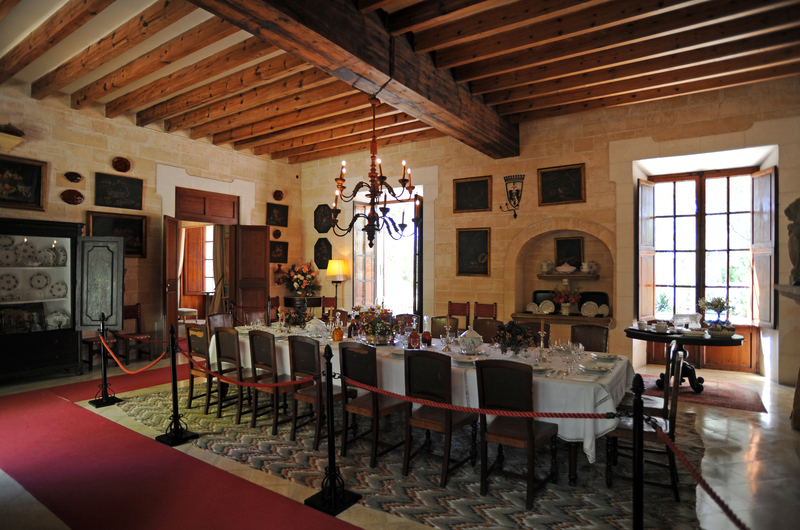 This is a two-storey building surrounded by gardens can be compiled tables banquets. 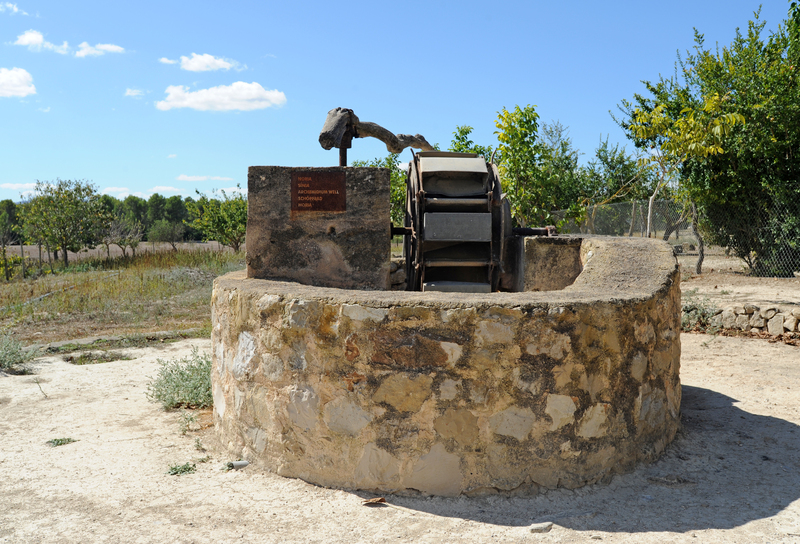 The garden and the orchard were sprayed with a water wheel, driven by donkeys, which drew water from a well. 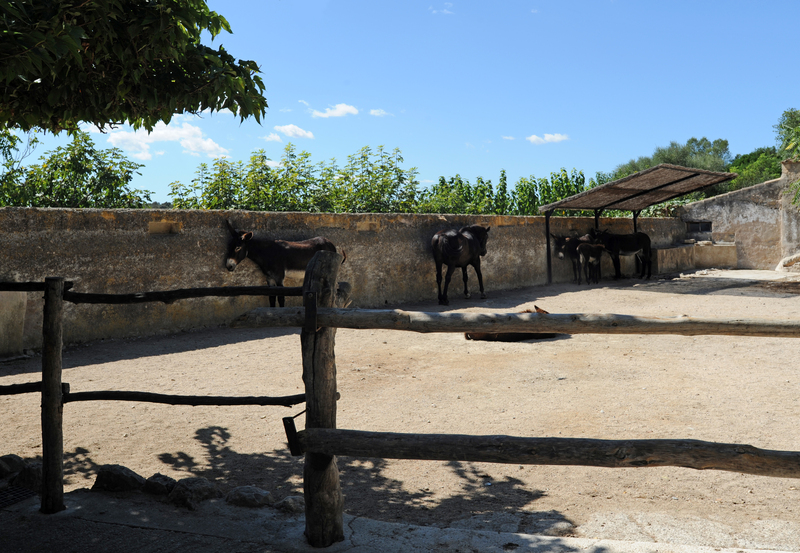 Among the cattle there are draft horses and donkeys once used as a driving force. 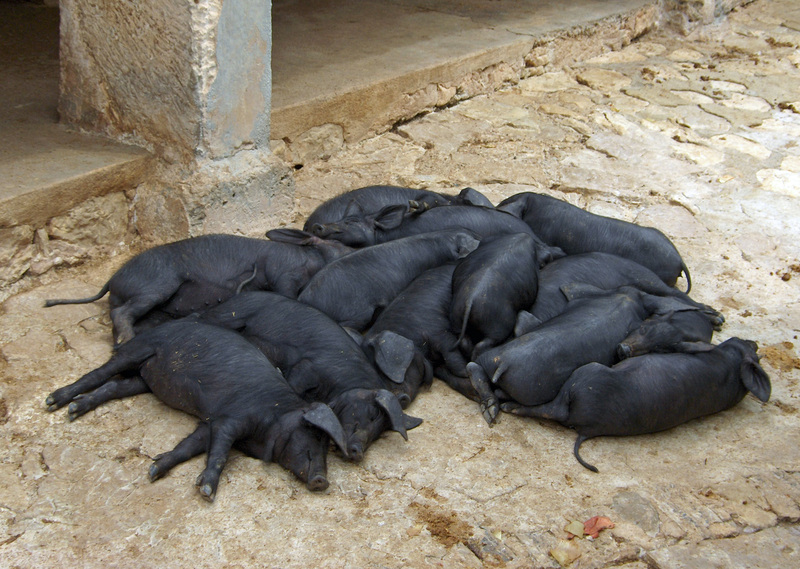 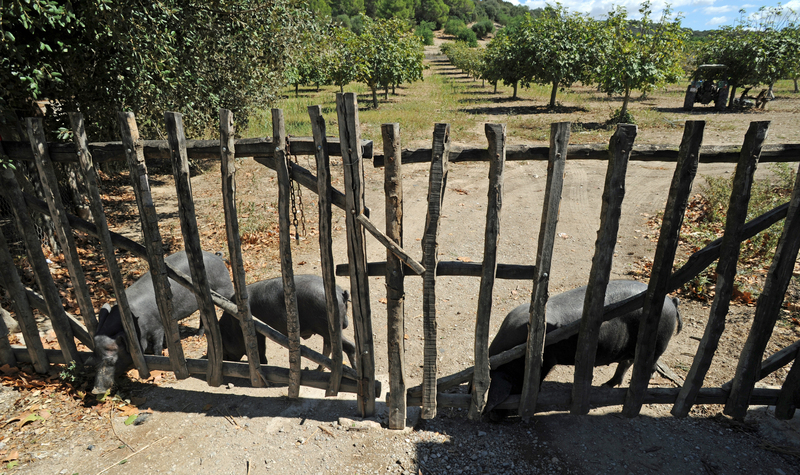 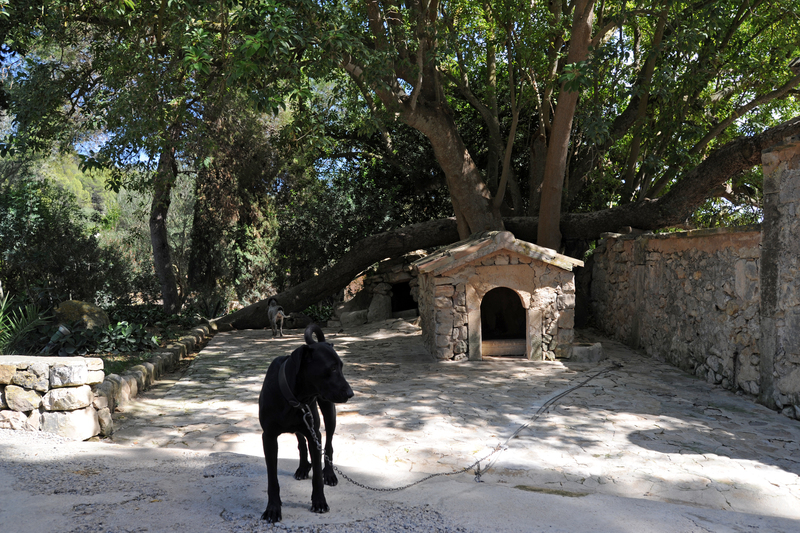 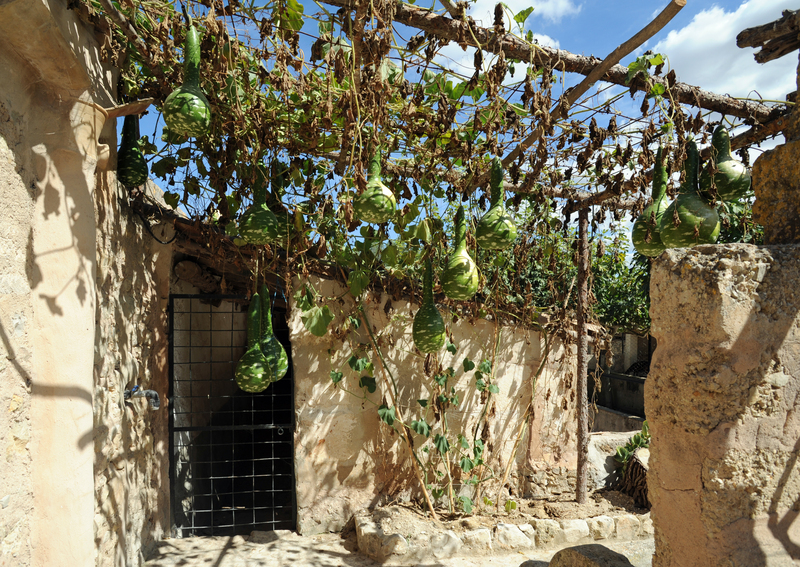 The finca also raises the famous black pig "porc negre", which is made ​​with spicy sausage of Mallorca, the sobrassada. 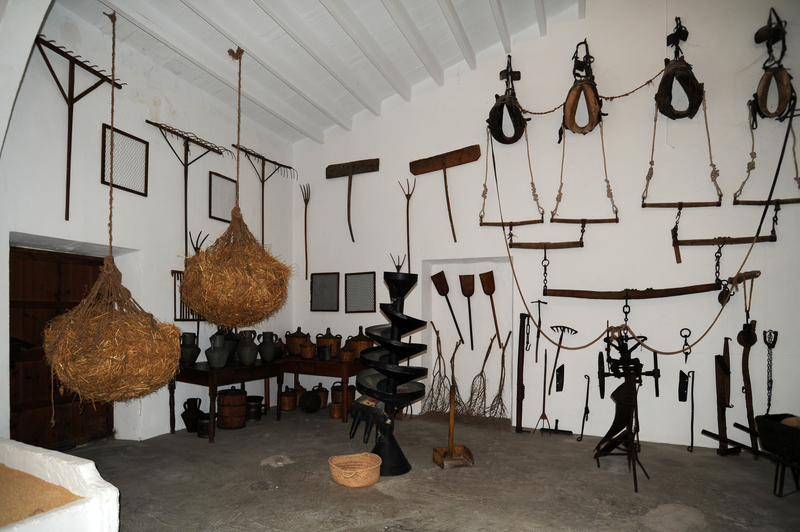 The shed of cars and accessories (taller de albardero). 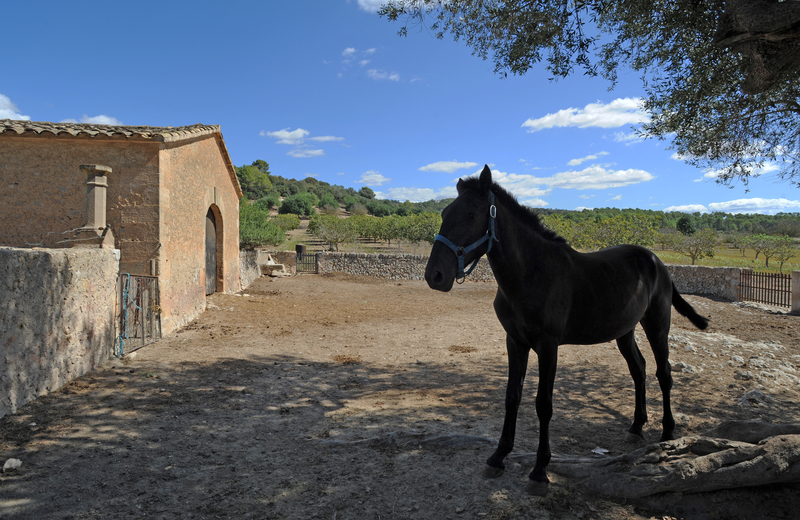 The history of the domain of Els Calderers goes back to 1285, it is mentioned under the name of the owner family, Calderers. 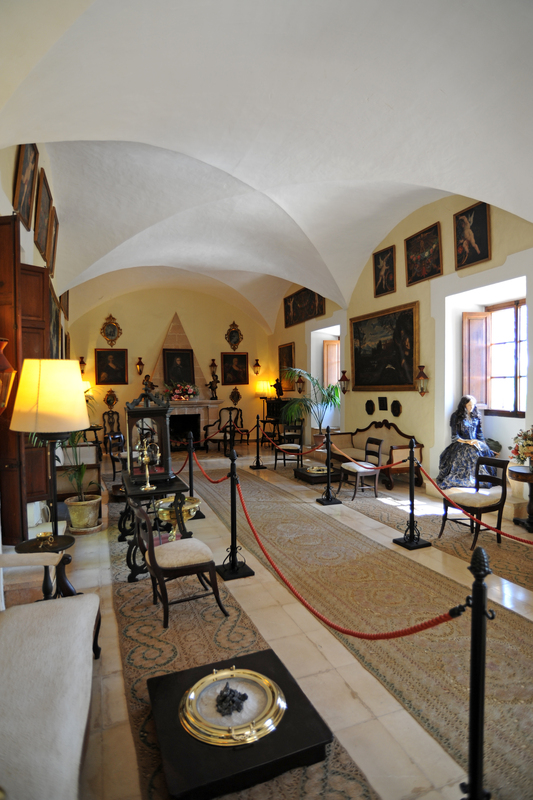 This "possessió of the eighteenth century is then passed into the hands of the ancient and noble family of Veri, who built in 1750, the stately manor that we see today. 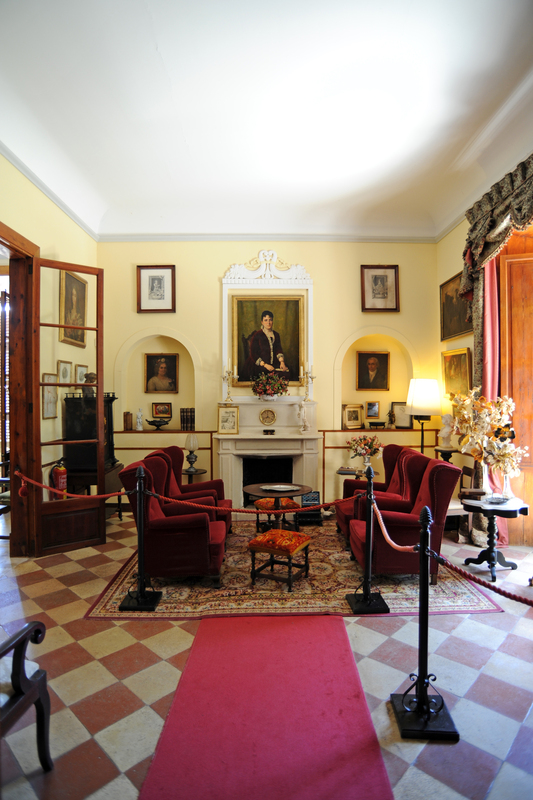 Summer hours (April 1 to October 31): daily, from 10:00 to 18:00. 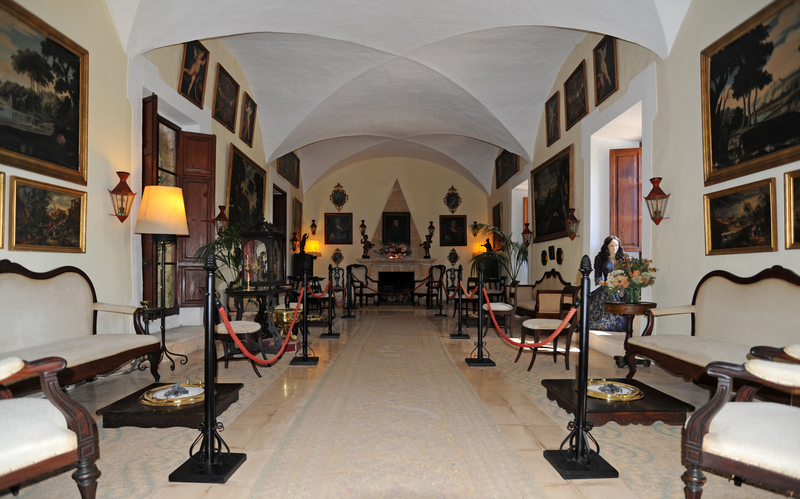 Winter hours (November 1 to March 31): daily, from 10:00 to 17:00. 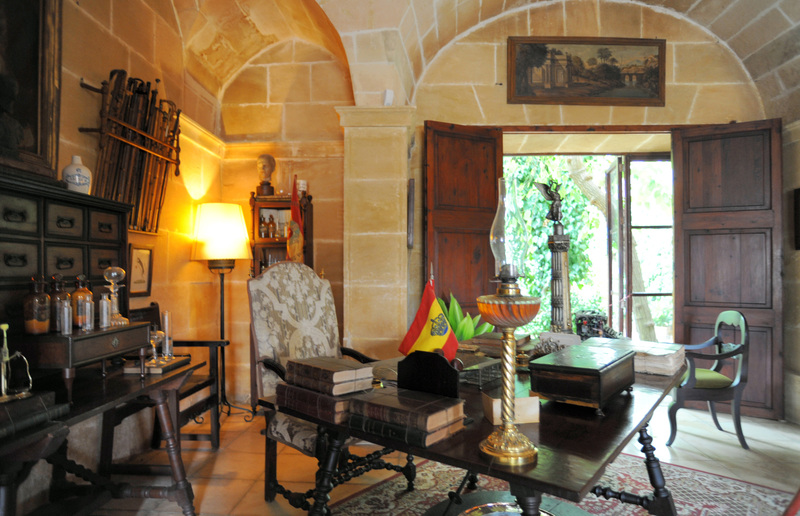 Phone: 00 34 971 526 069. 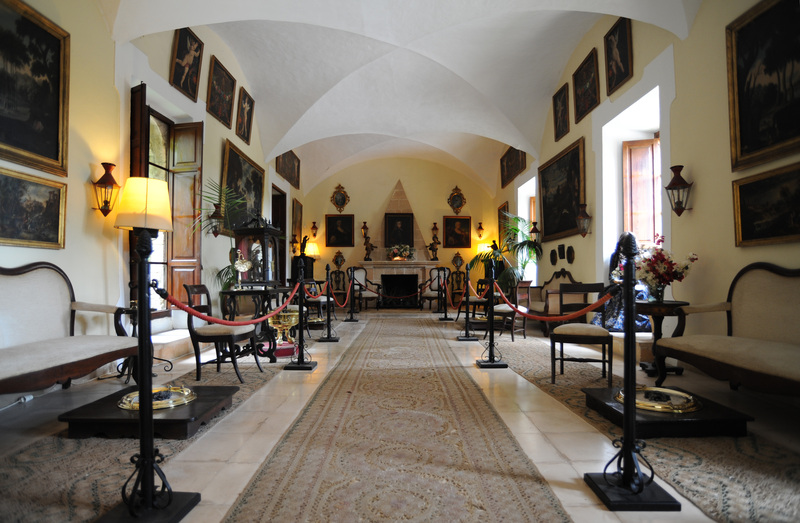 Entry fee: Adults € 8, children € 4. 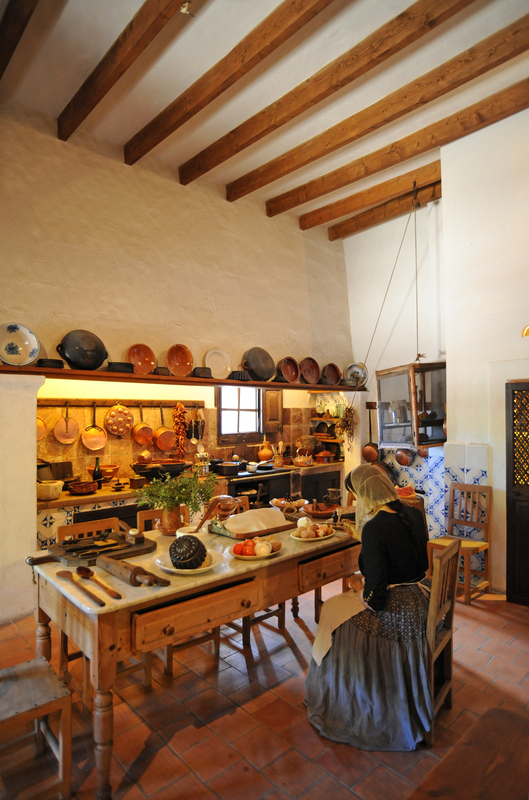 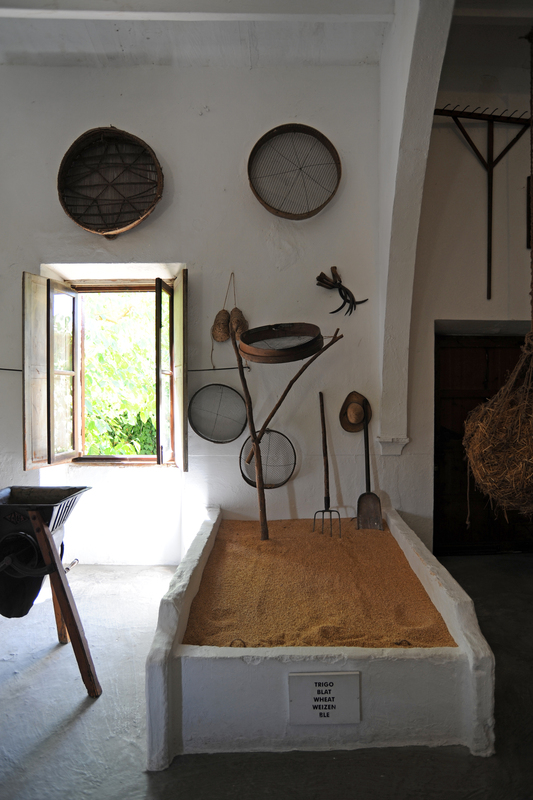 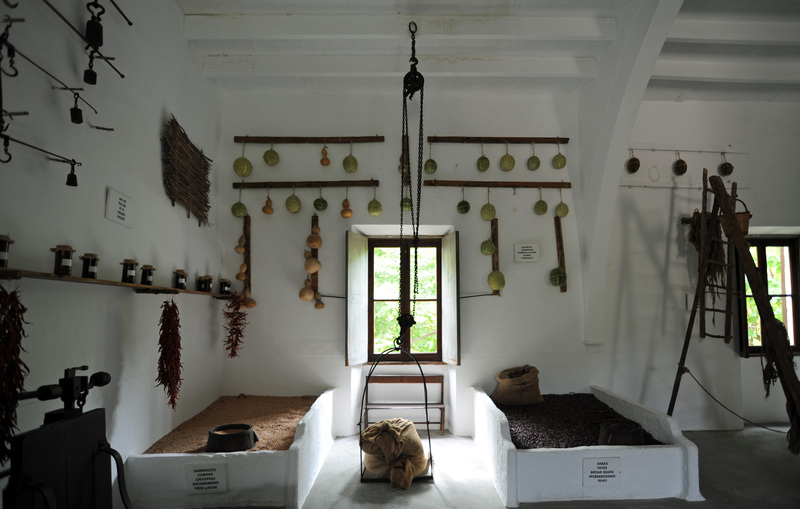 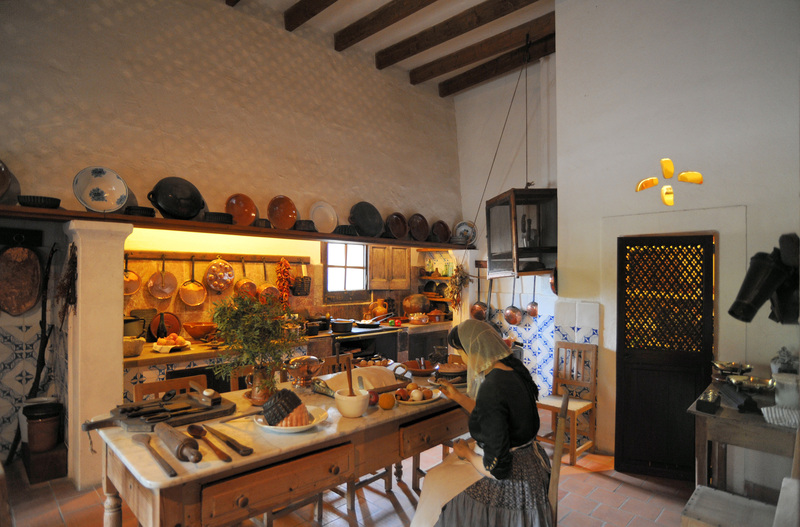 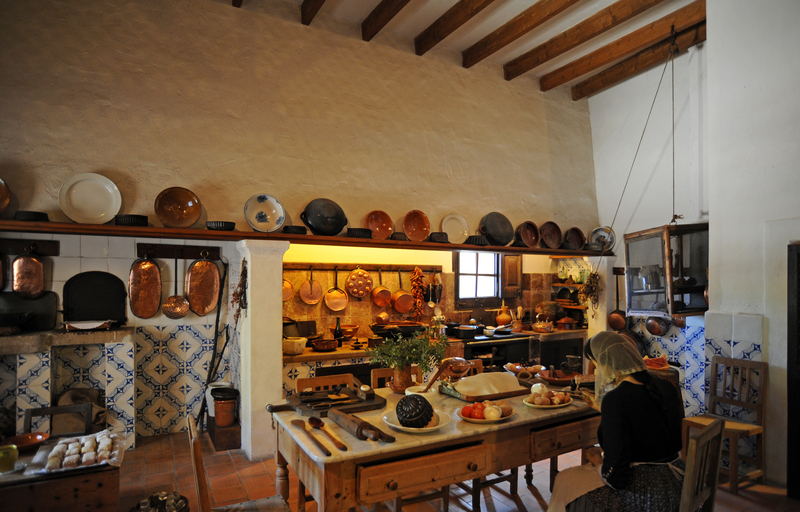 After the tour, visitors are offered the delicious house specialties prepared in the traditional Majorcan style. 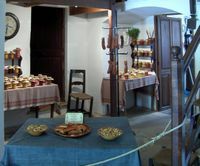 Among other things, you can try to "sobrassada" (spicy sausage), to wine, jams and honey.